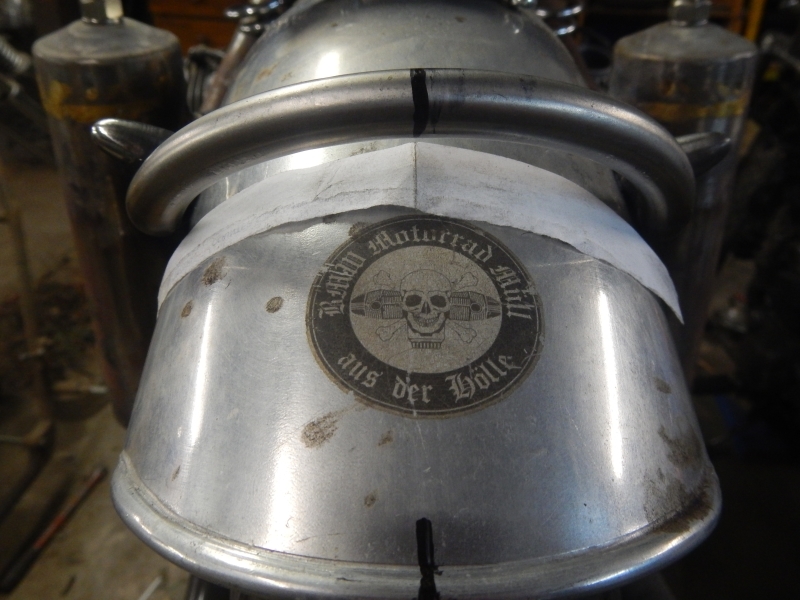 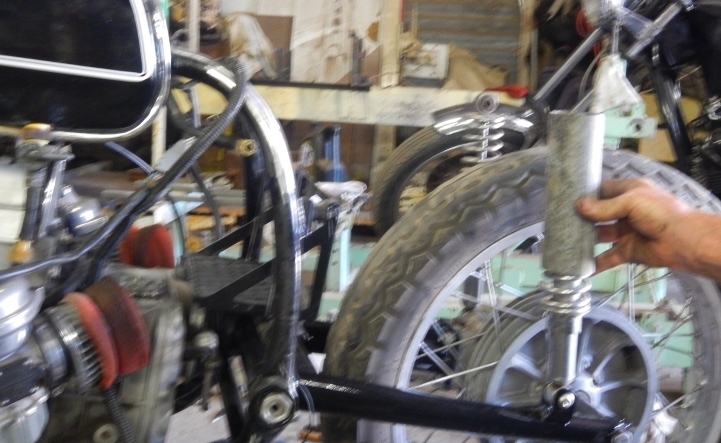 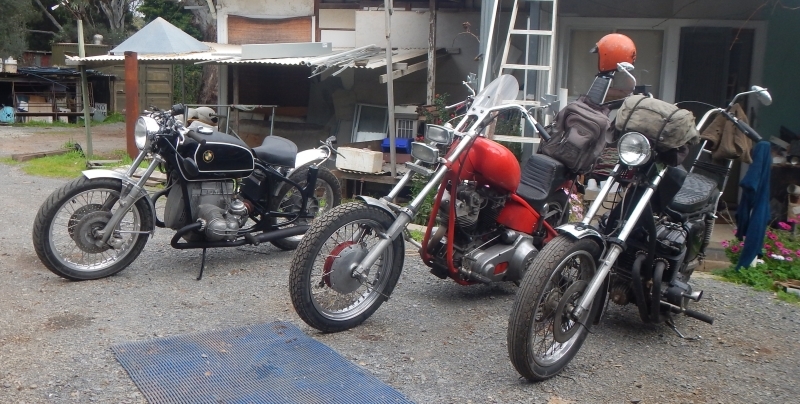 My workshop is getting full of projects, so to work on his bike I have to roll out three choppers each morning. 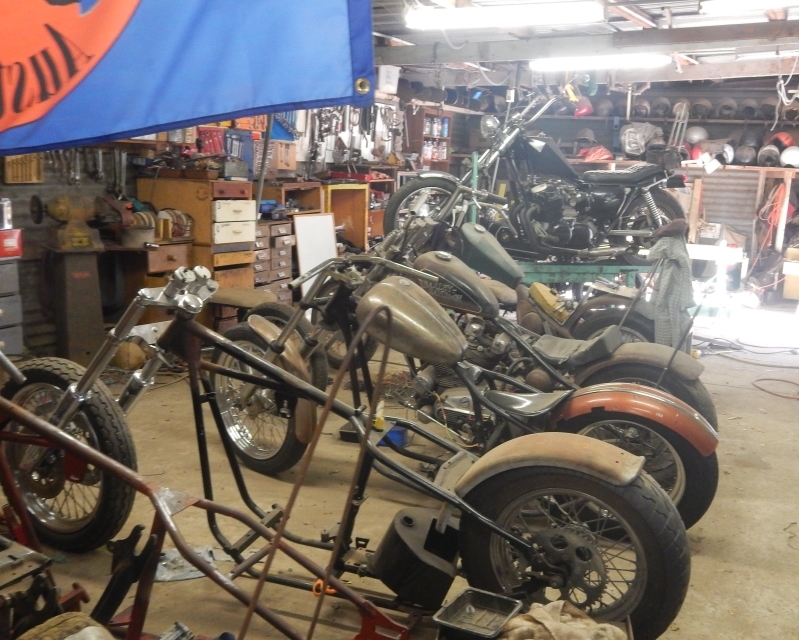 Missing in the foreground is Stu's KZ1100 which I hope he will get to work on again soon, red rigid frame is recently purchased shovel frame for which I have everything to make a righteous chopper, next is Rob's shovel roller (I'm waiting for him to have some time to get down to continue on it). 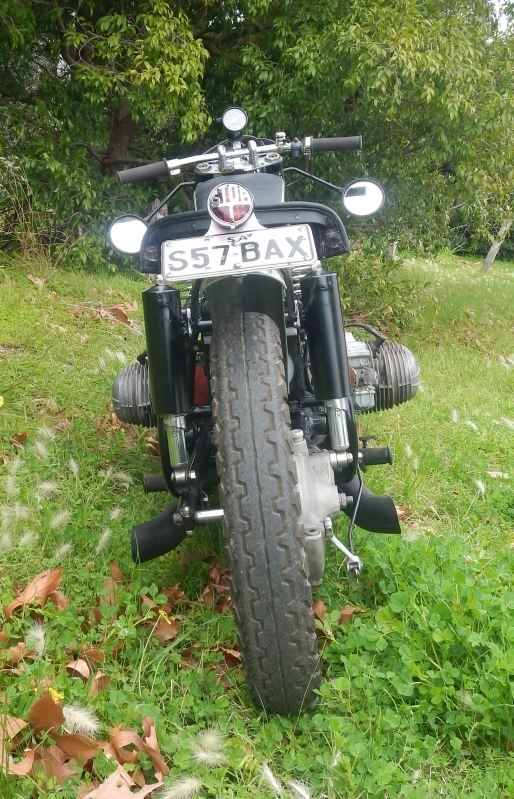 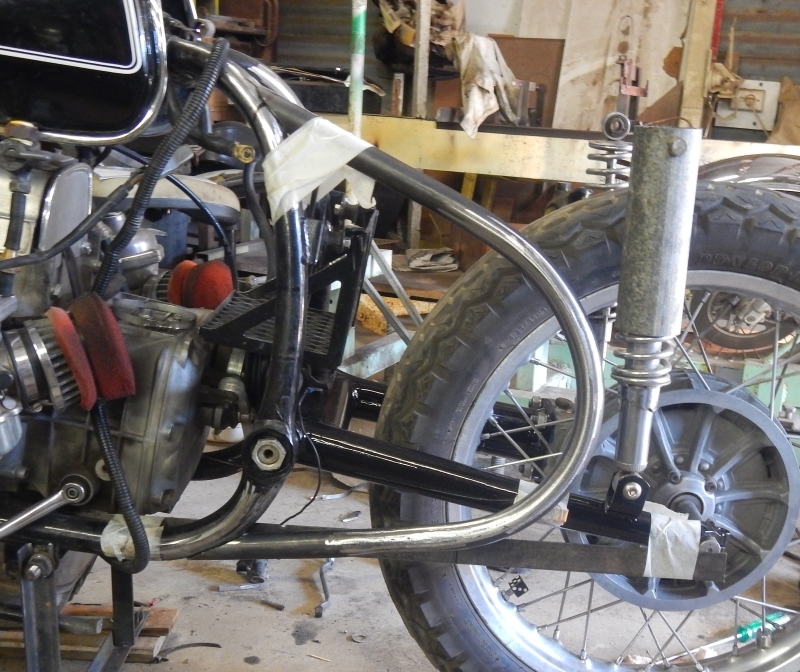 Next is rather interesting... a BSA frame with agrafted in HD hardtail, I converted the steering head to accept HD bearings and it now has an HD narrow glide. 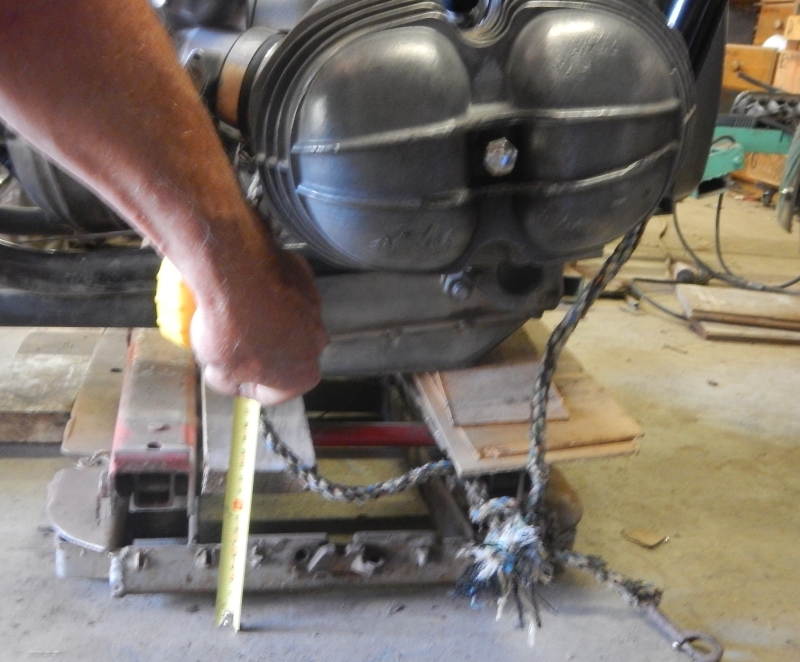 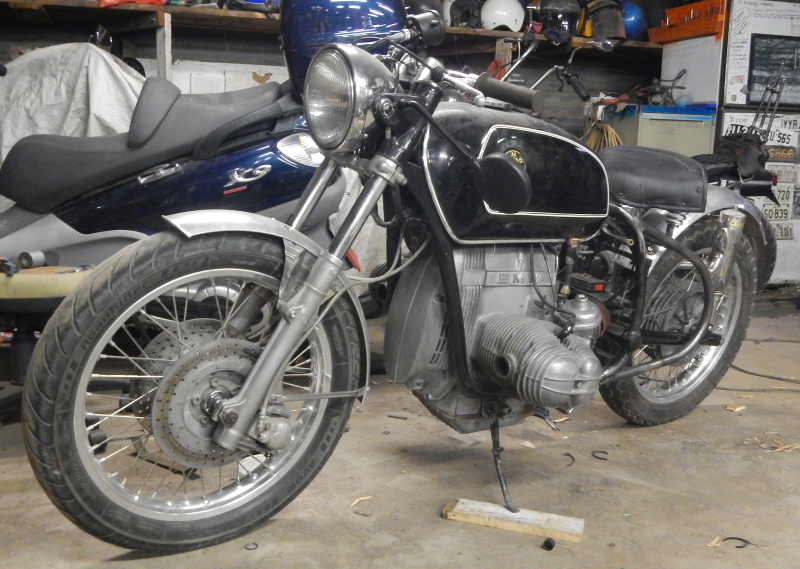 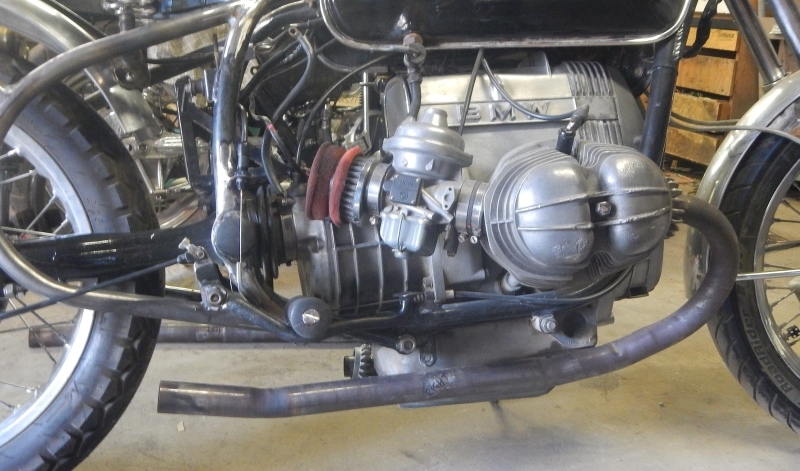 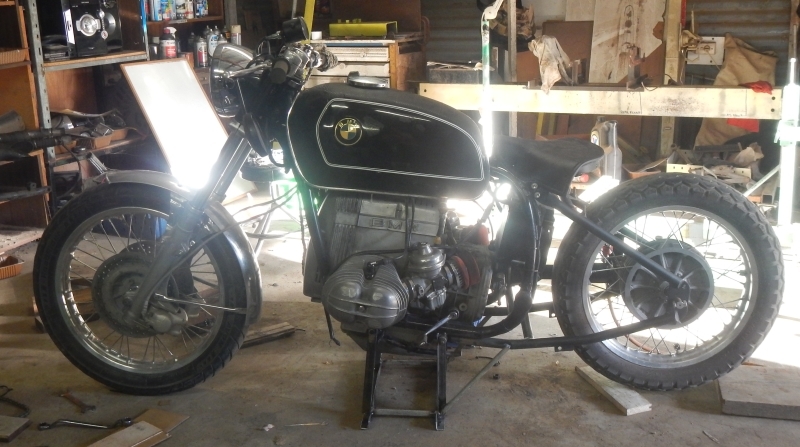 Motor for it is under the rags; an XS500! 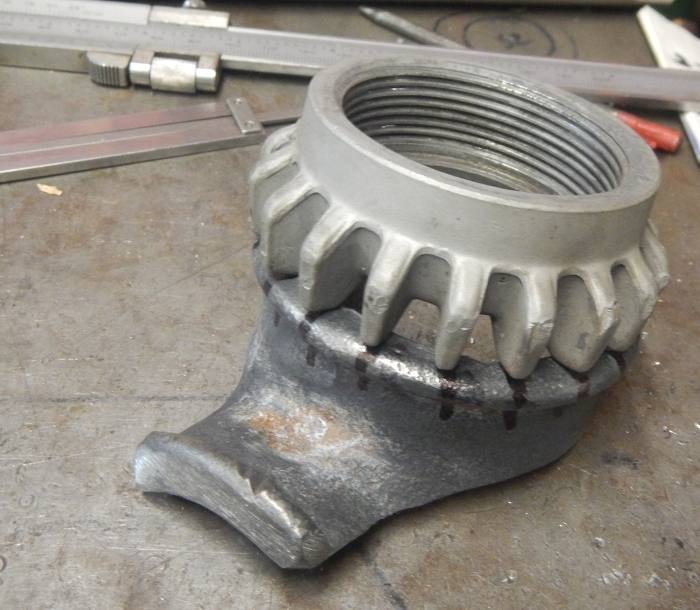 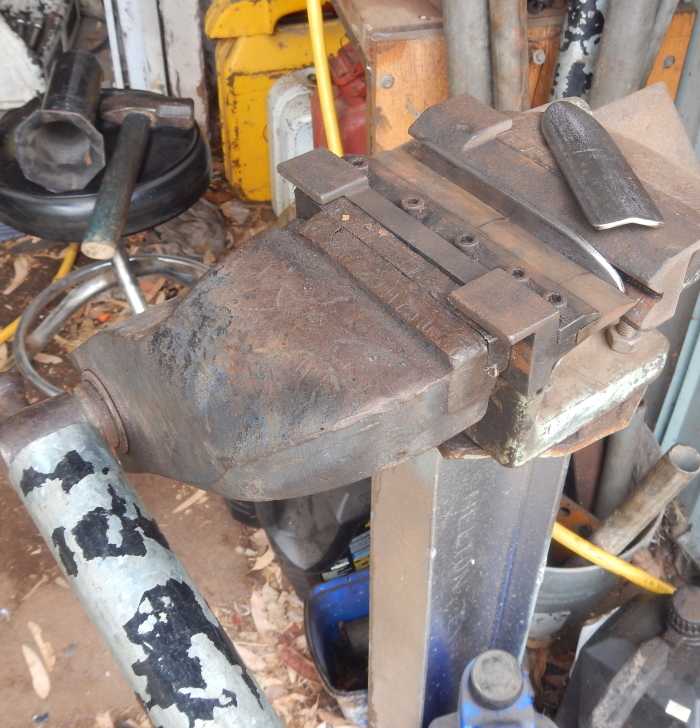 Next project in the lineup is another Rob's iron head that again is waiting its owner to have some time to work on it with me. 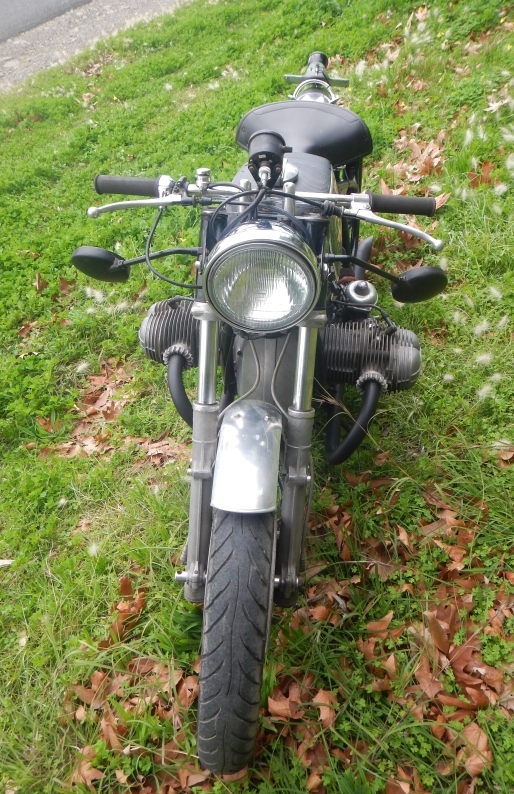 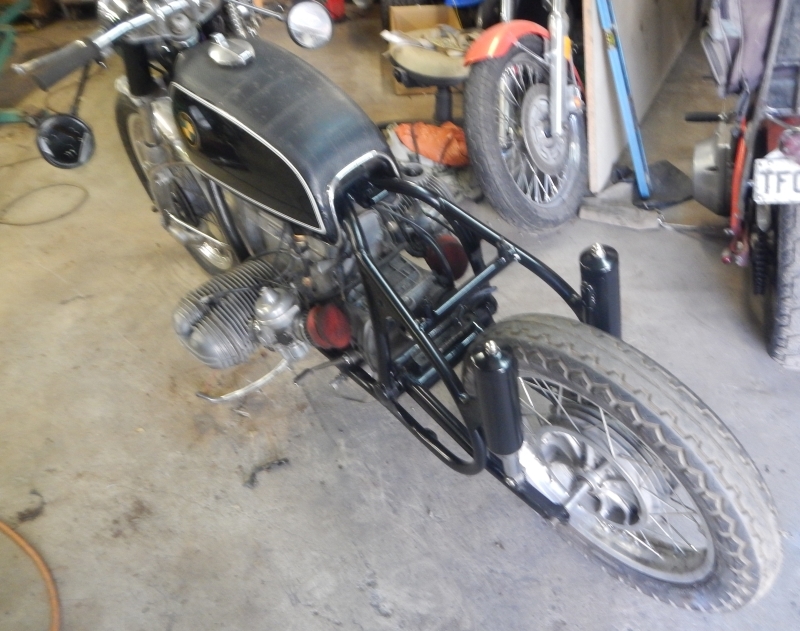 Next is my CB750 project that has gone nowhere for a couple of years but I live in hope! 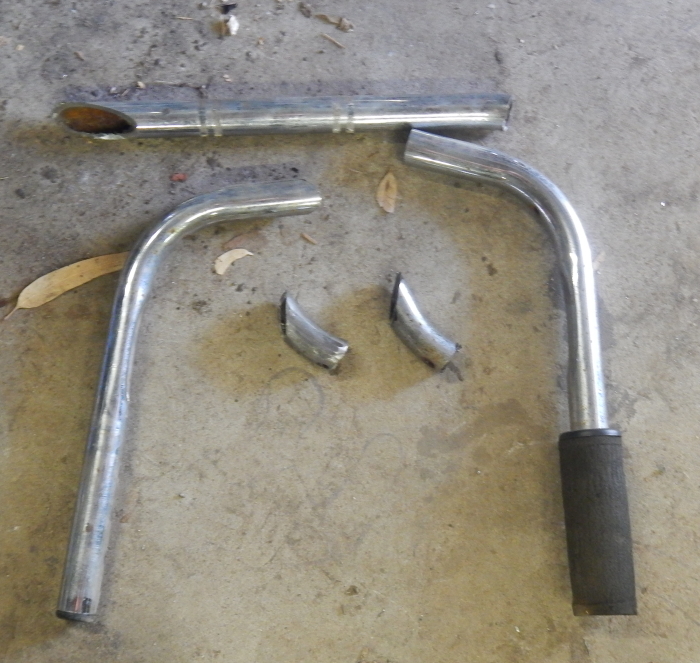 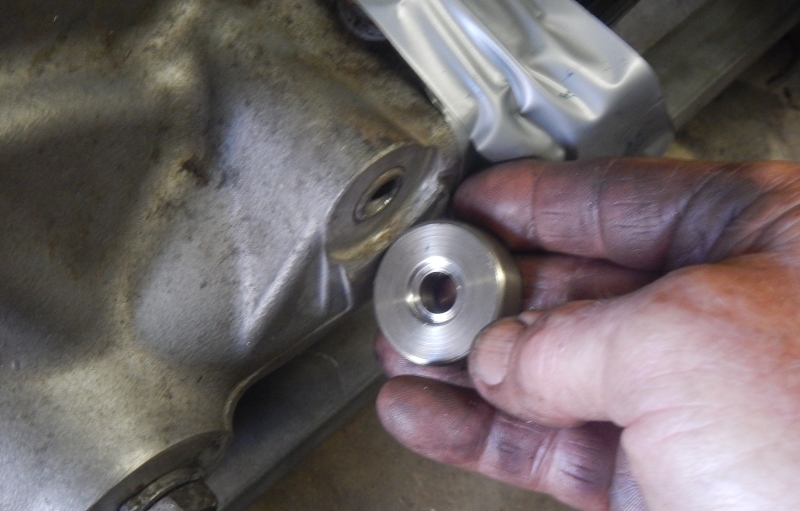 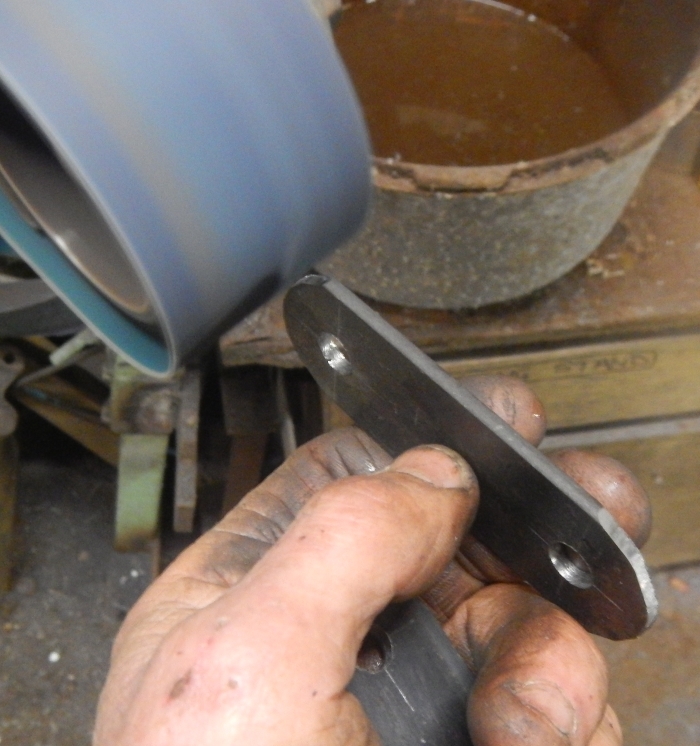 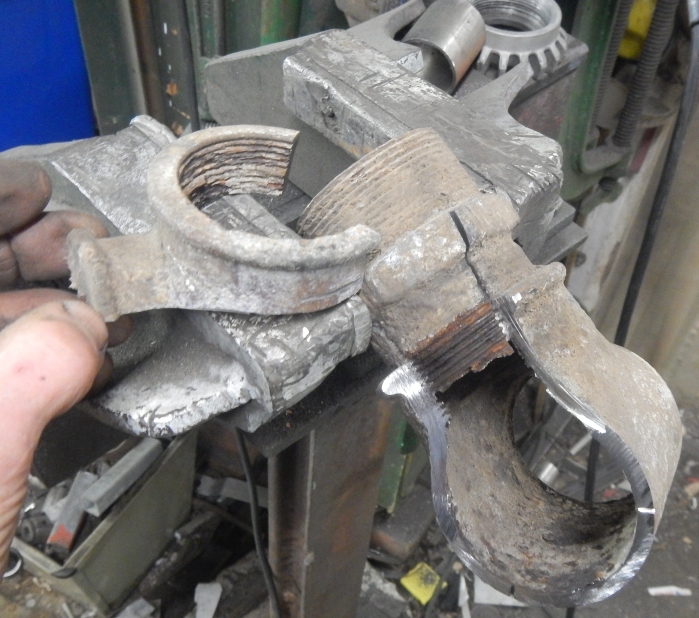 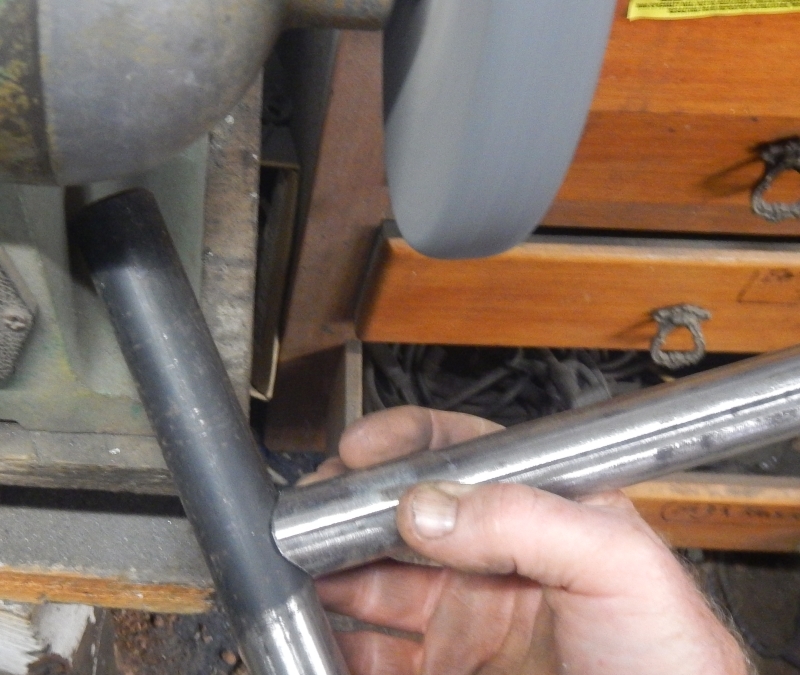 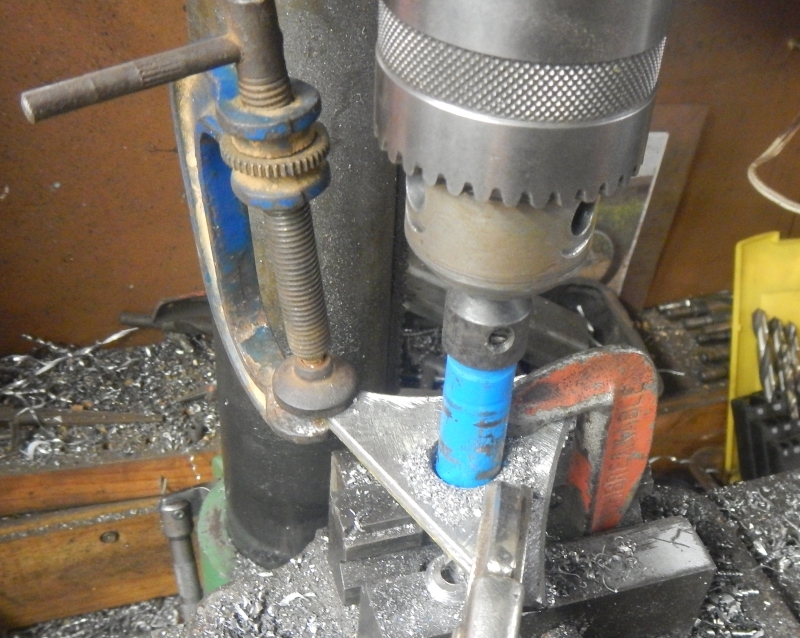 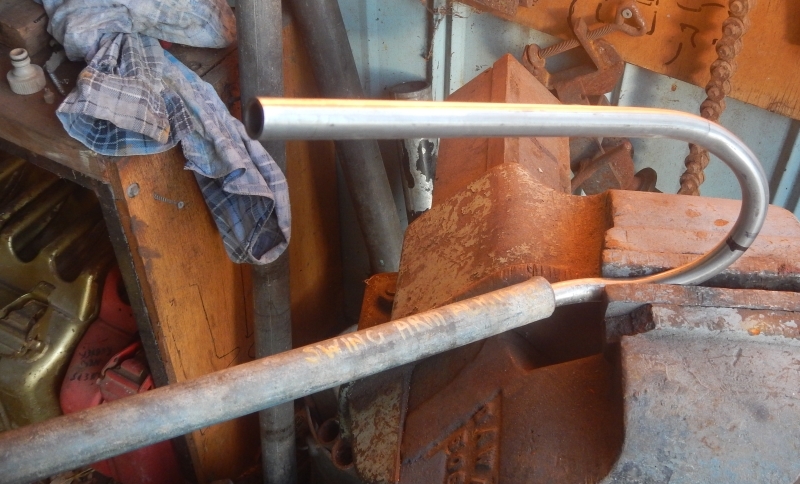 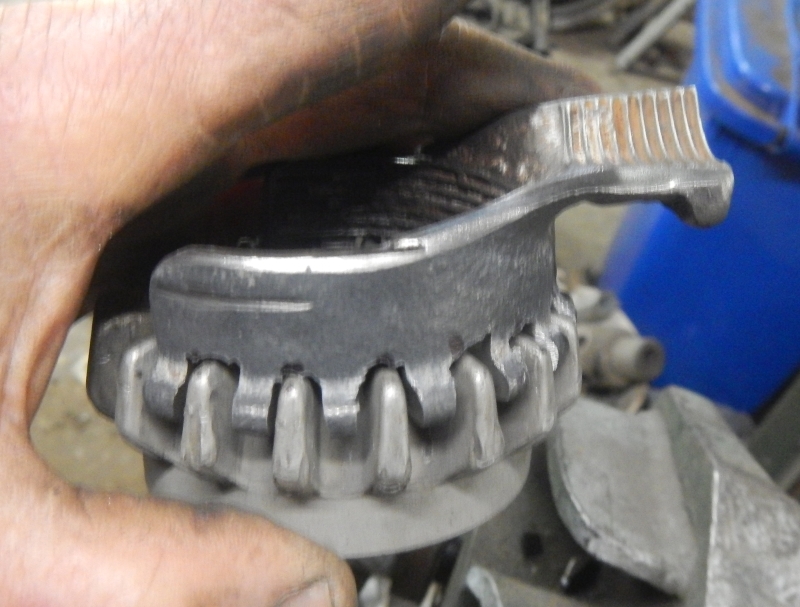 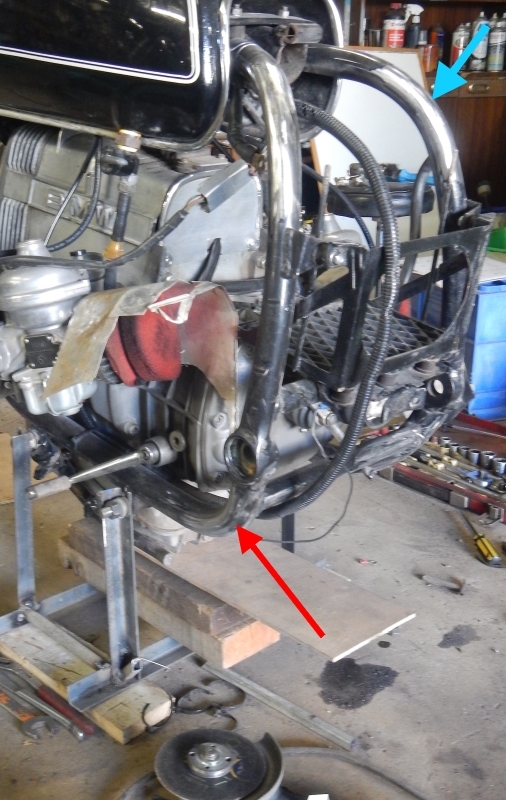 Today, I took out the drive shaft housing and this afternoon, took the new swing arm and old shaft housing to Lonsdale (Lee McPeake Engineering) to have the shaft pressed out and put into the new swingarm. 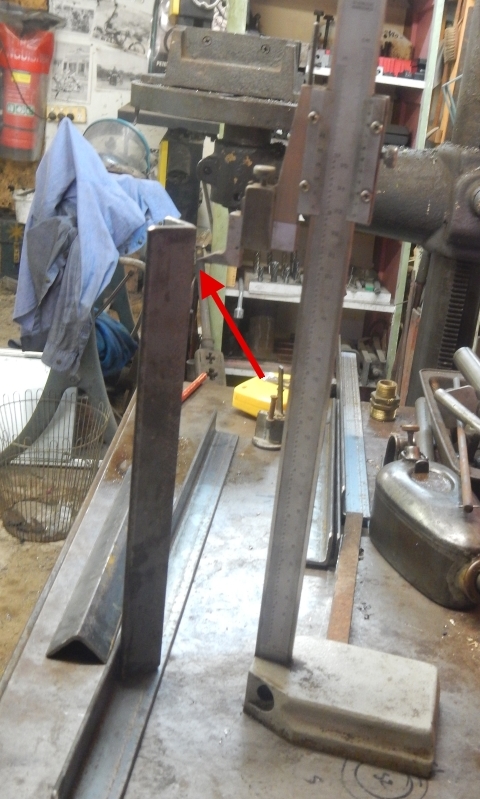 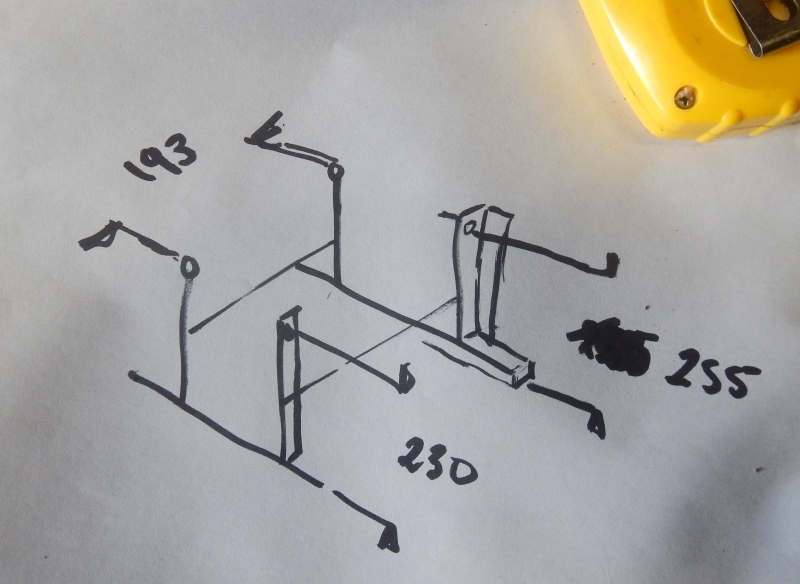 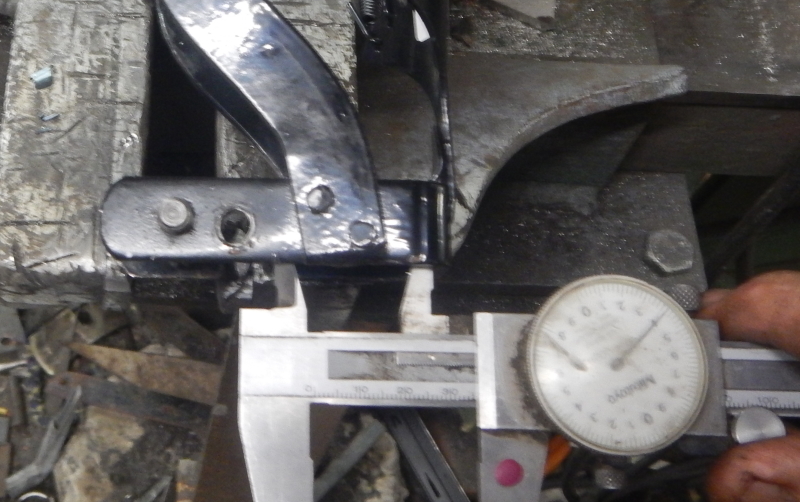 Next job is to assemble swing arm to bike and check the swing arm angle against requirements to see if my measurements to date are correct. 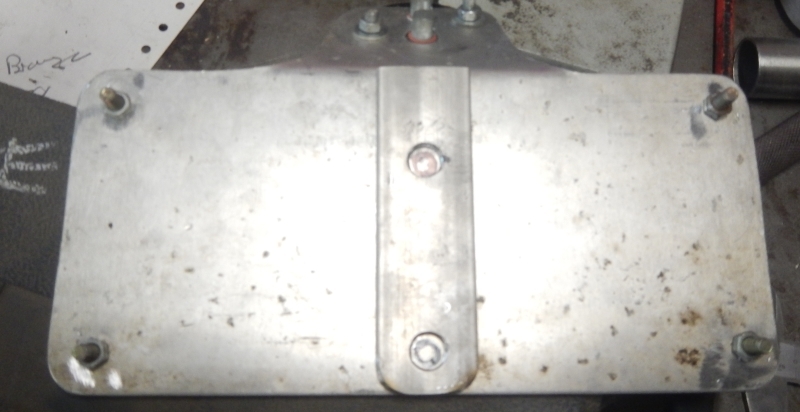 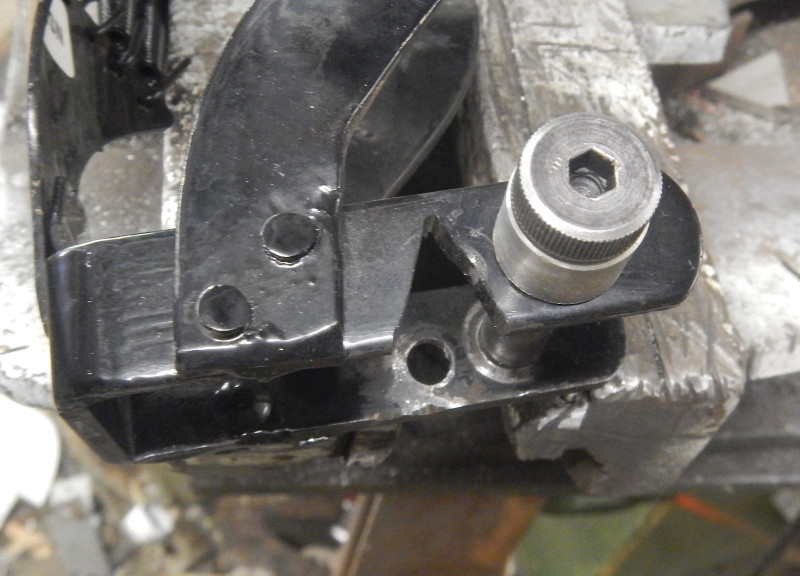 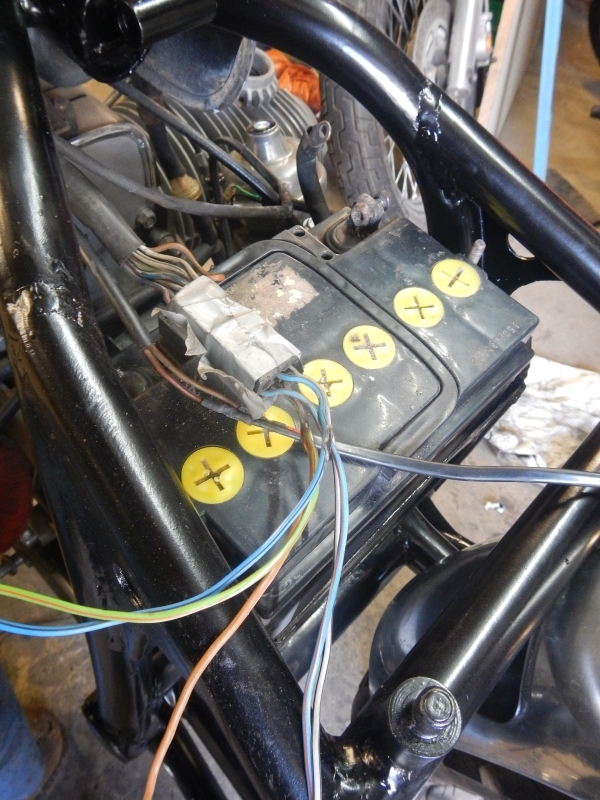 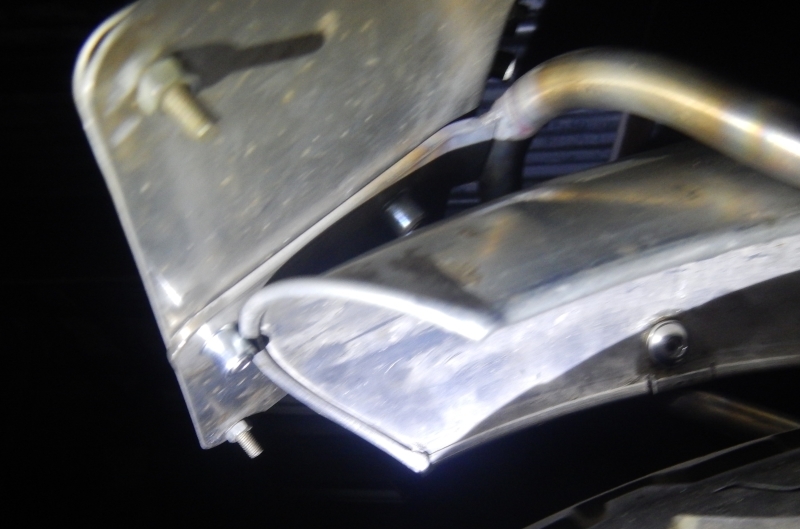 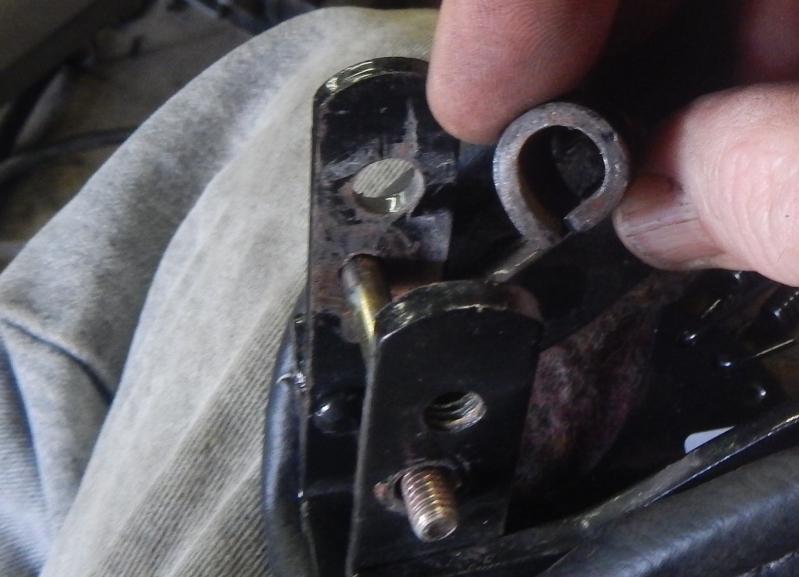 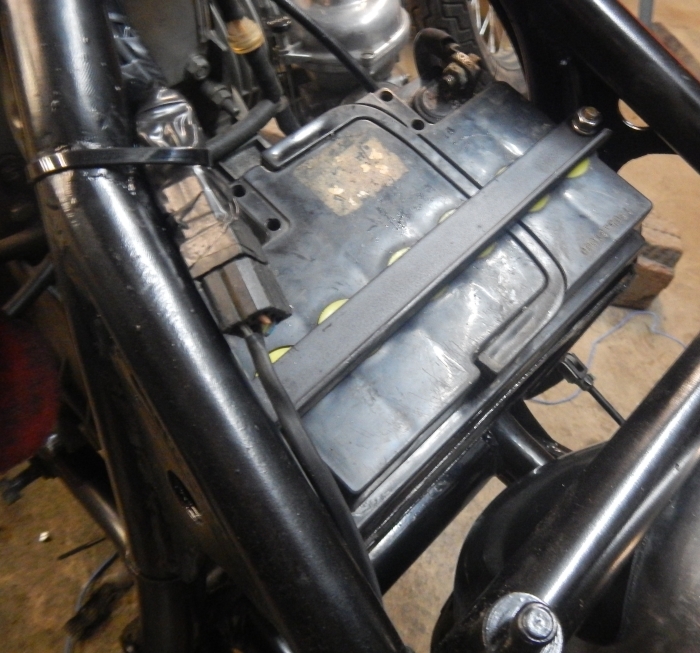 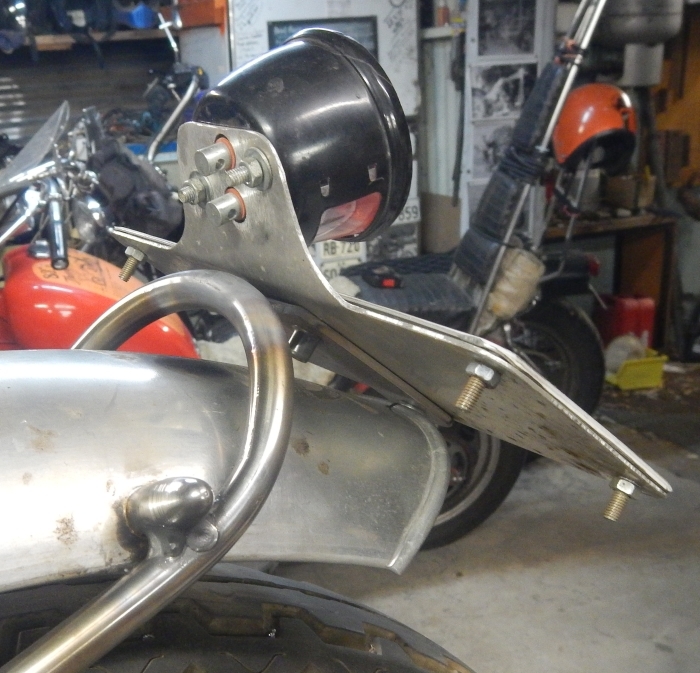 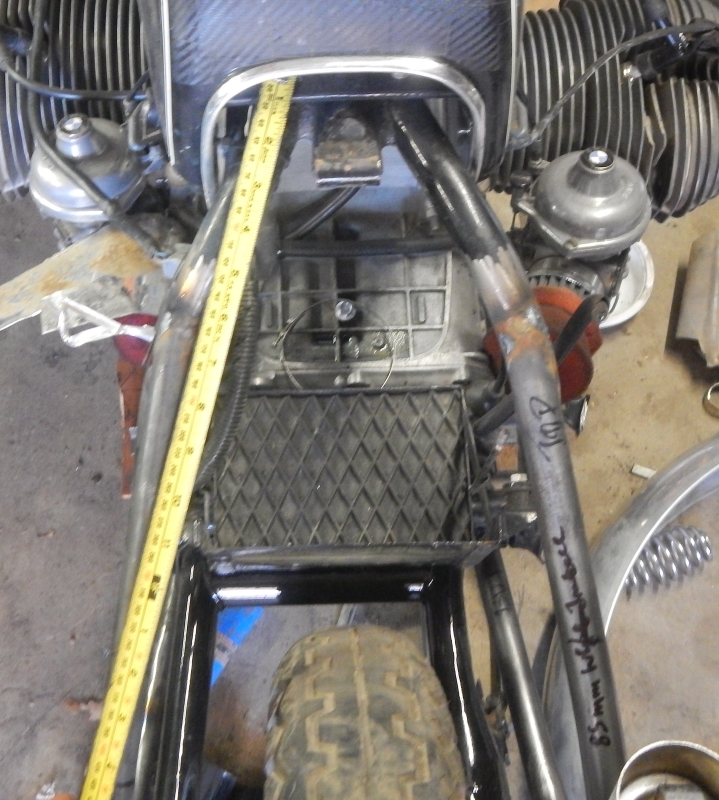 Hard tail now removed and engine mount needs re spacering with the hard tail tab now gone. 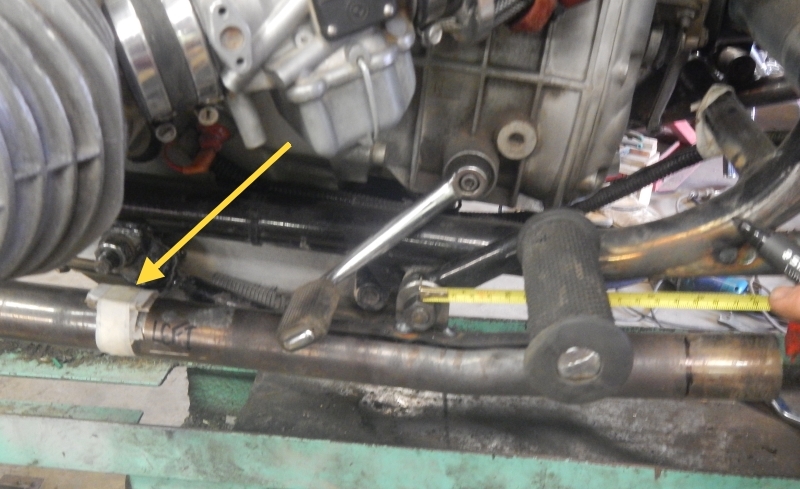 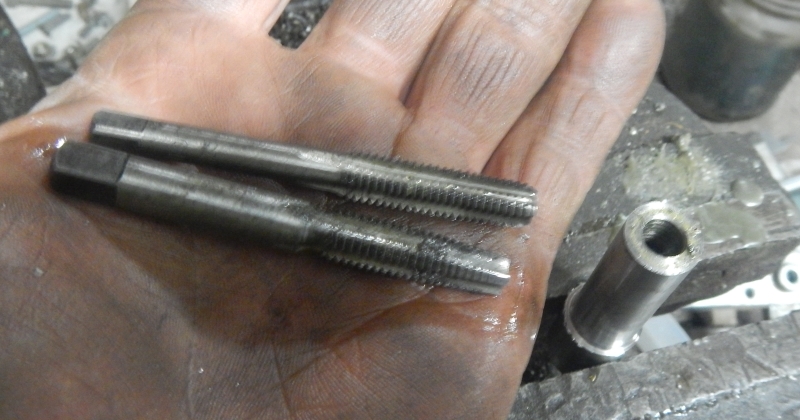 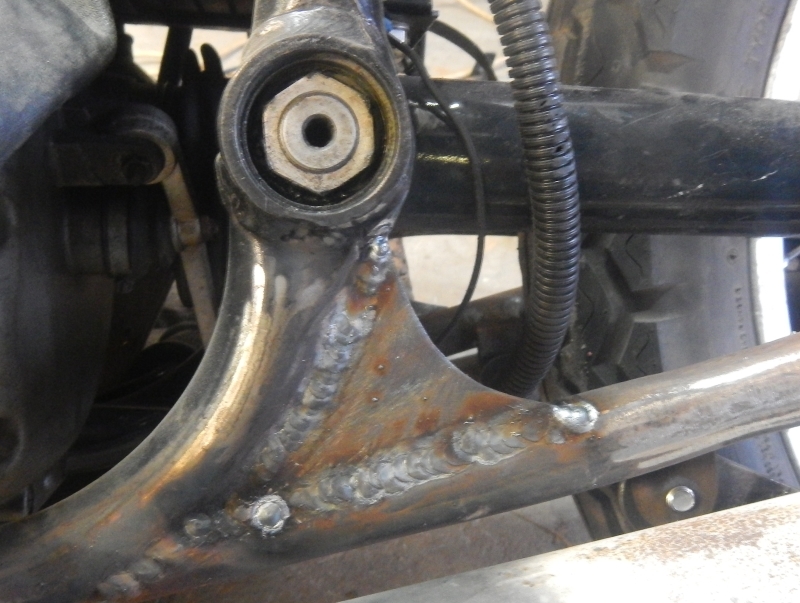 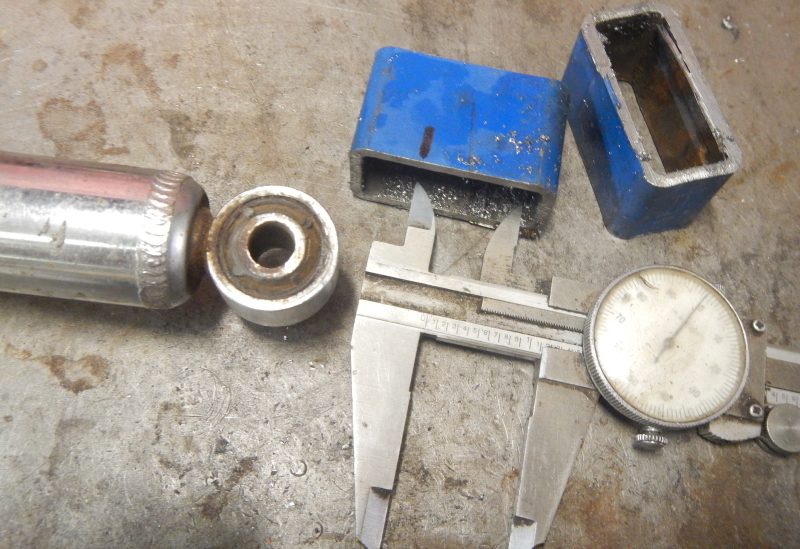 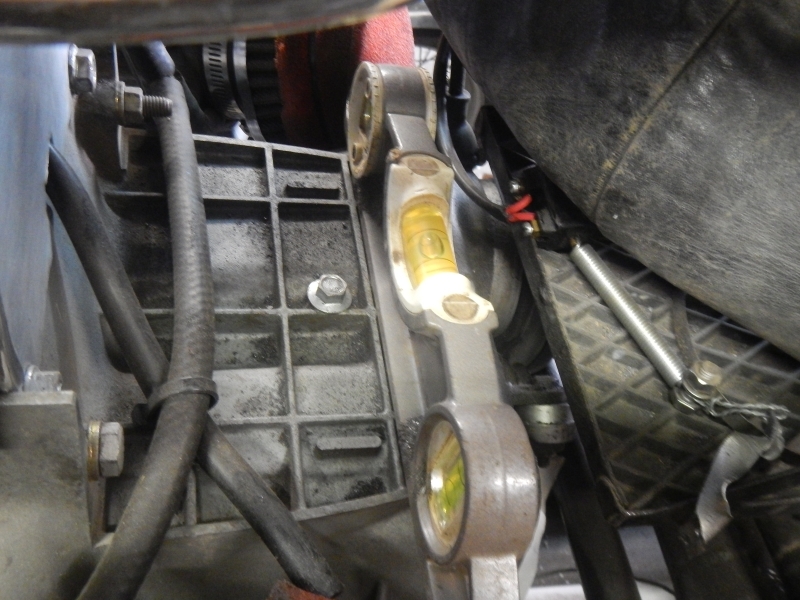 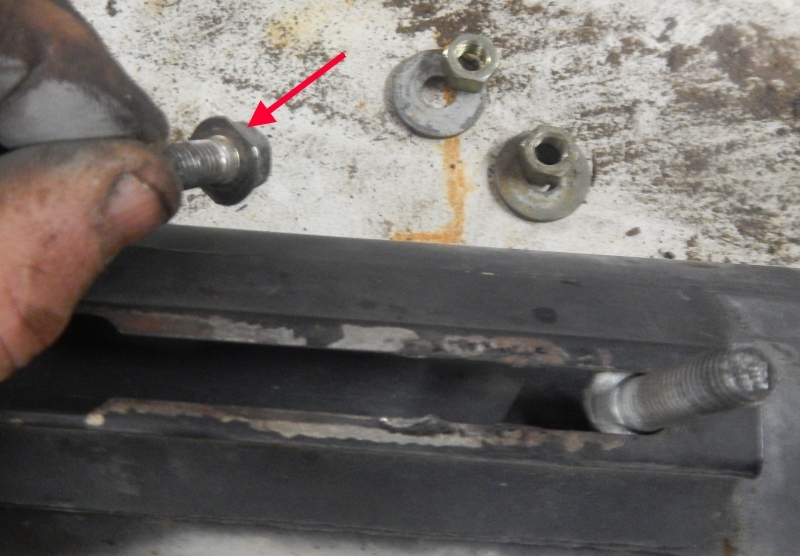 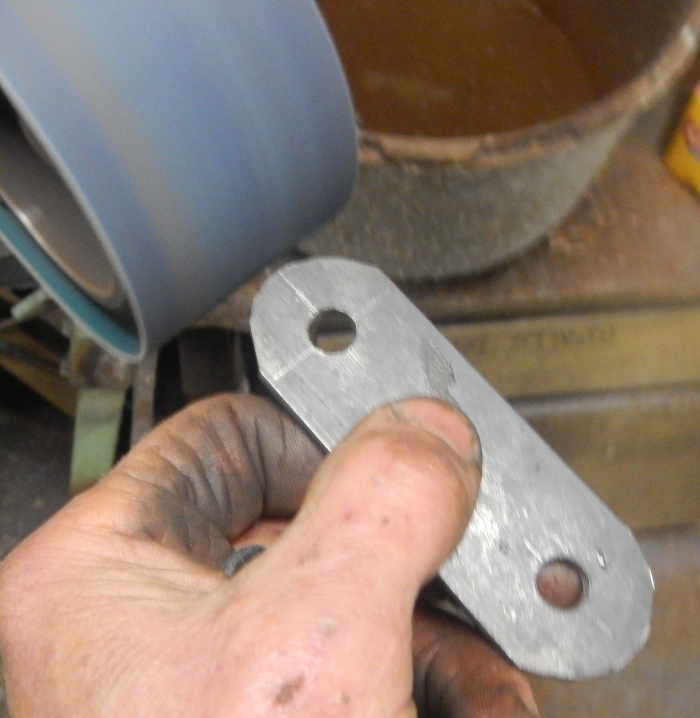 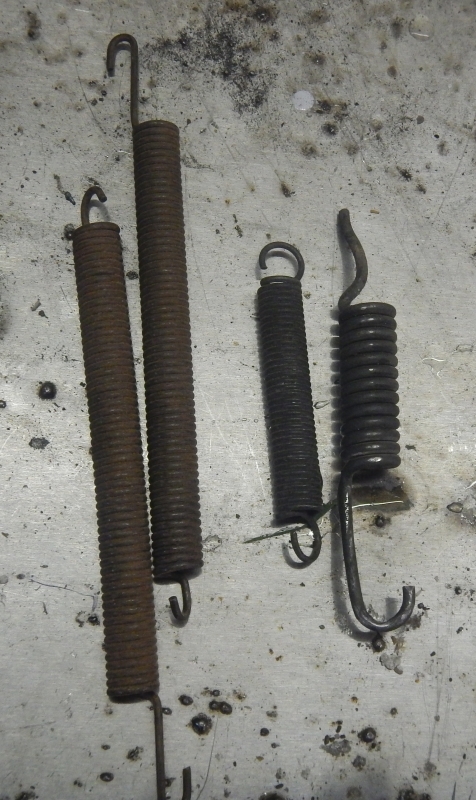 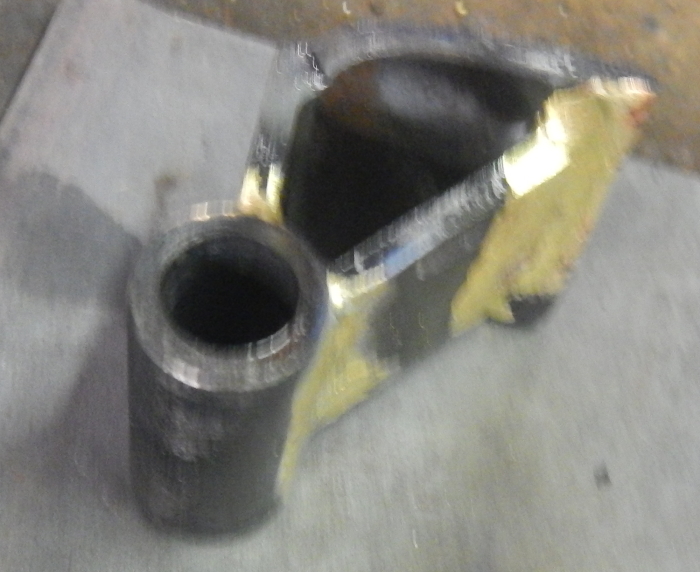 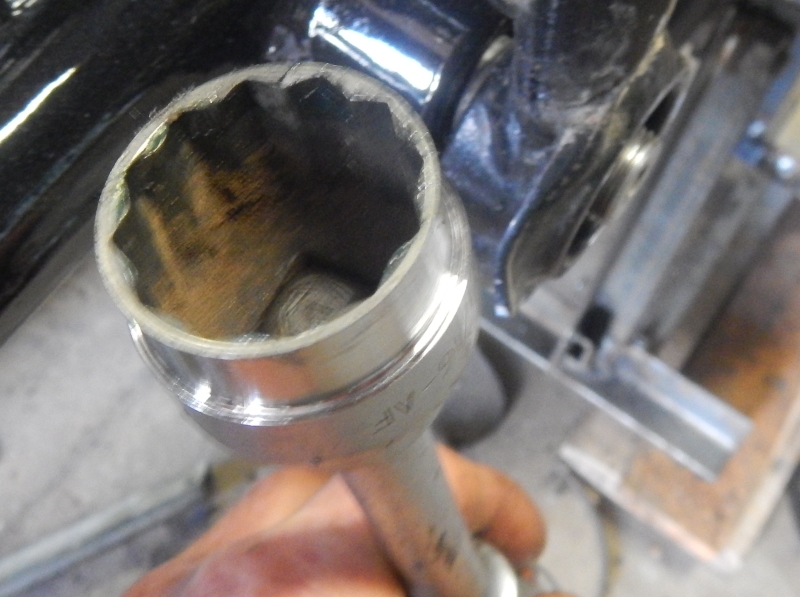 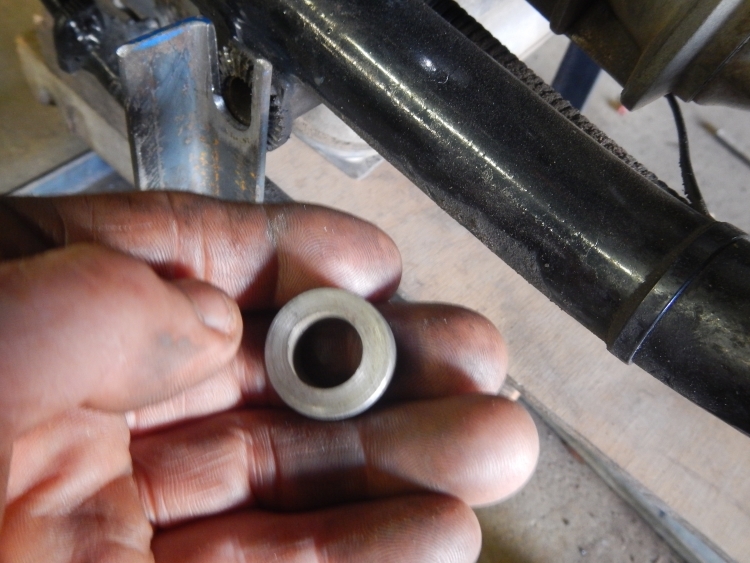 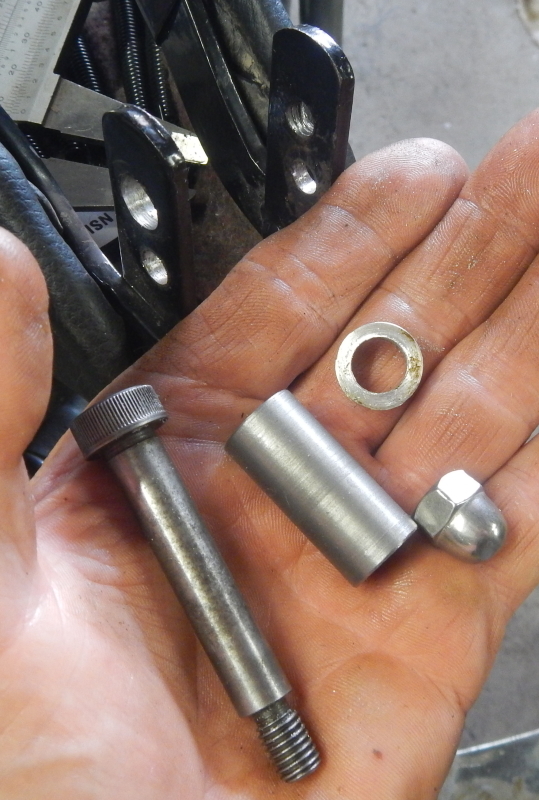 Spacer that was on left fits rhs perfectly, so just one to be machined up for the left side..
Wednesday should see the second subframe tube bent and fitted. 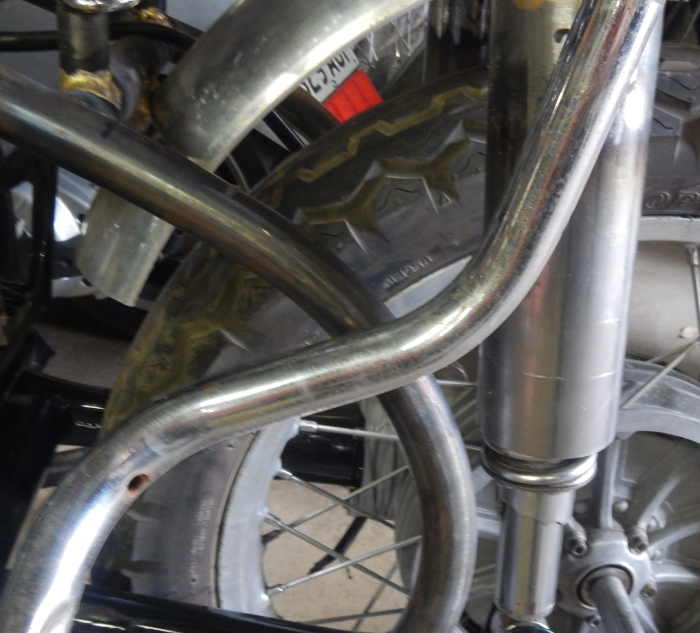 The extra challenge is for it to conform in all ways to the first. 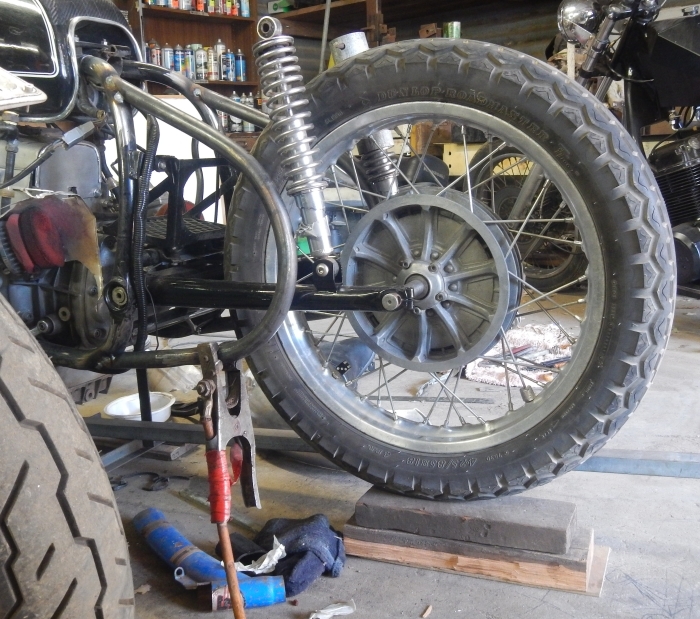 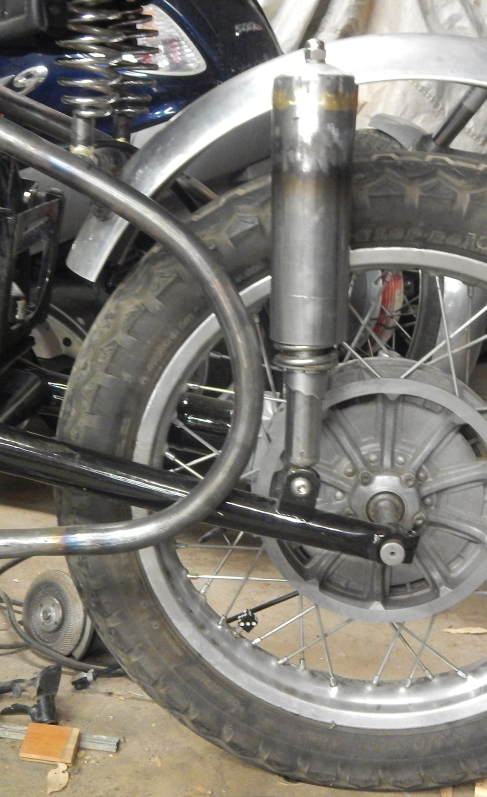 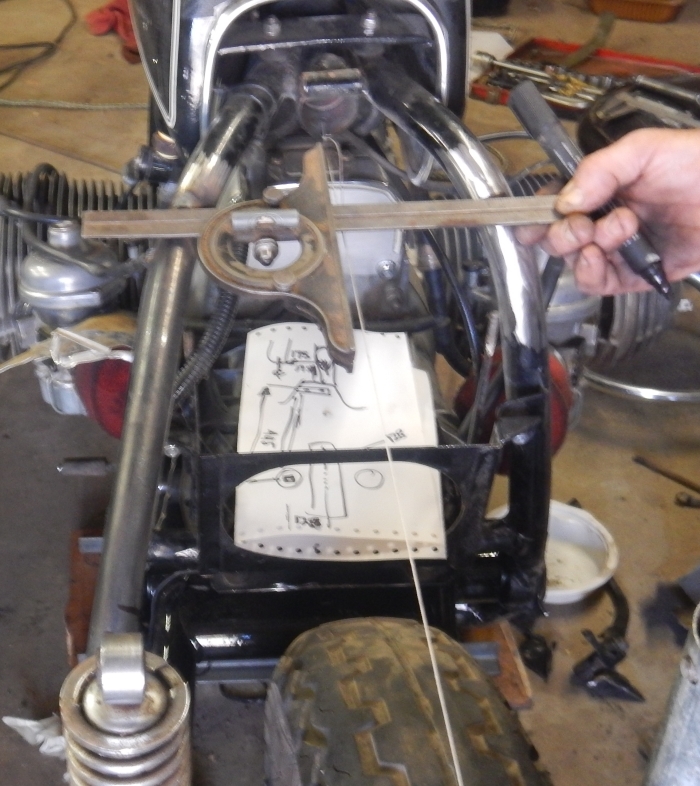 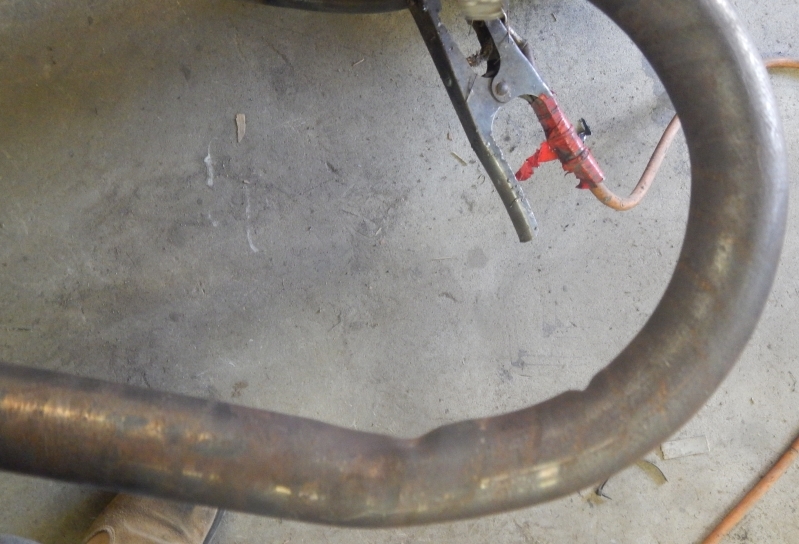 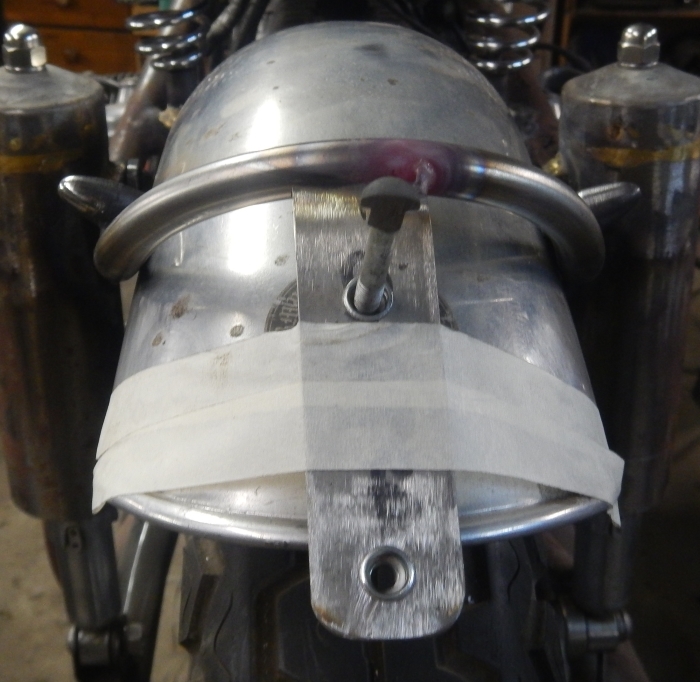 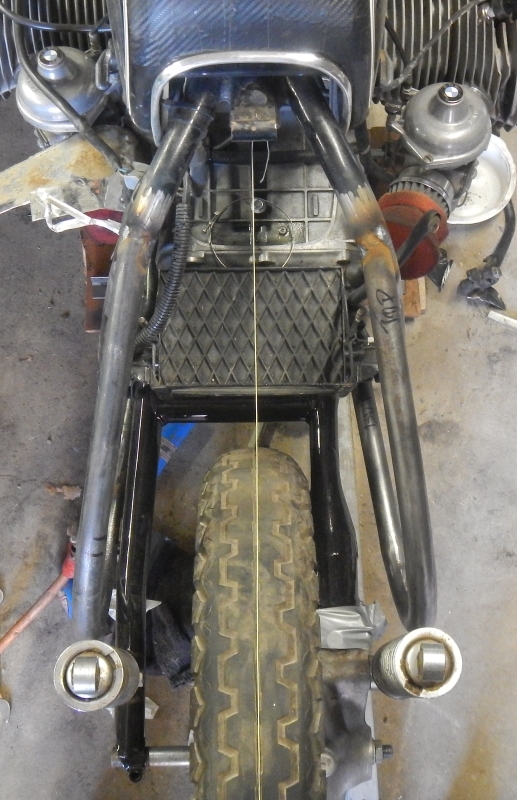 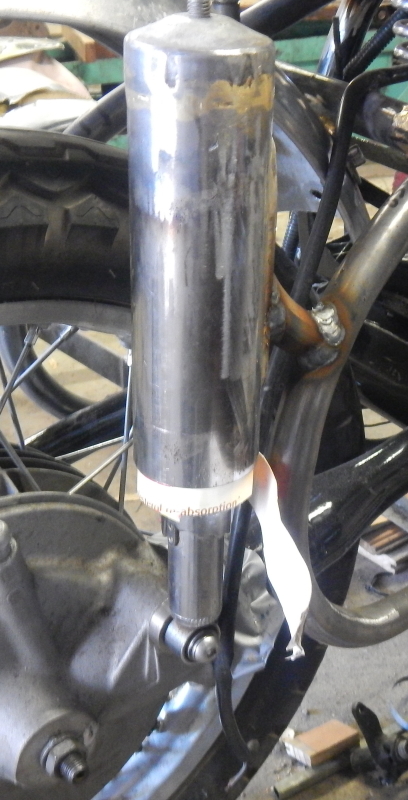 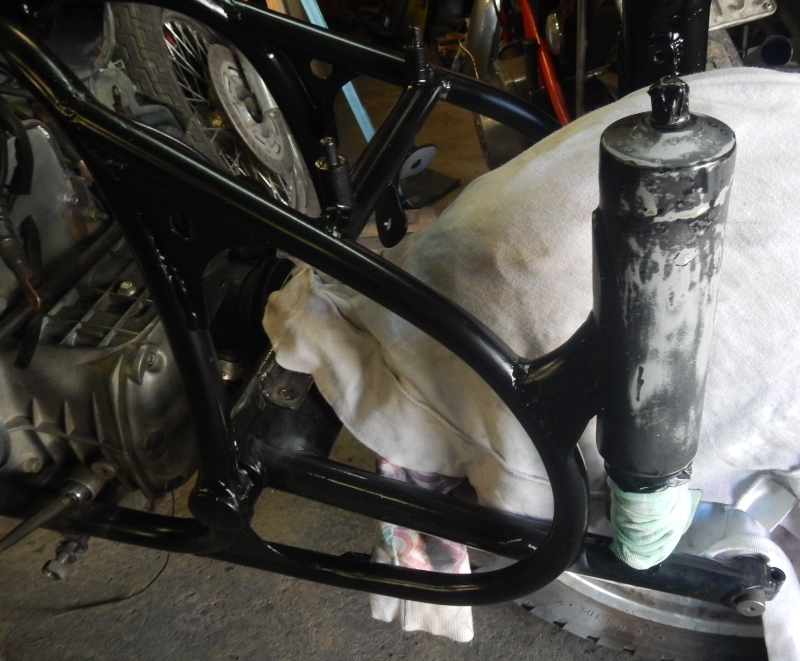 After that we can tack the two tubes and then add in cross bracing and guard, seat and exhaust mounts. 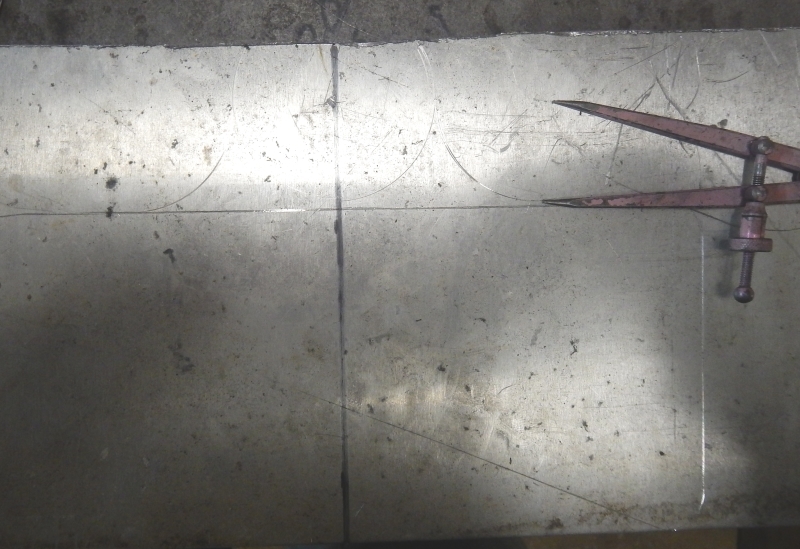 Measuring up the distance from the centre line reveals a couple of things. 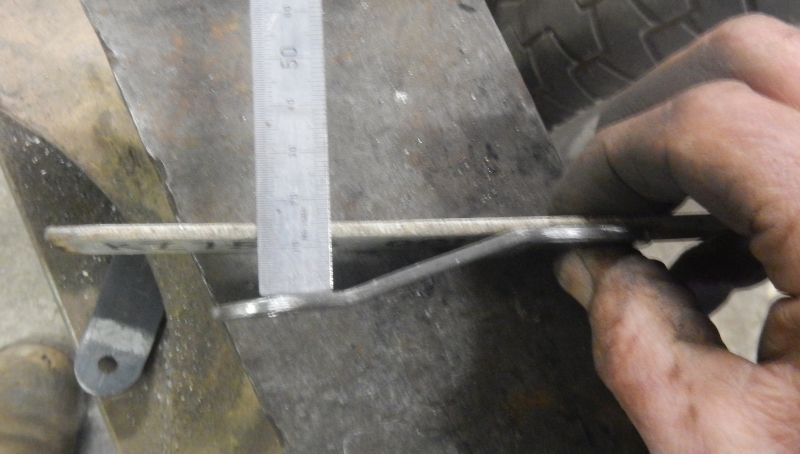 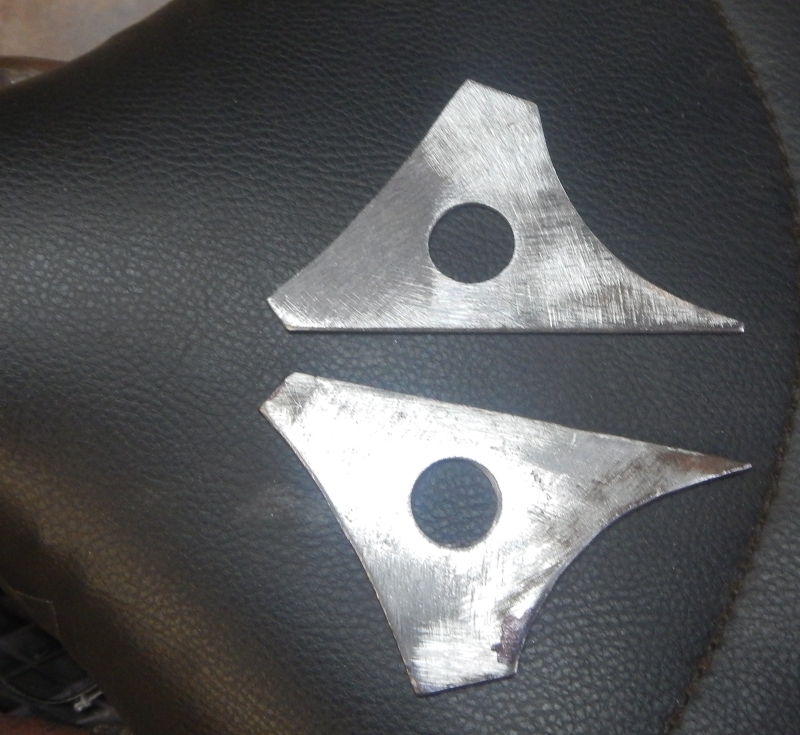 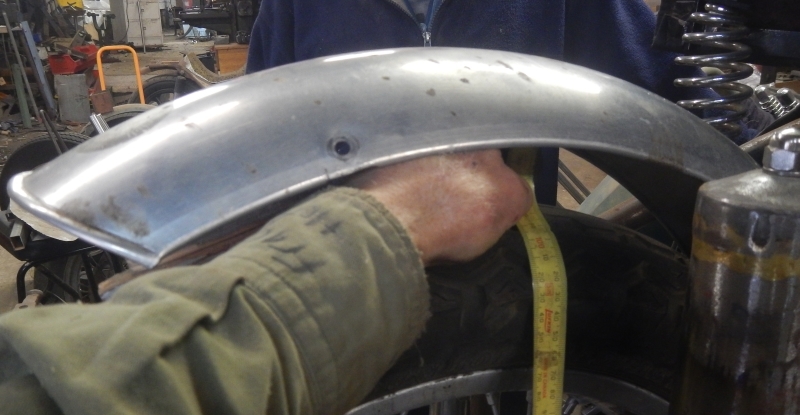 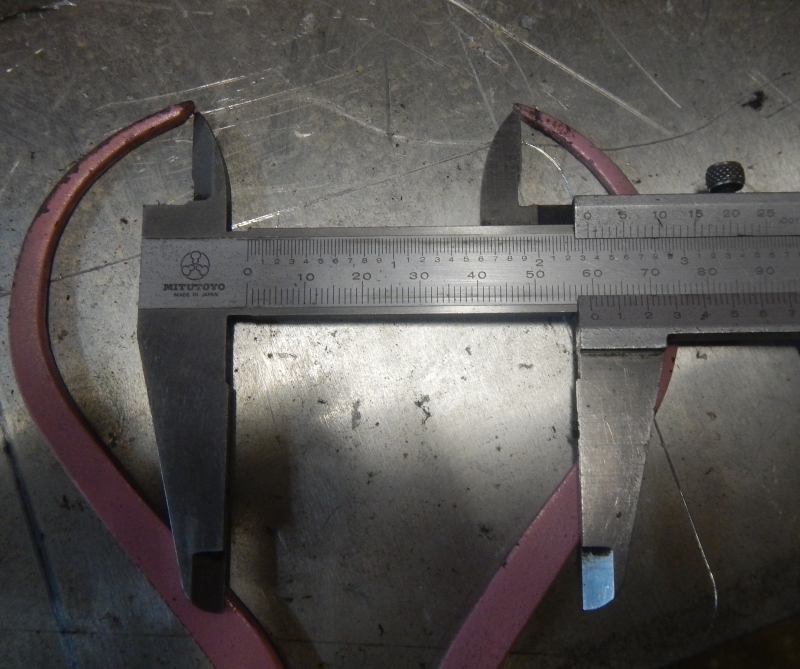 The rim is offset to the left by about 5mm. 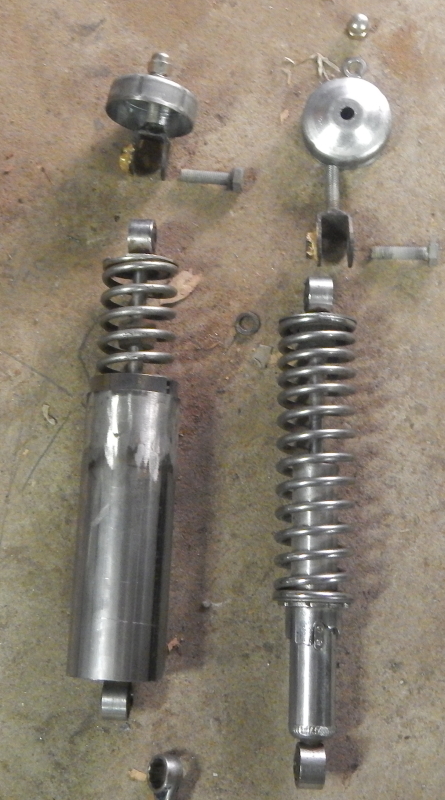 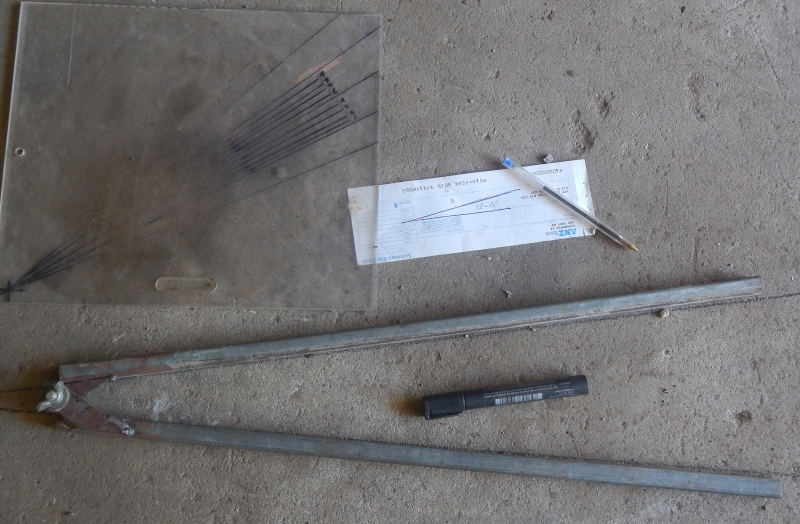 The right shocker is 12mm closer than the left..
Now looking more like it! 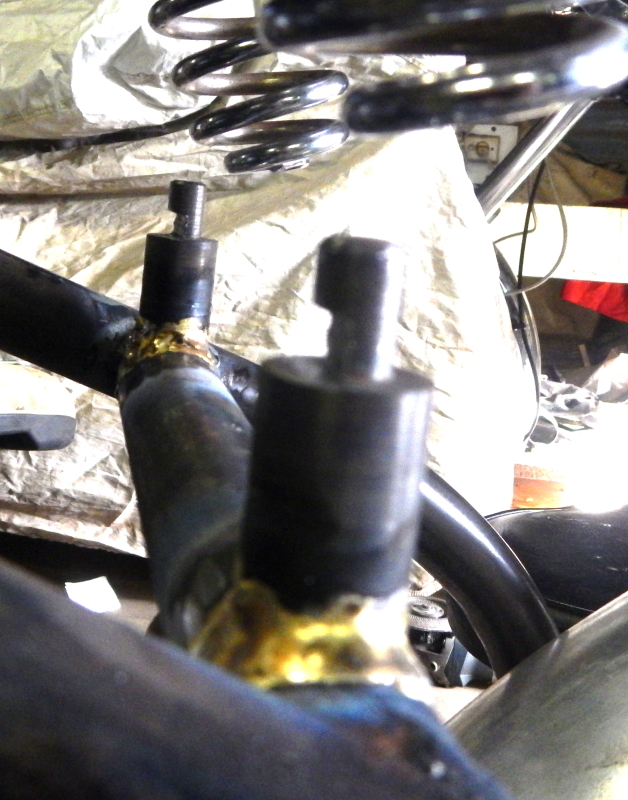 Have had a glitch with supply of tube that will cover and mount the shockers... was supposed to be here Monday, but I found out finally this afternoon that the supplier had forgotten to notify the driver. 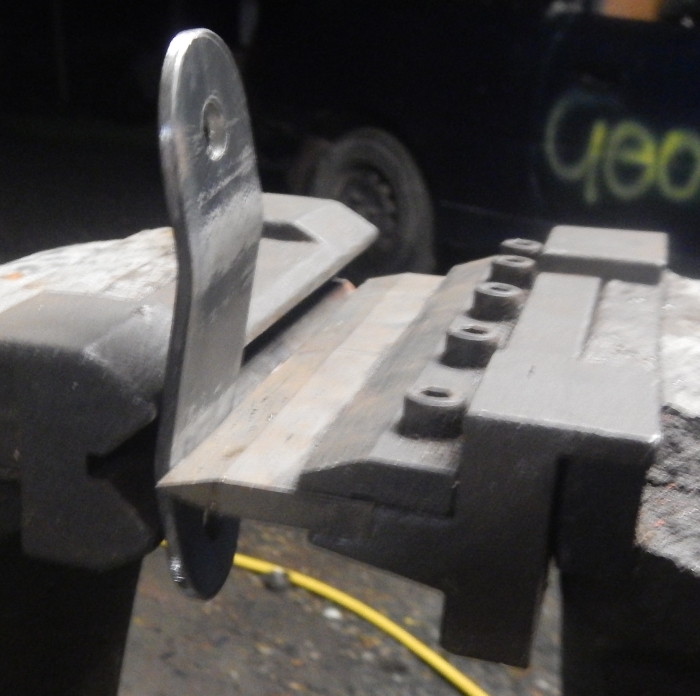 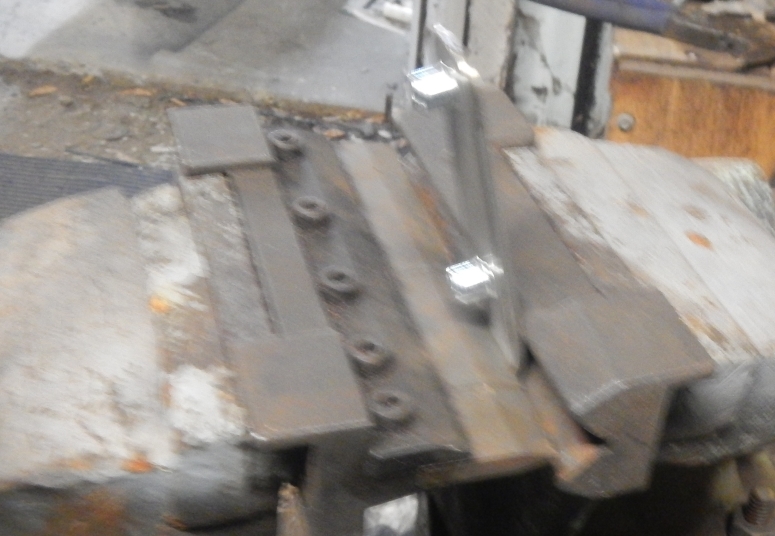 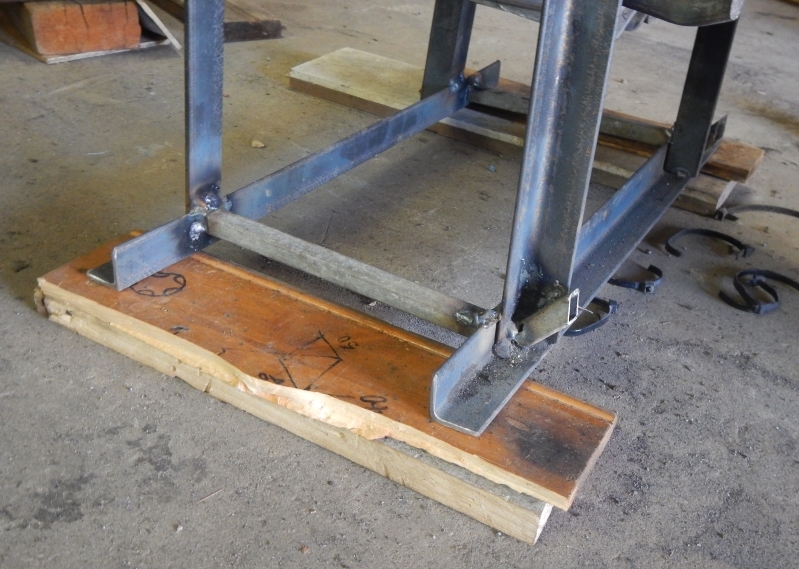 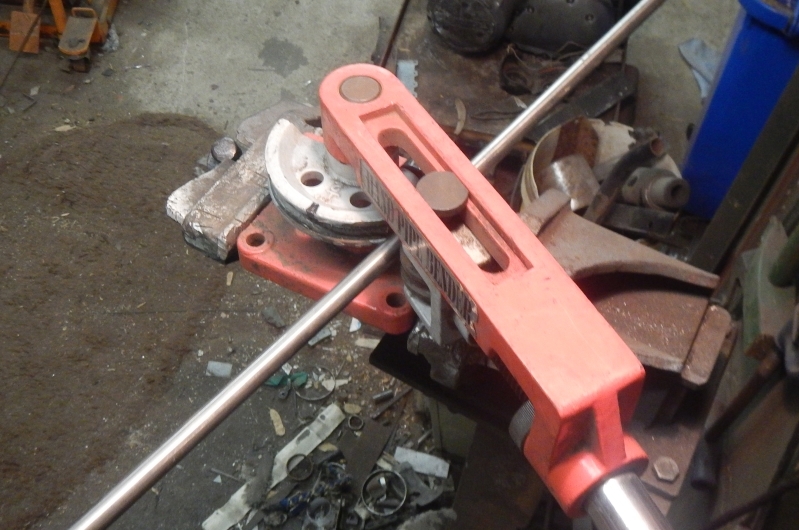 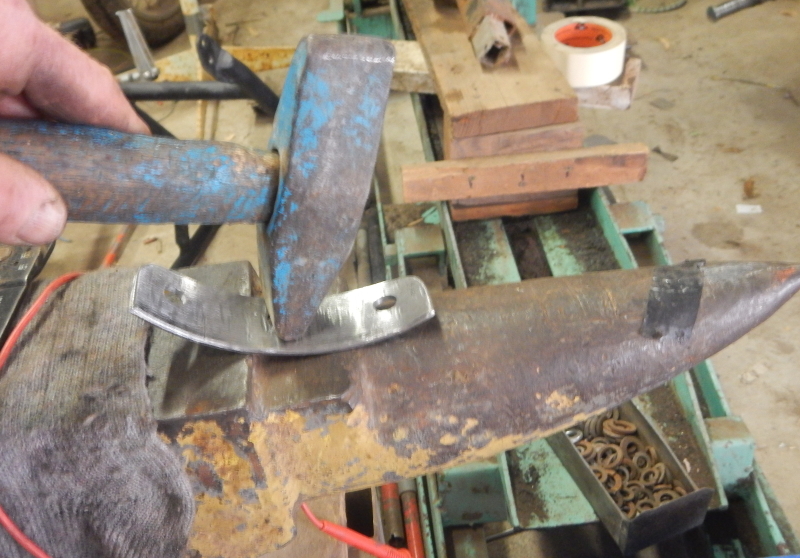 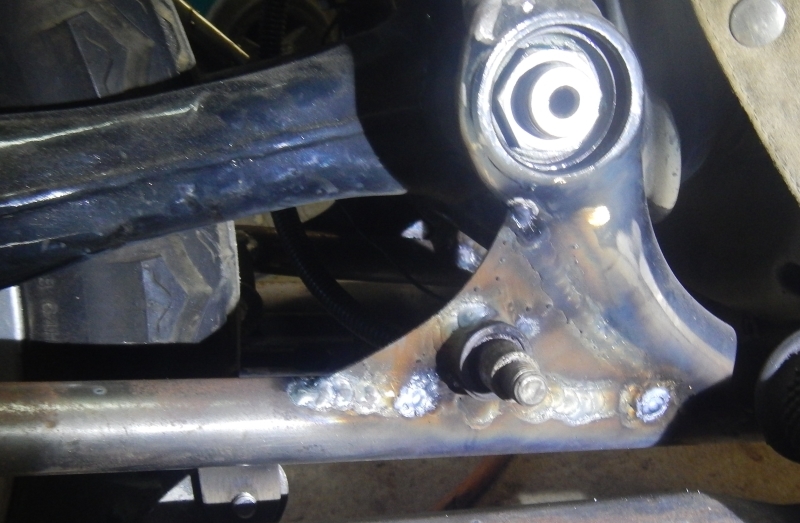 Lars will be here in the morning and I was expecting we would make up these shocker mounts... so we'll just have to see what else we can do until the steel arrives hopefully in the early afternoon. 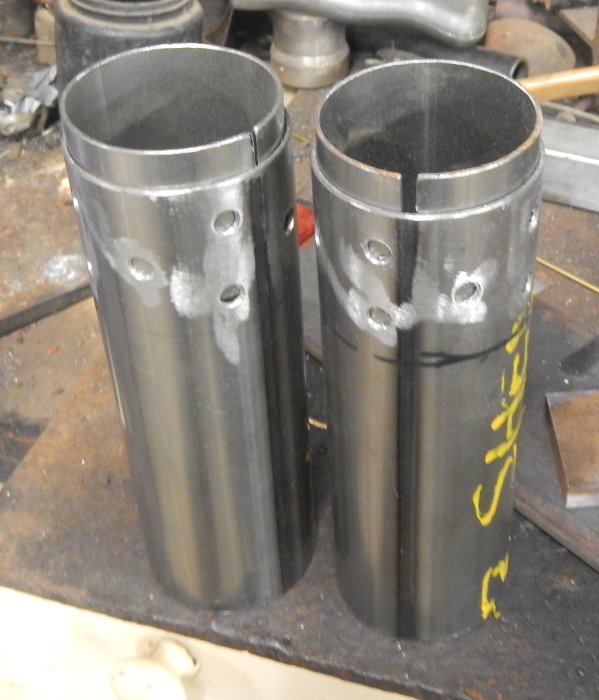 Shocker towers will be joined using some heavy curved tube plus gussets below. 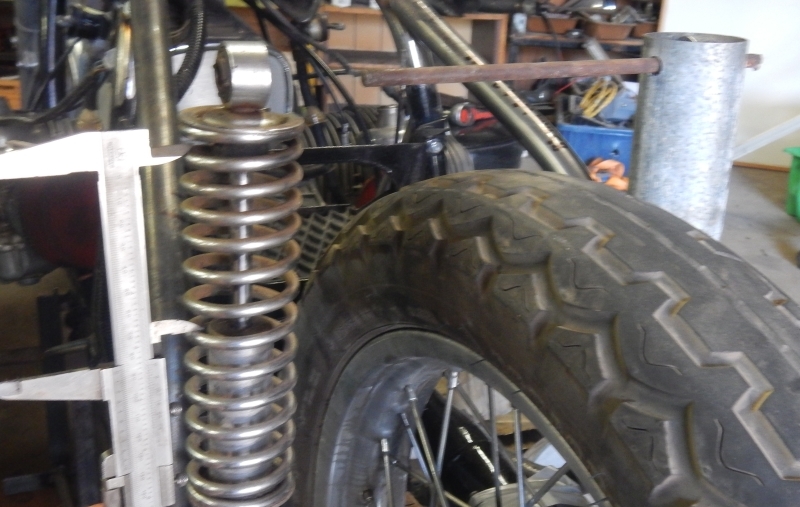 ..
Now the big test! 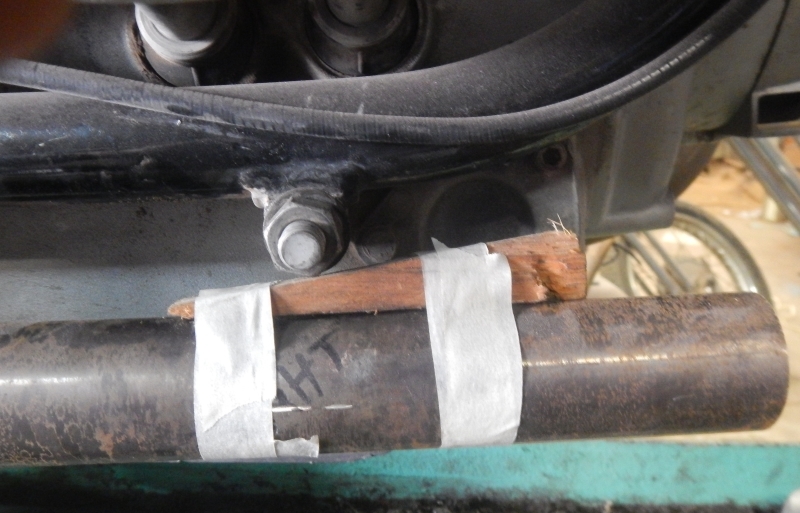 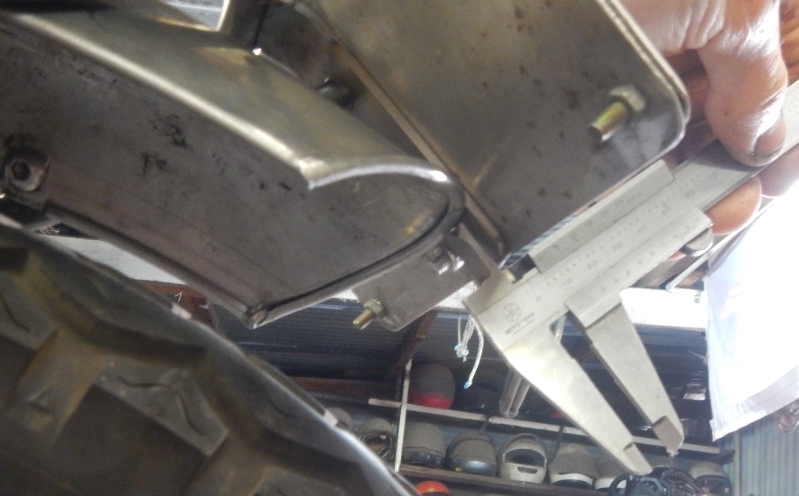 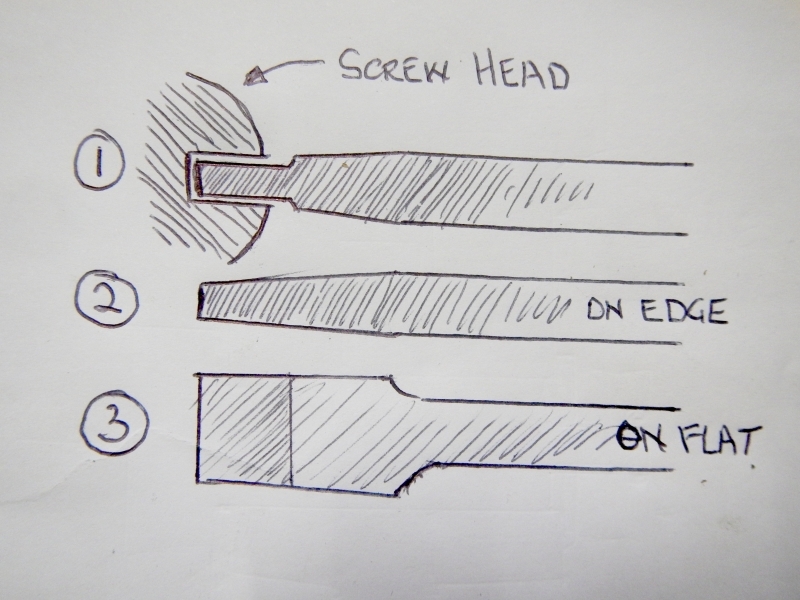 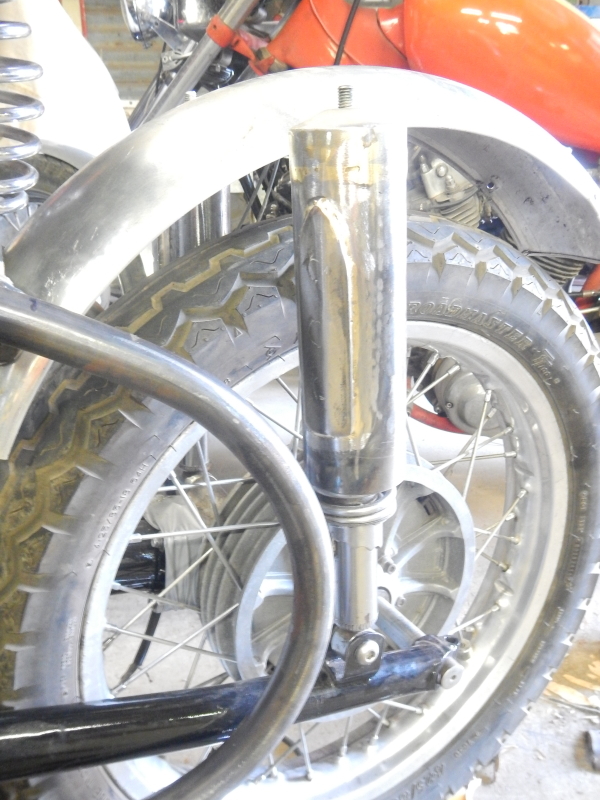 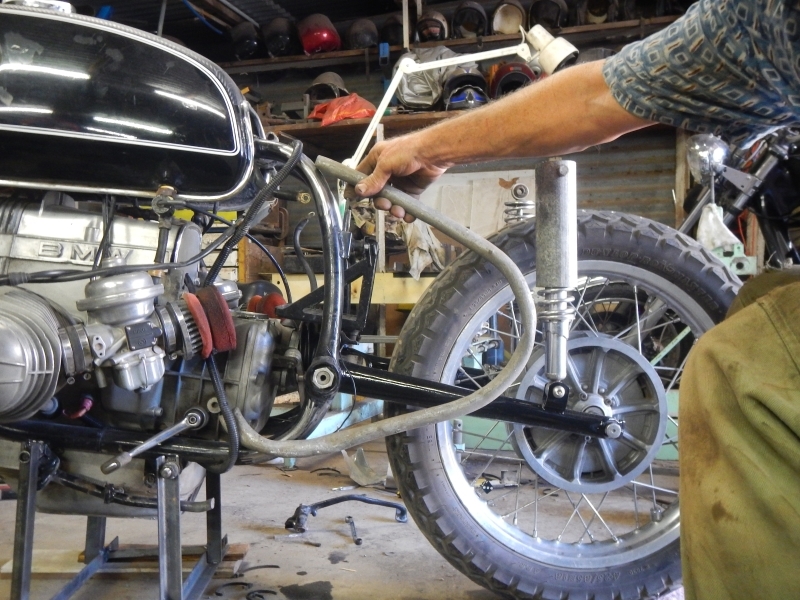 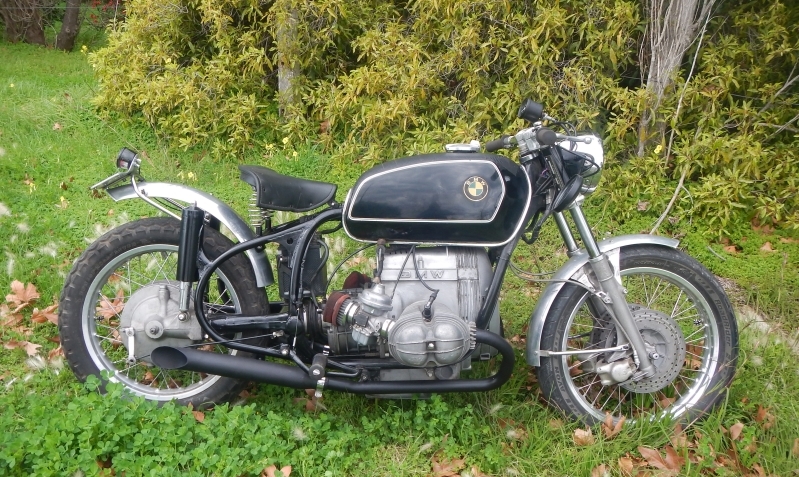 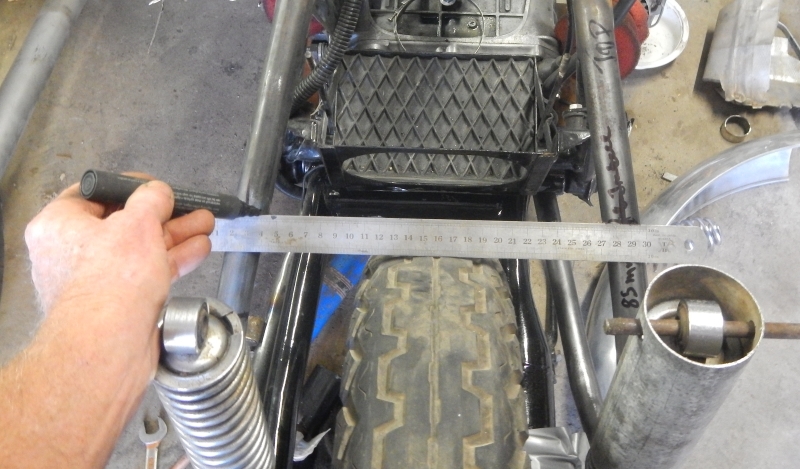 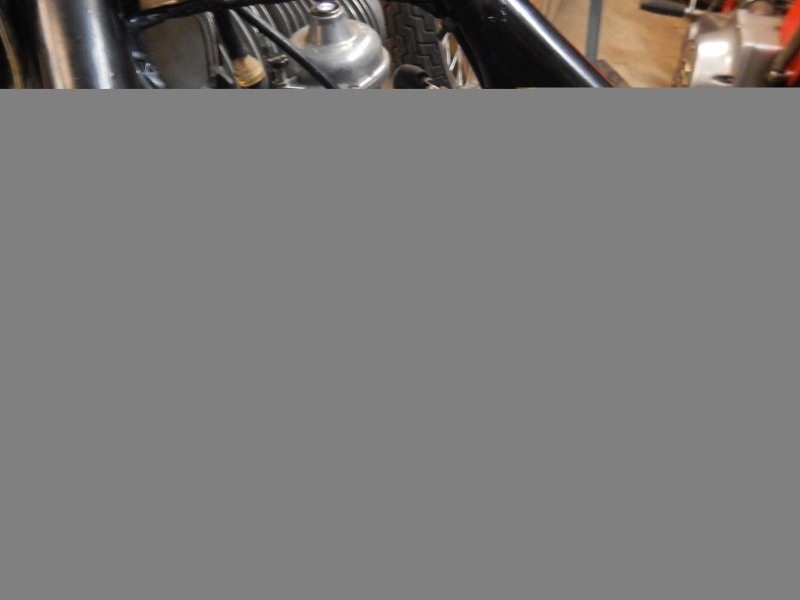 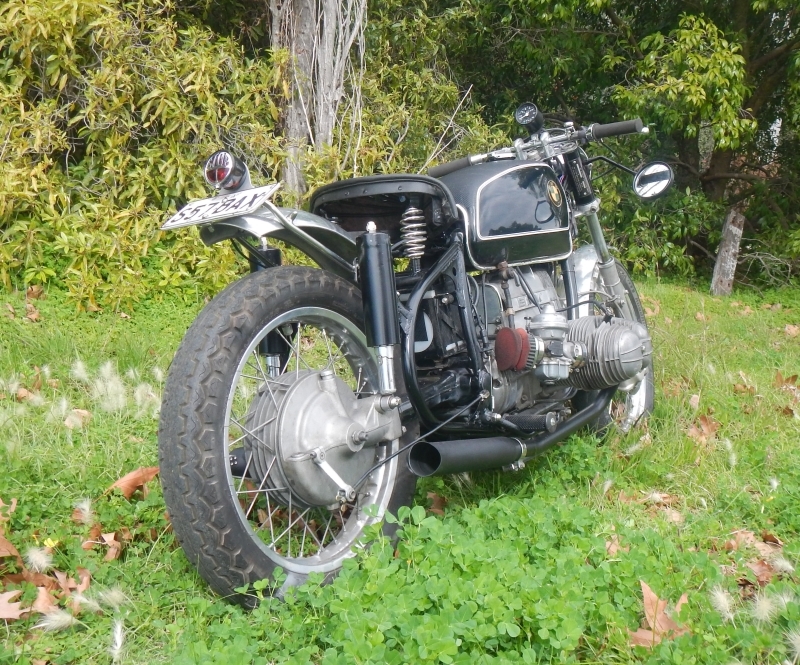 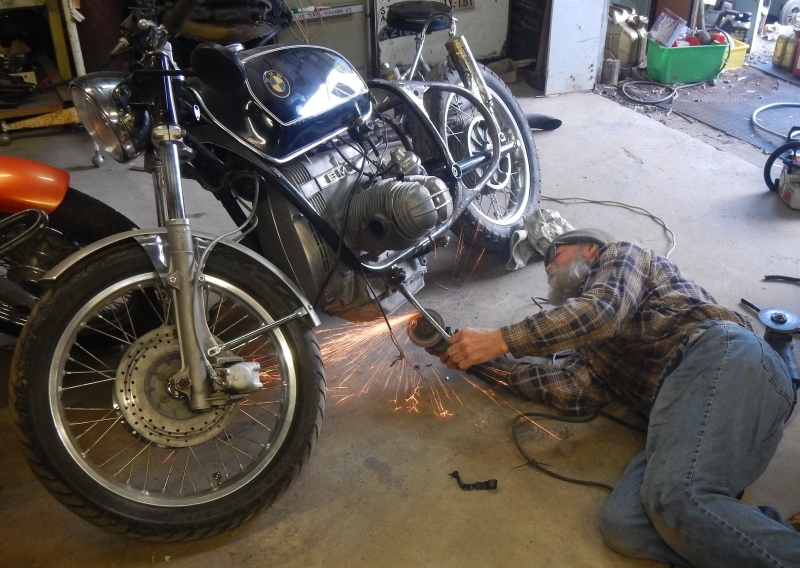 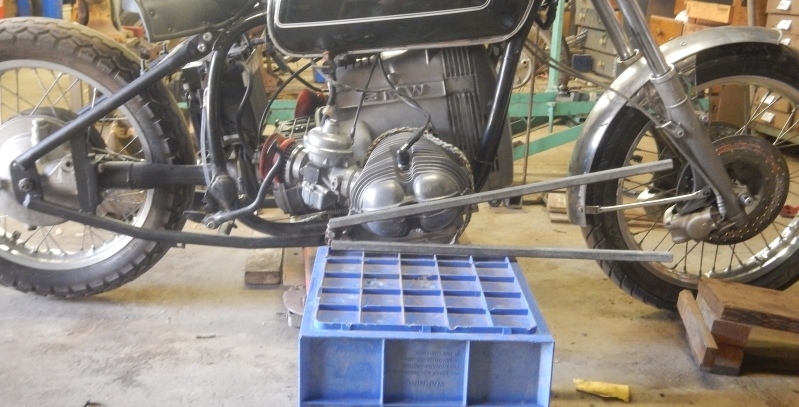 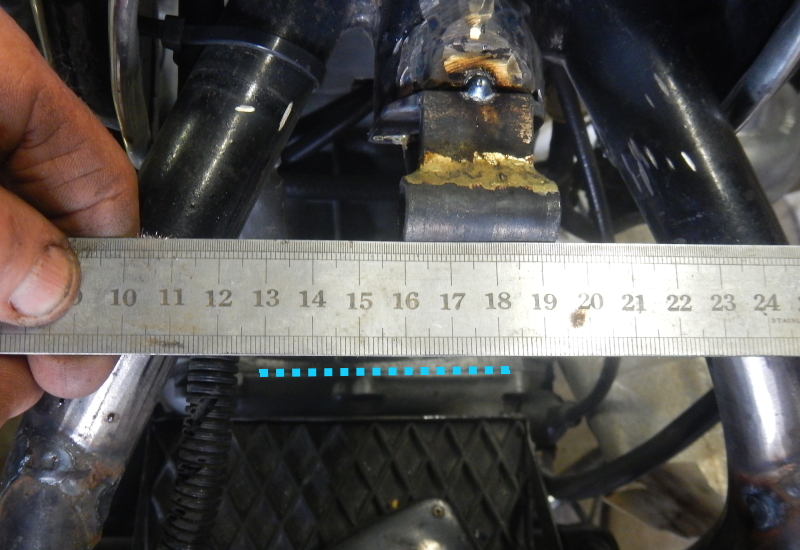 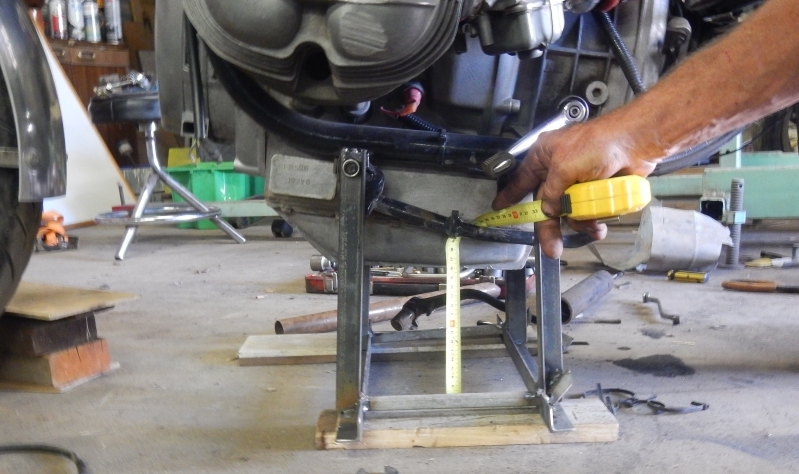 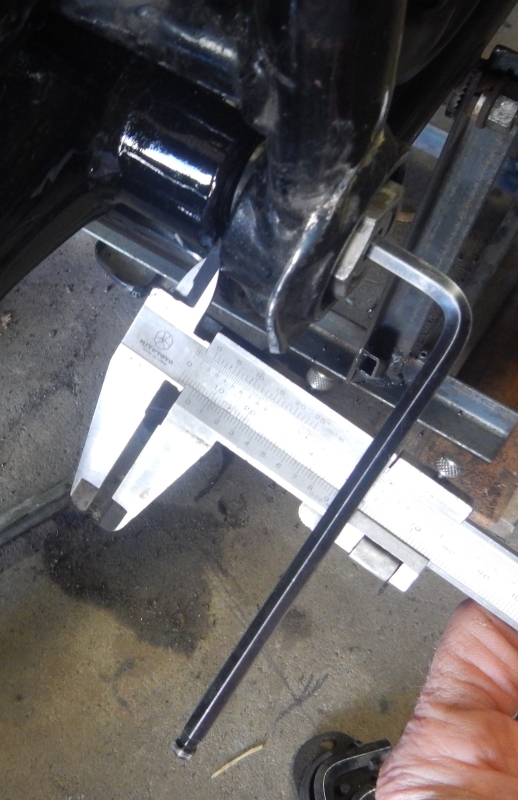 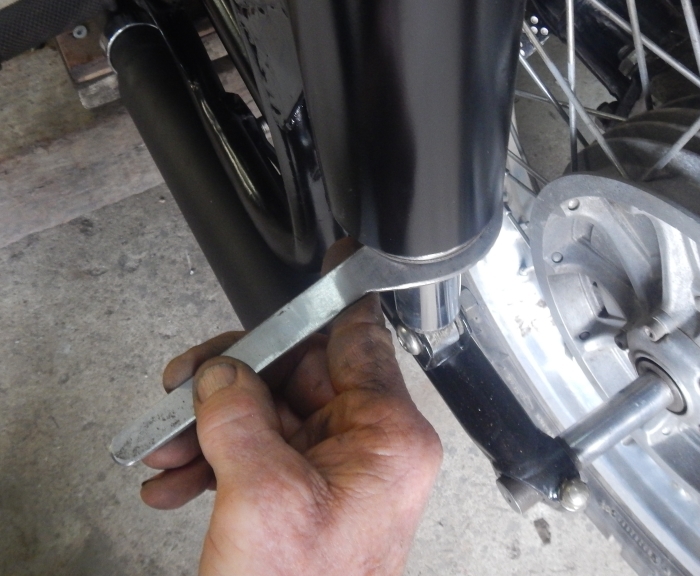 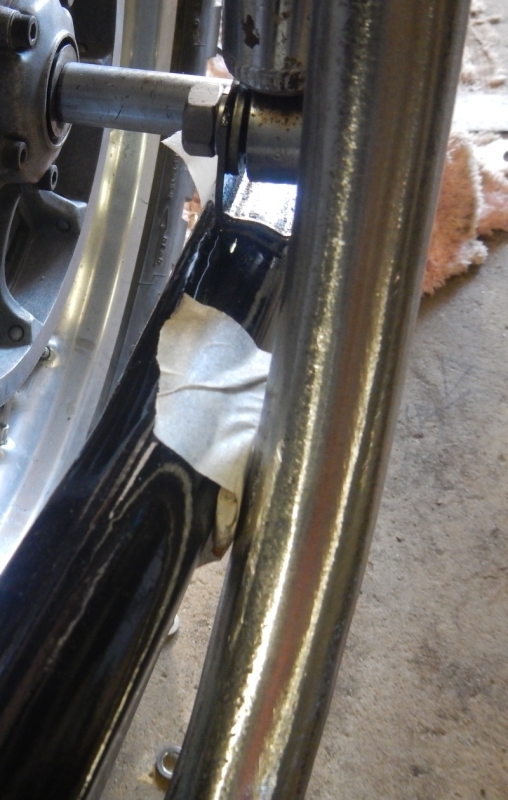 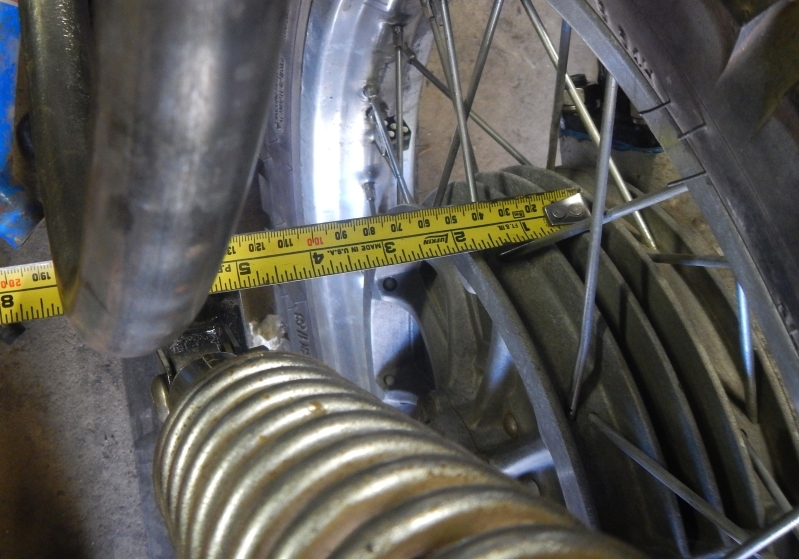 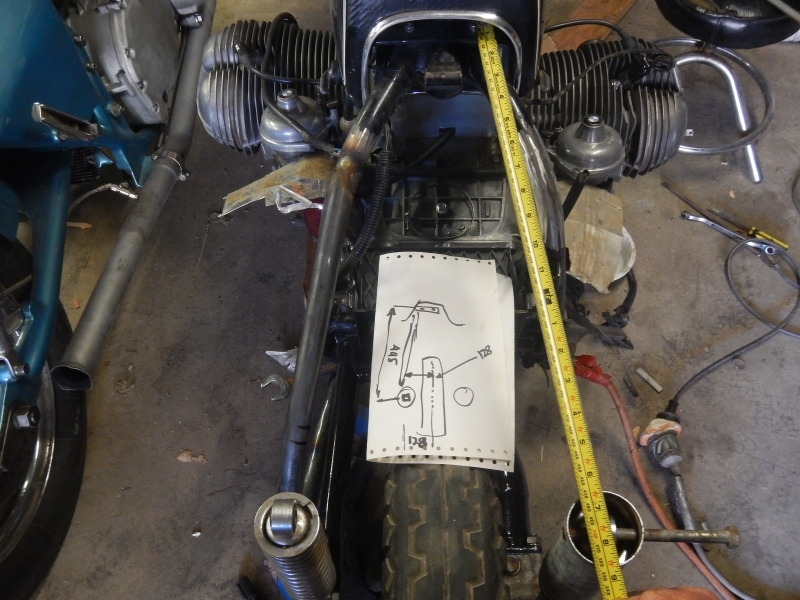 you may remember the forks compress a lot when the bike is off the stand and there was a lot of measuring and a bit of guesswork about how high to start off. 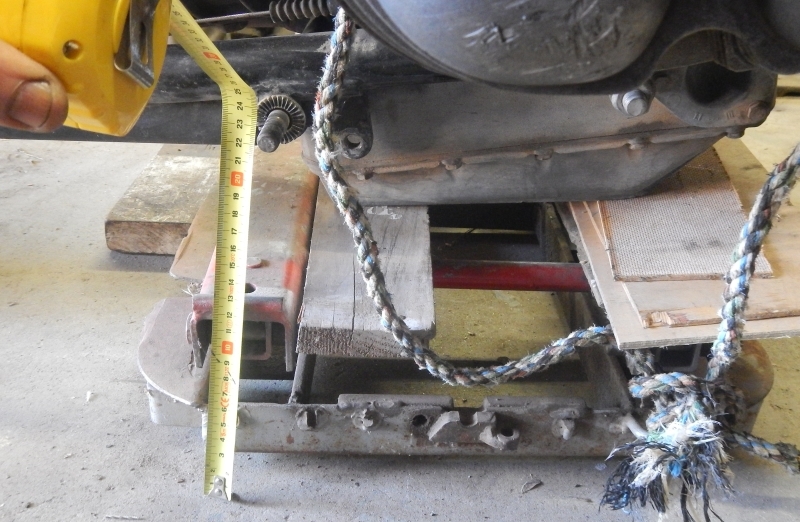 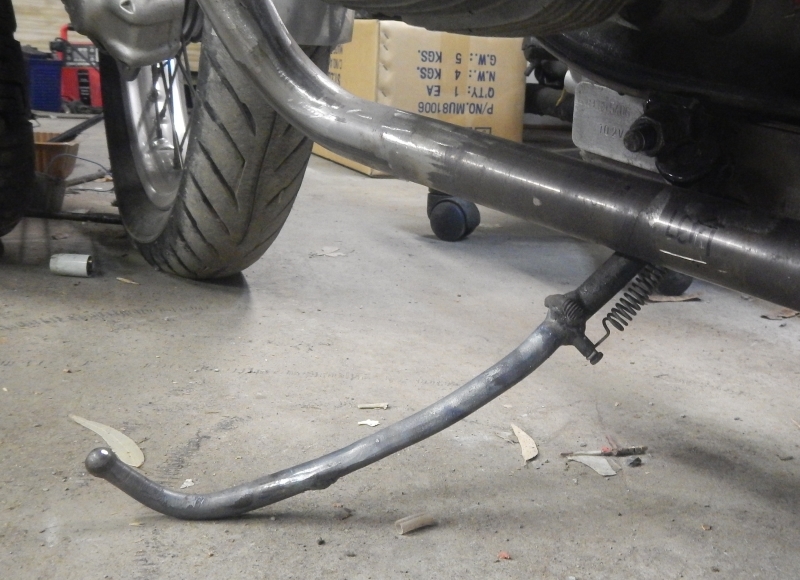 Well we wanted 5" ground clearance... and guess what? 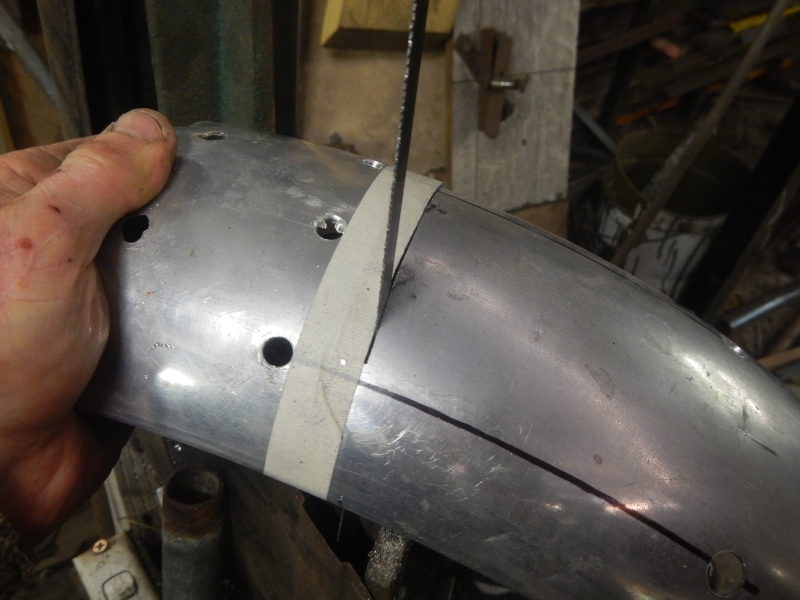 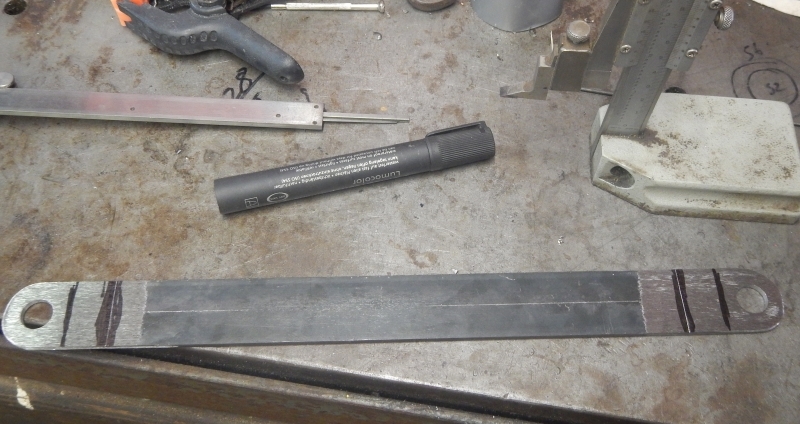 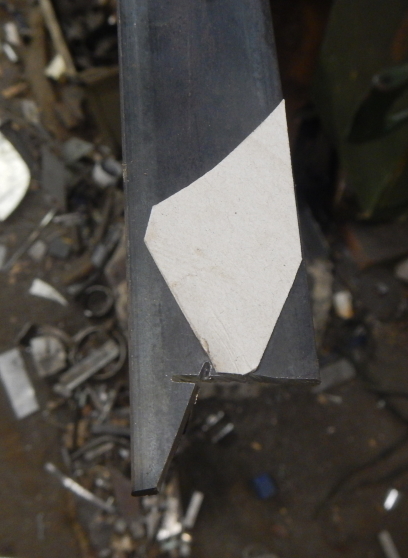 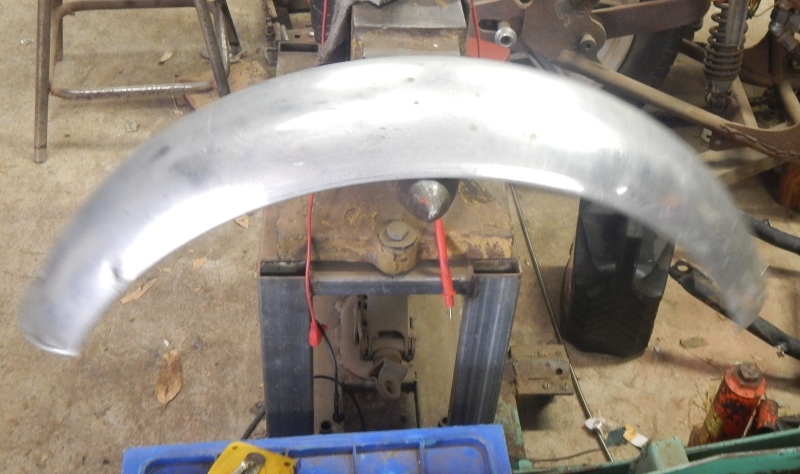 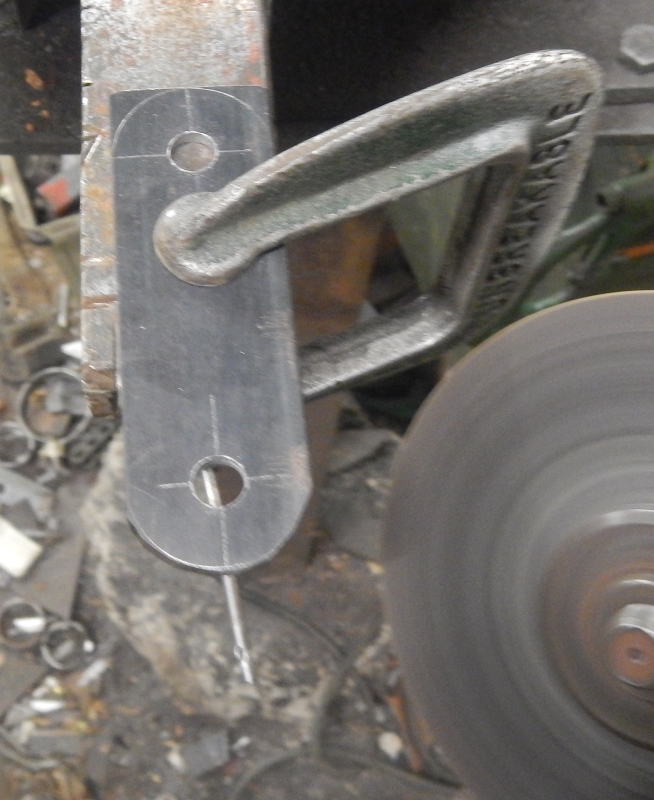 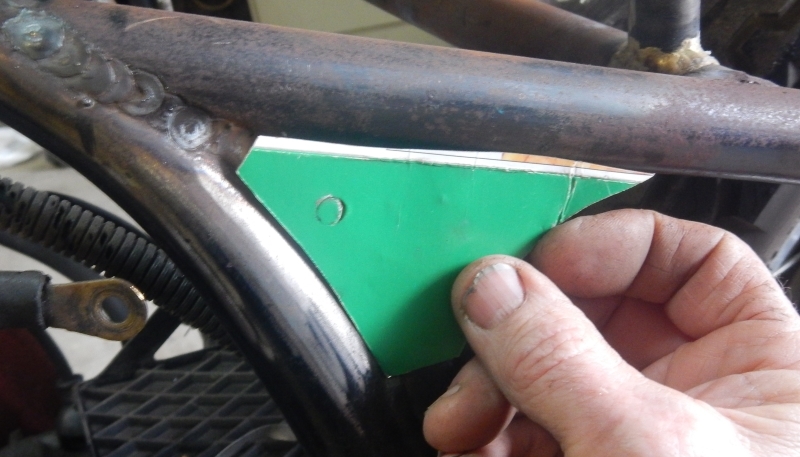 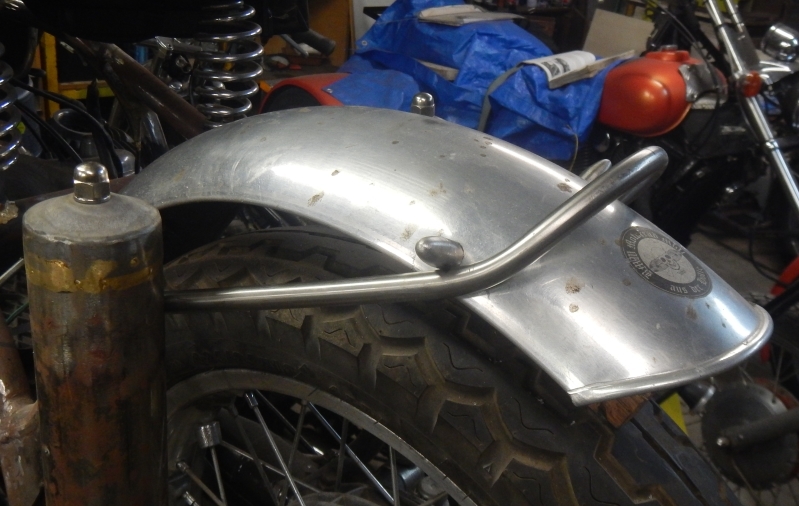 A simple rear guard bracket incorporating the tail light will come next. 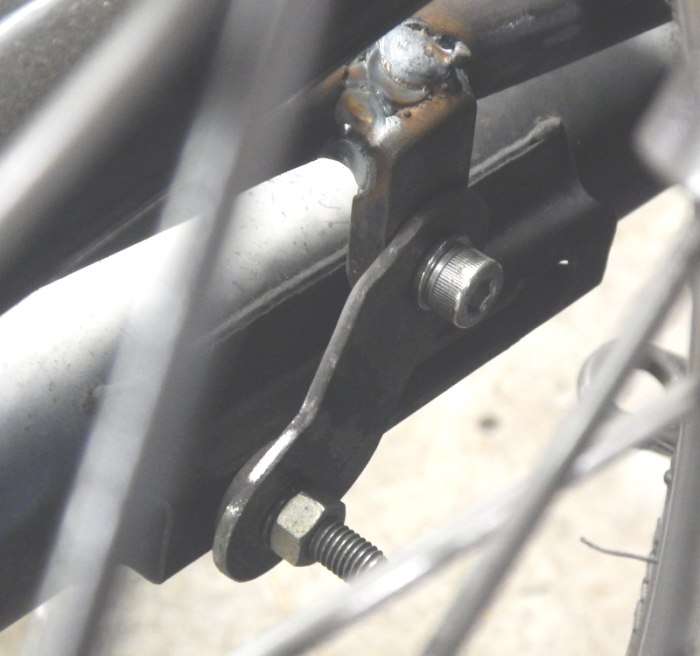 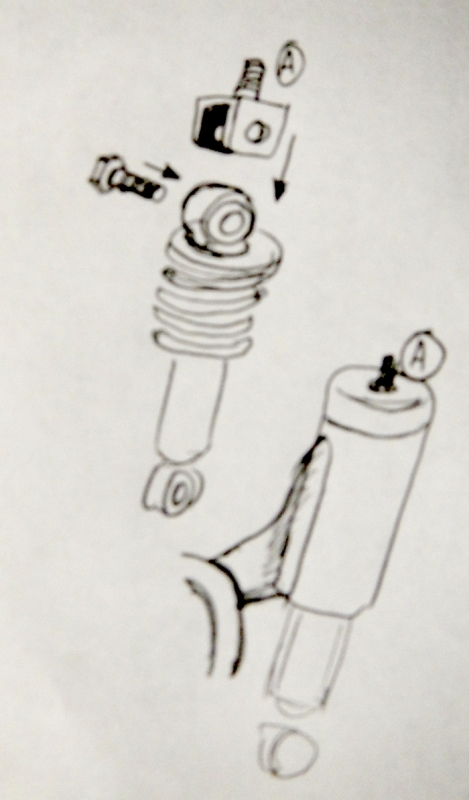 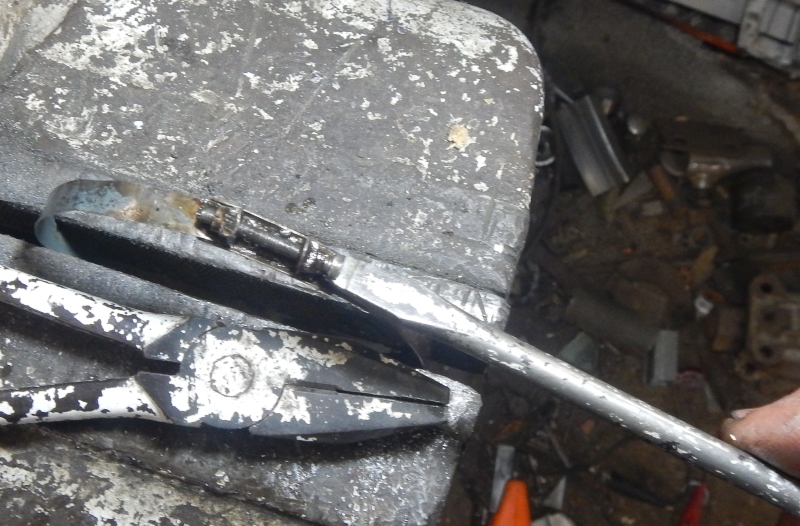 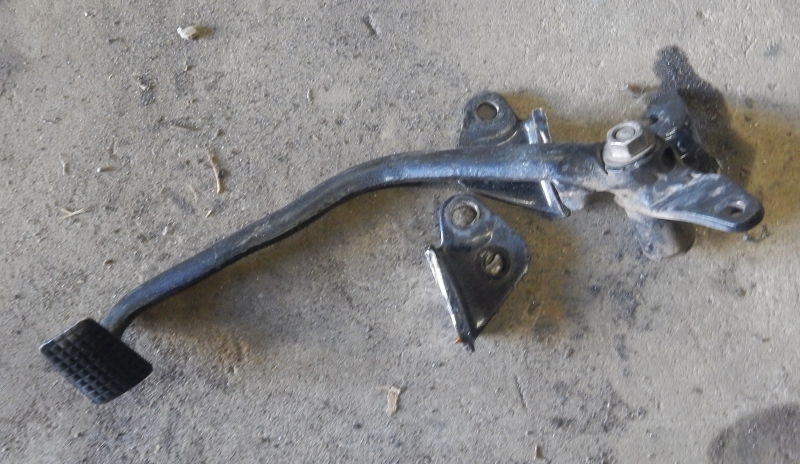 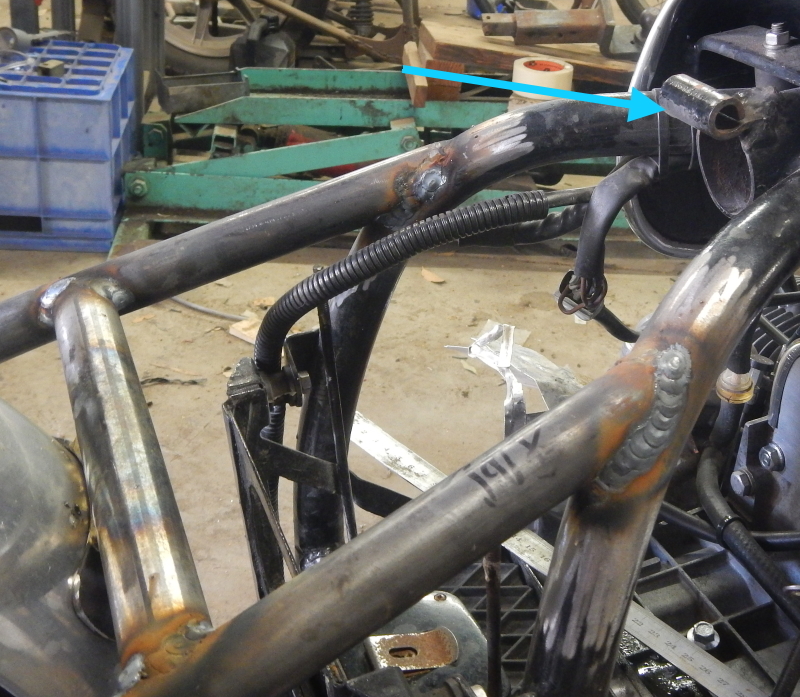 Rear brake lever has to be set up as a part of the gusset that will go down the bottom at the rear of the frame join. 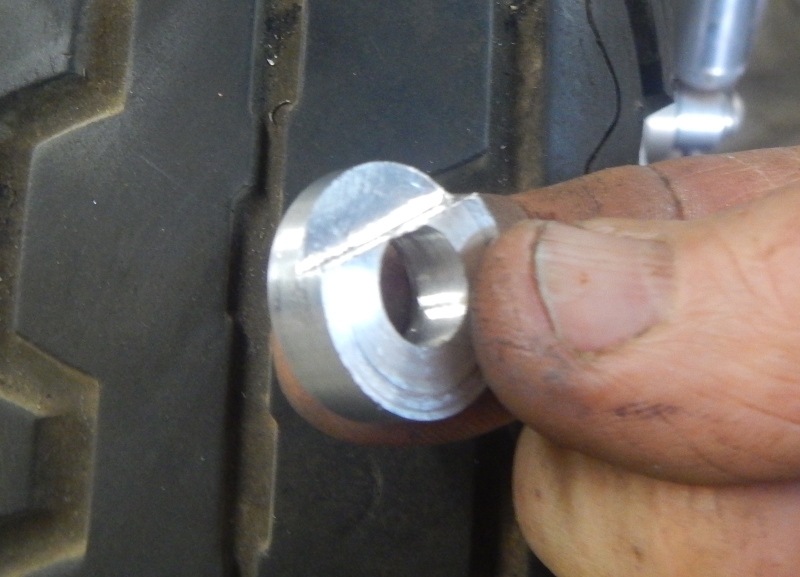 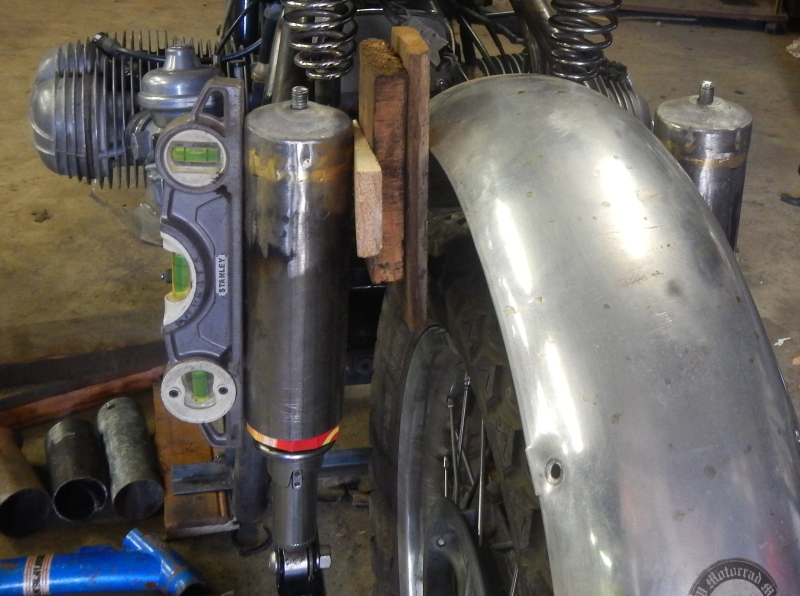 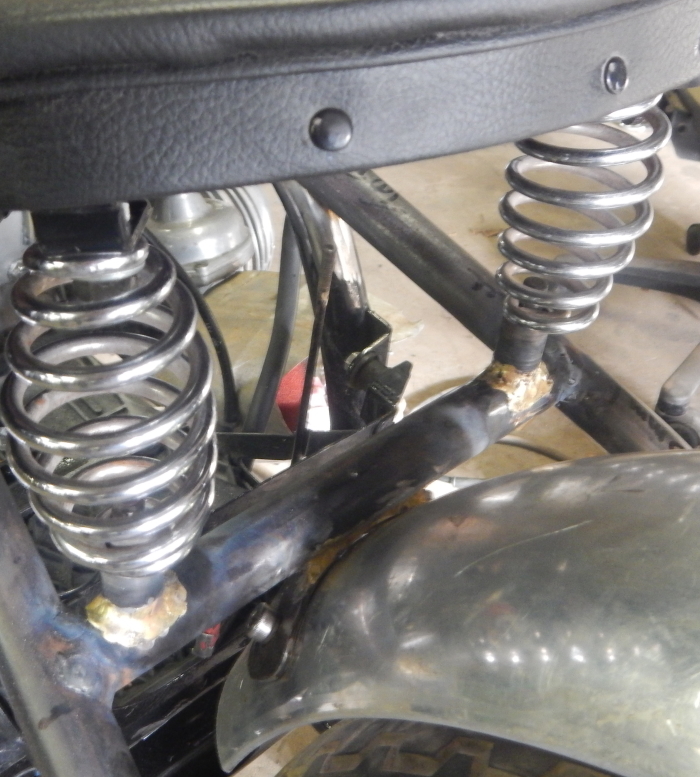 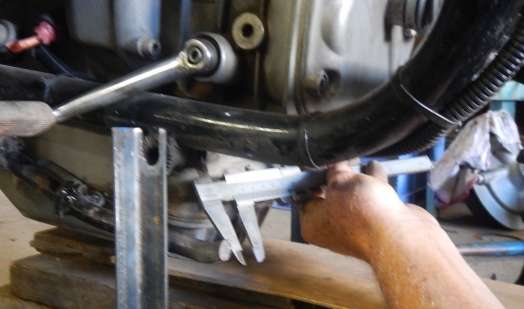 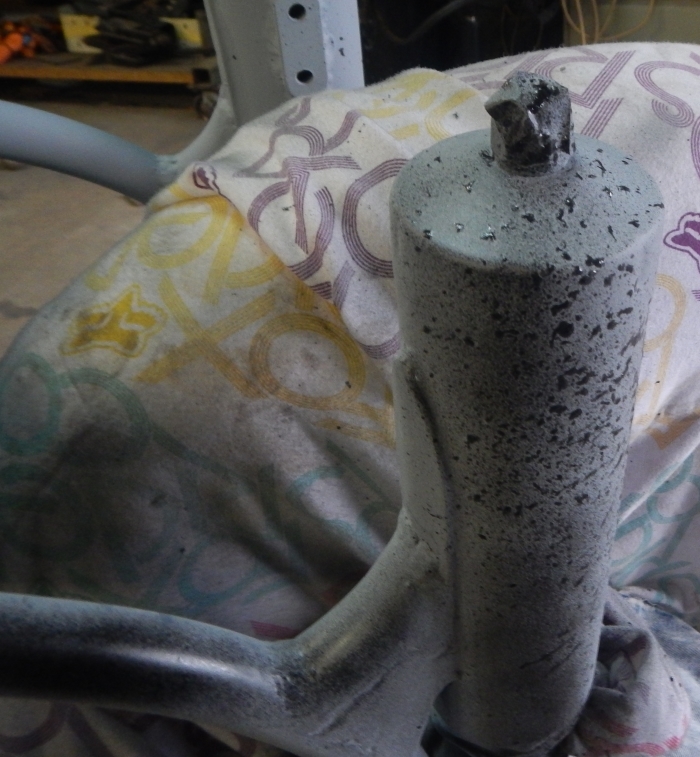 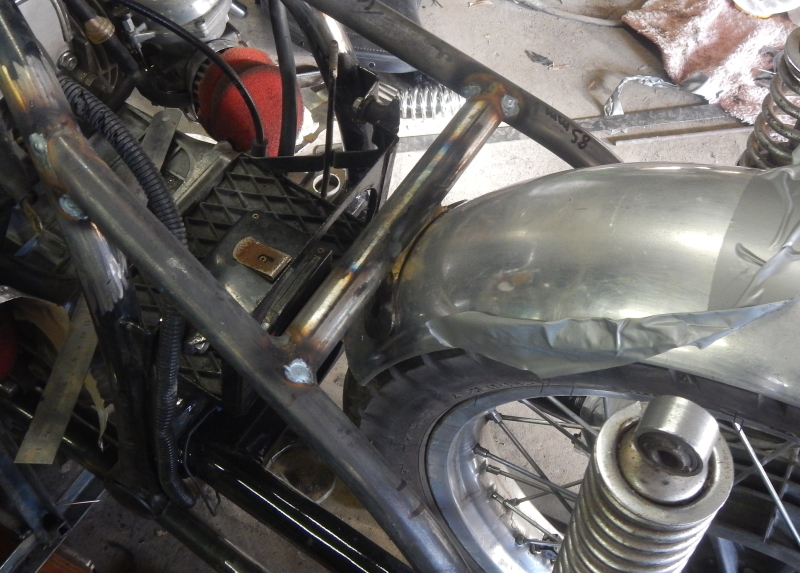 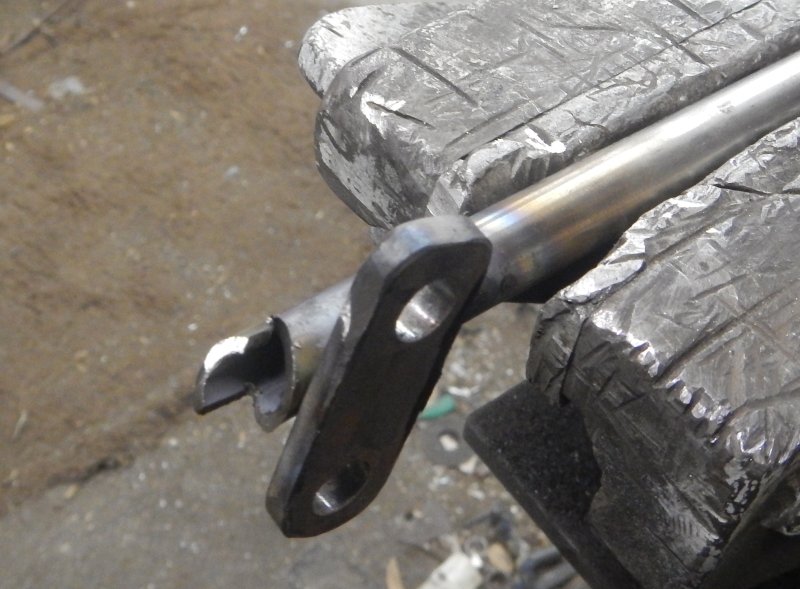 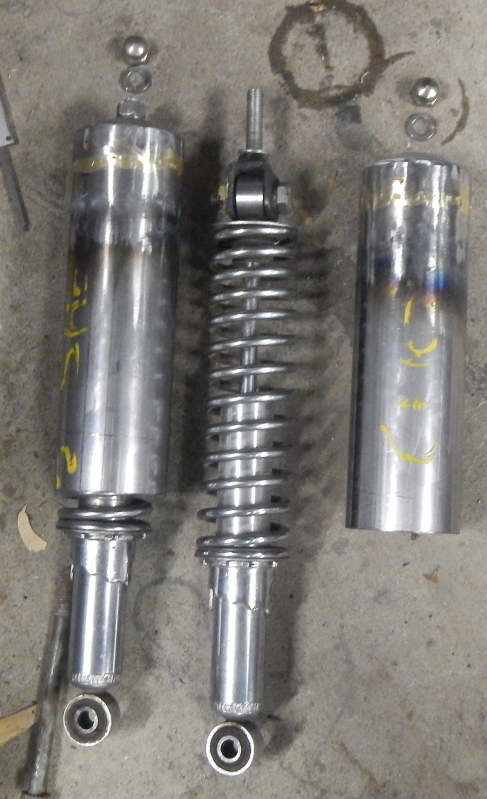 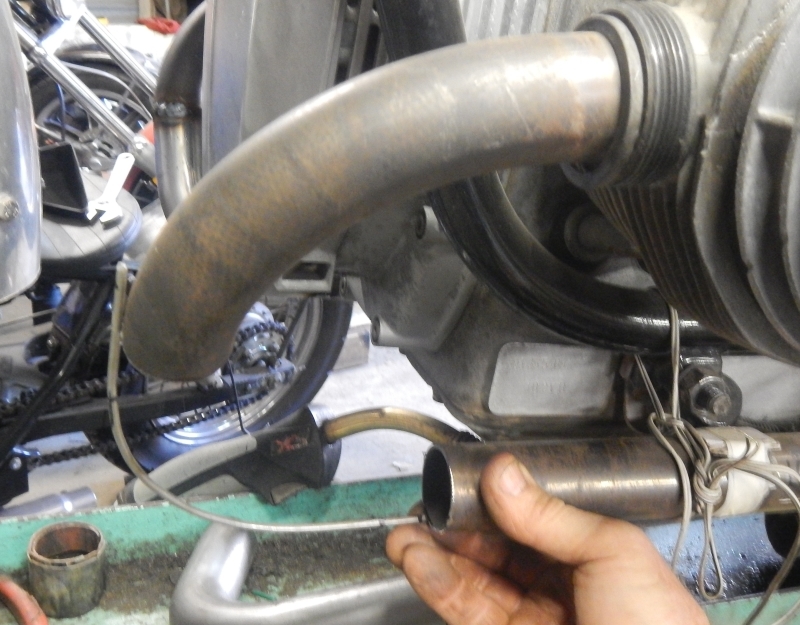 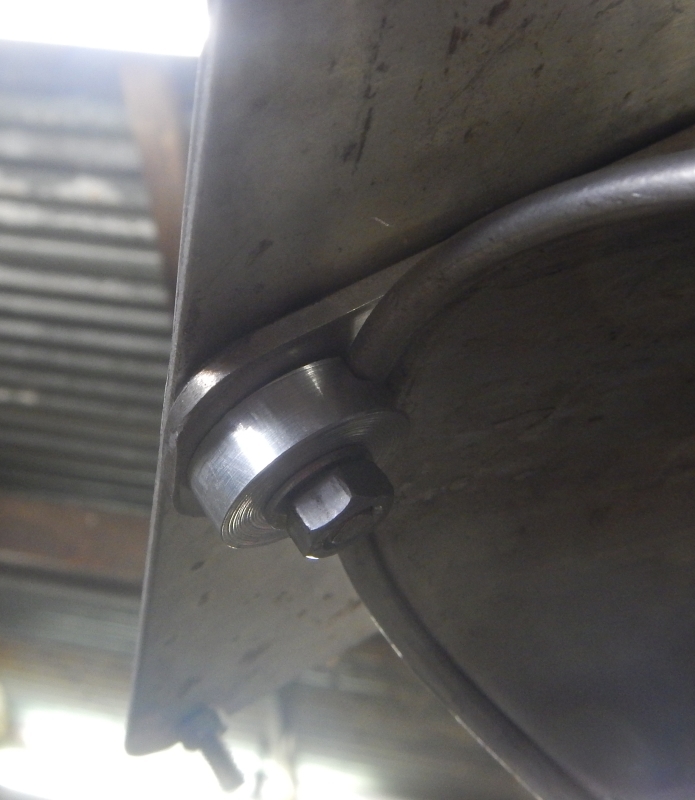 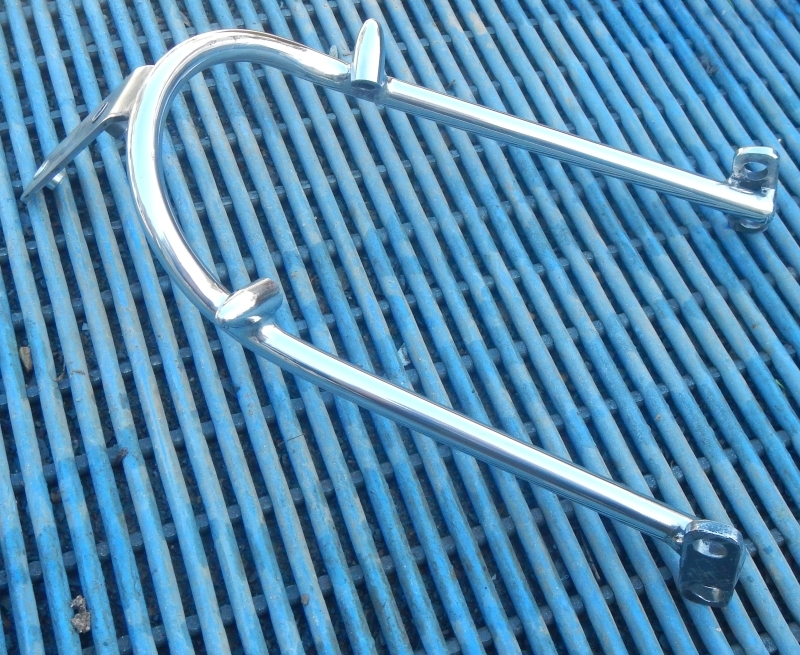 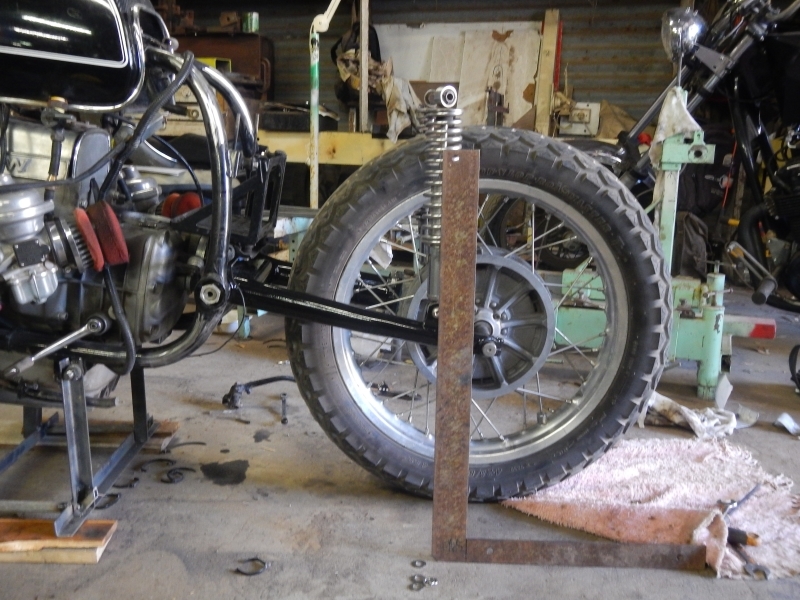 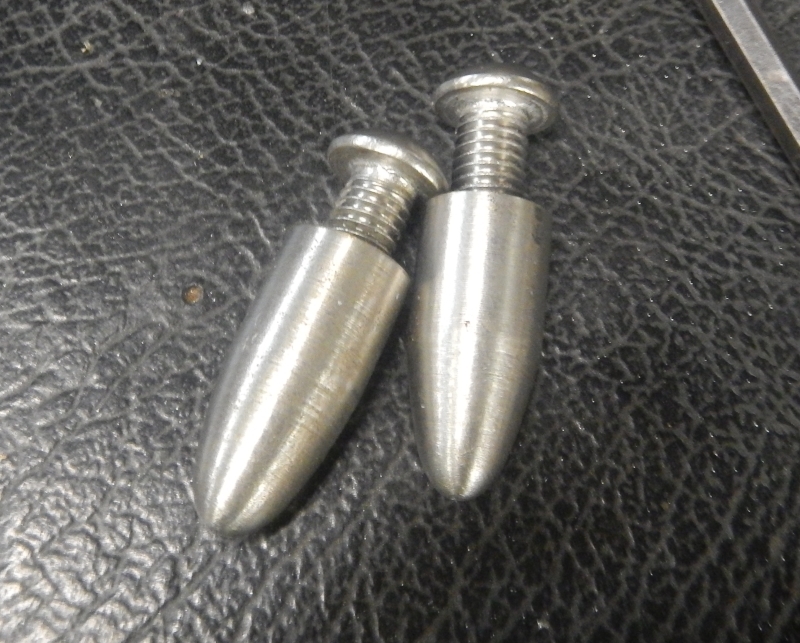 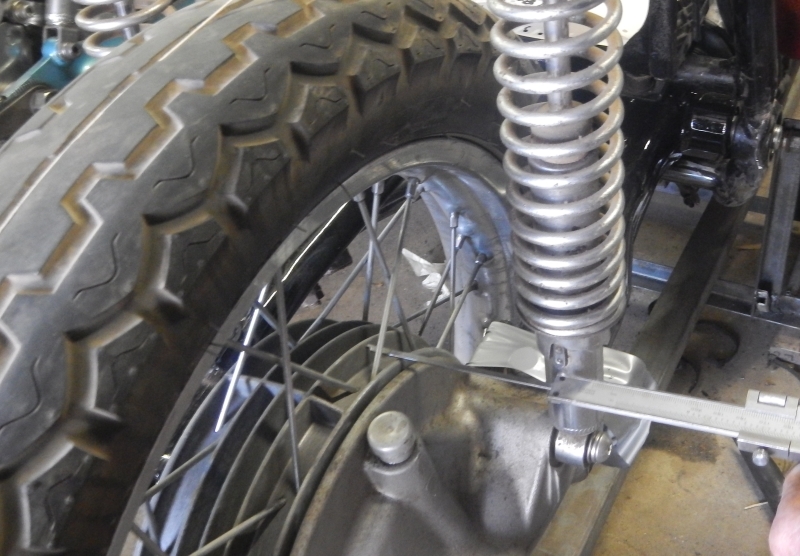 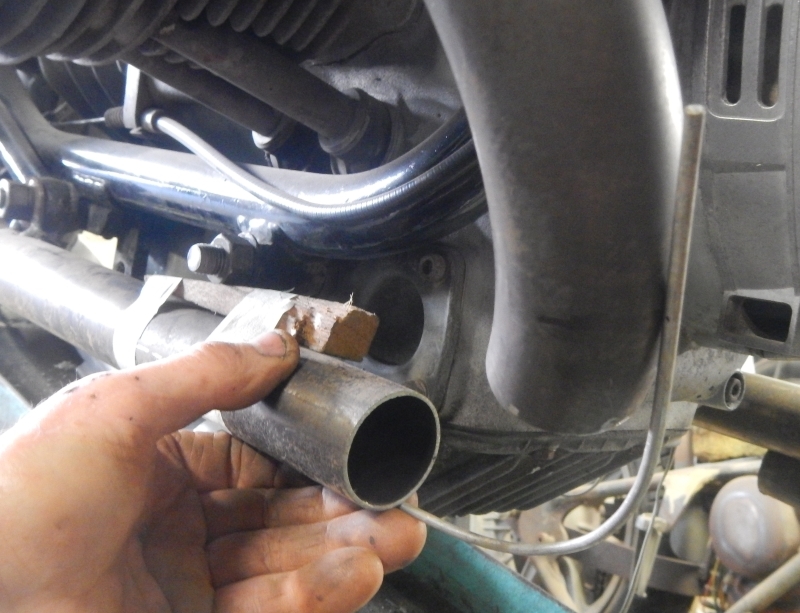 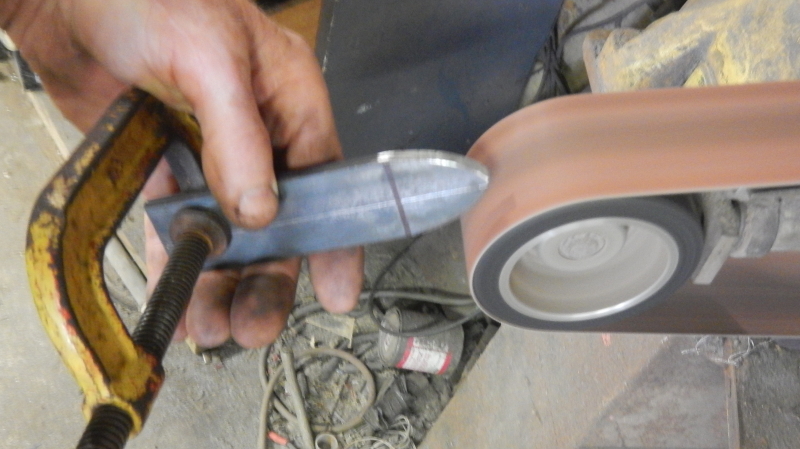 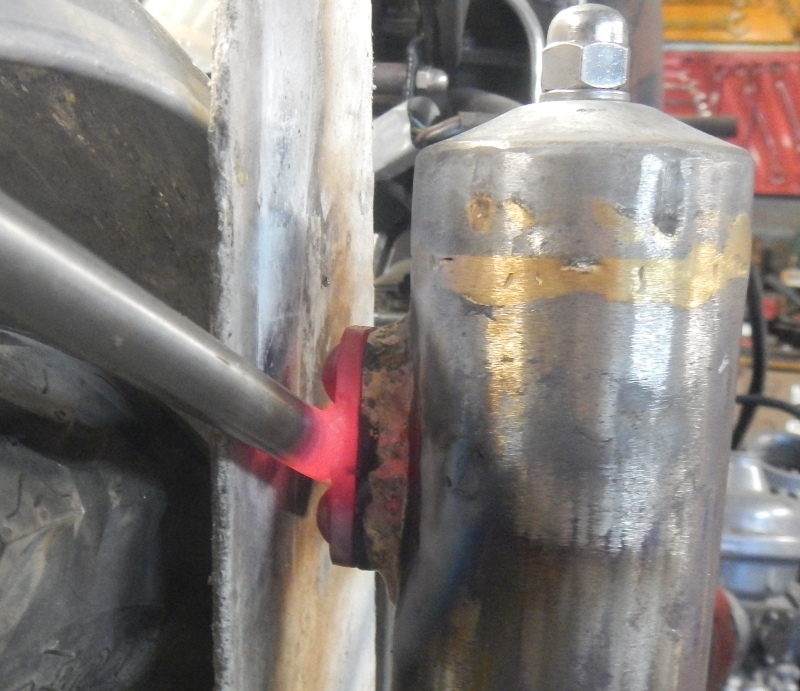 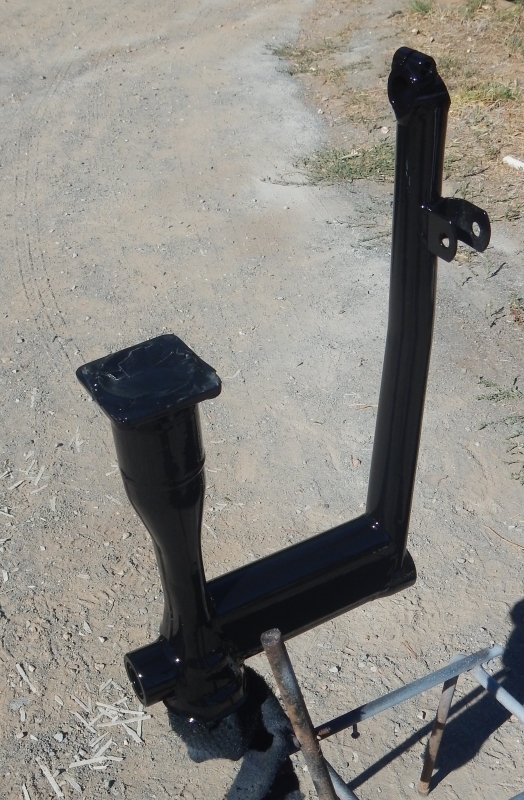 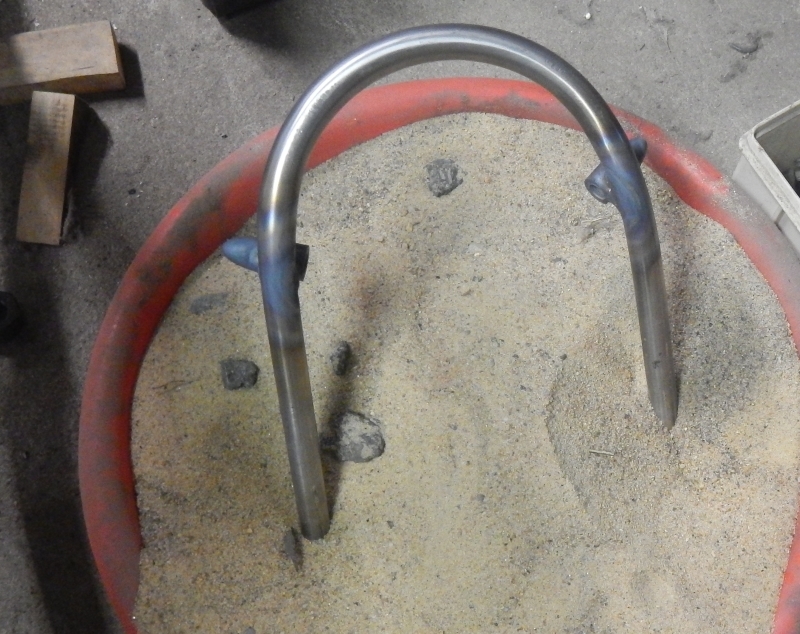 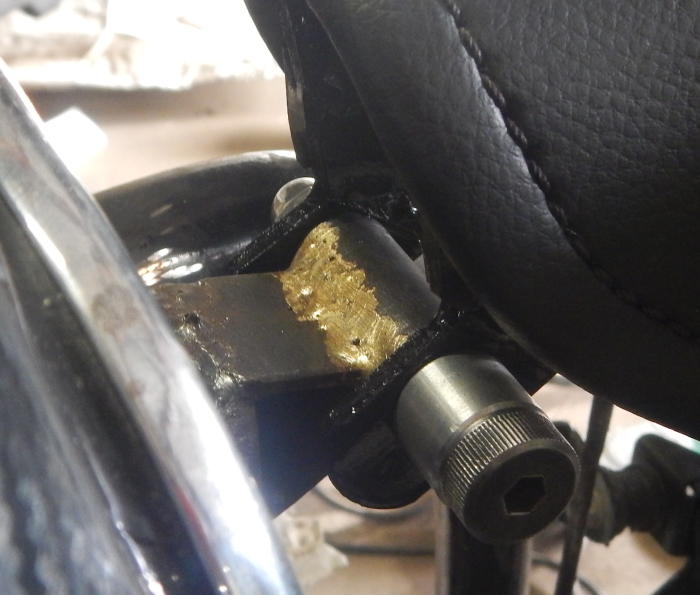 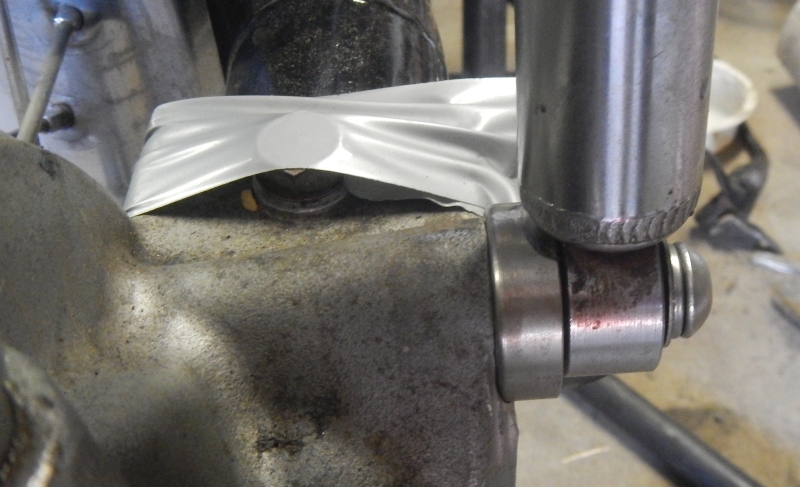 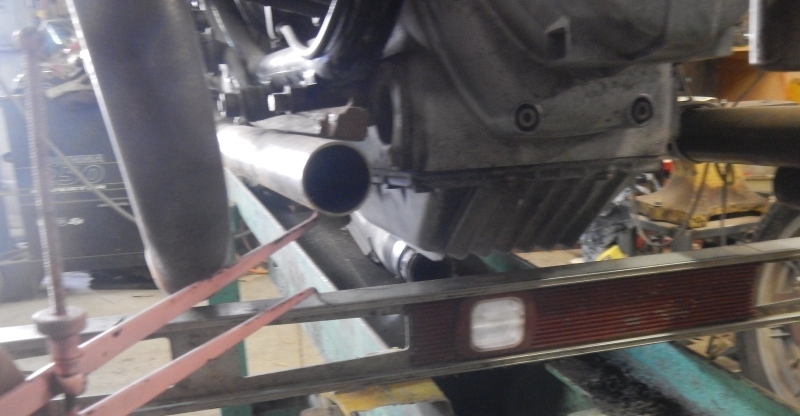 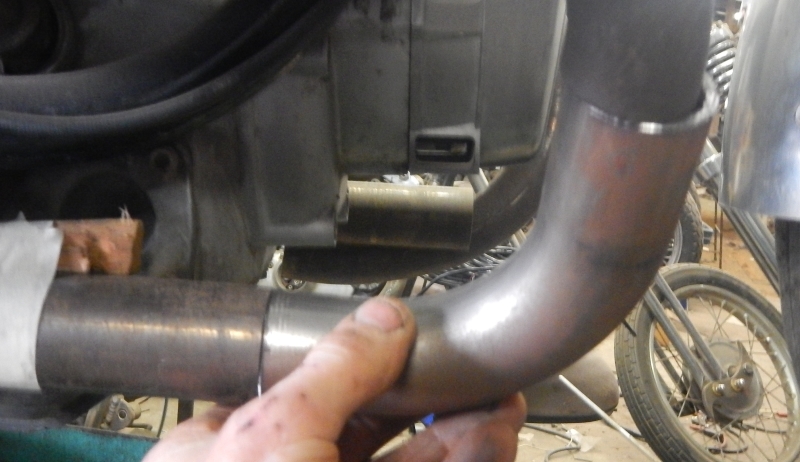 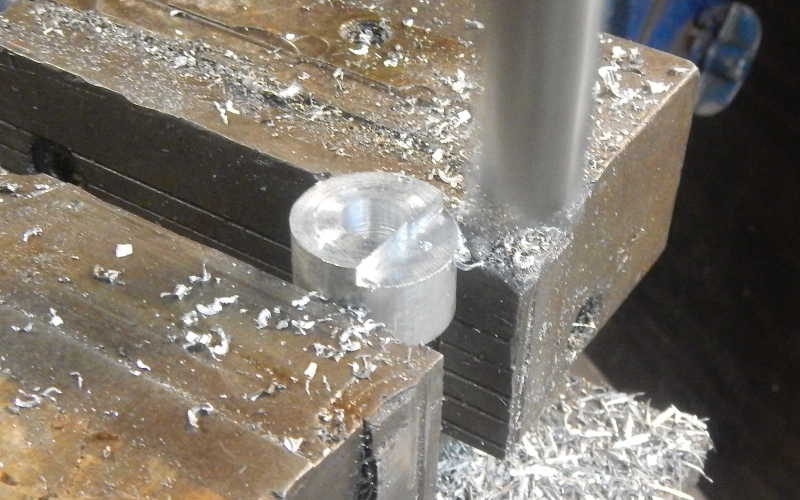 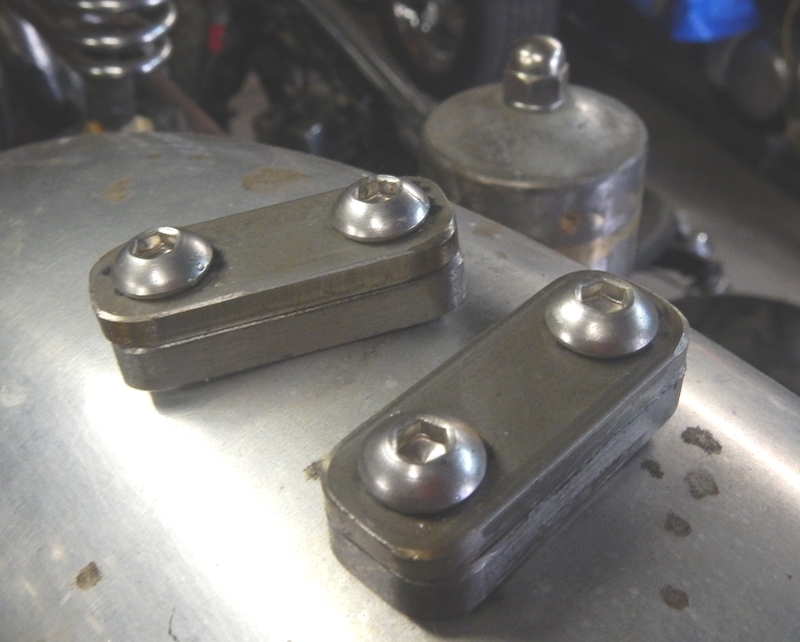 Side stand also needs lengthening and we'll have to add a couple of threaded bungs to mount the exhausts. 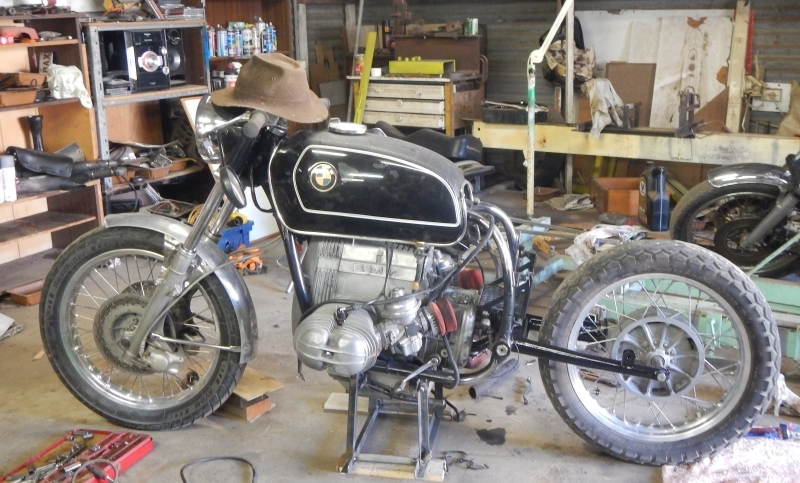 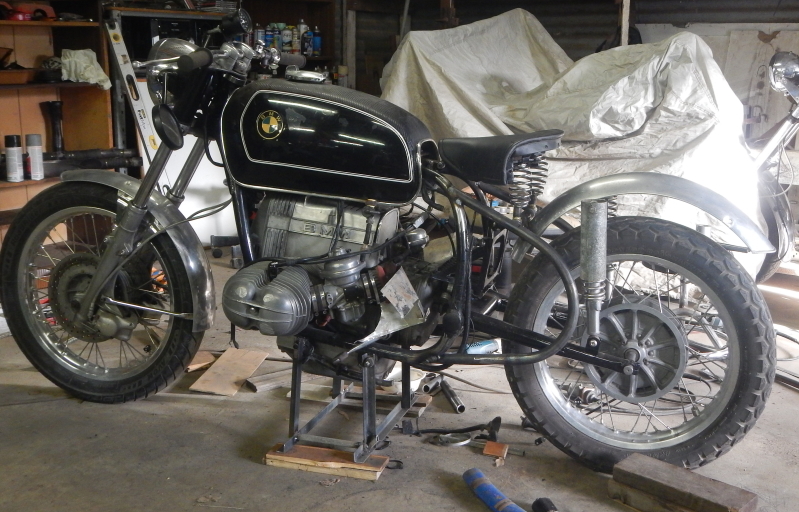 Need to get on with another bike for the moment and come back to this one in a couple of weeks. 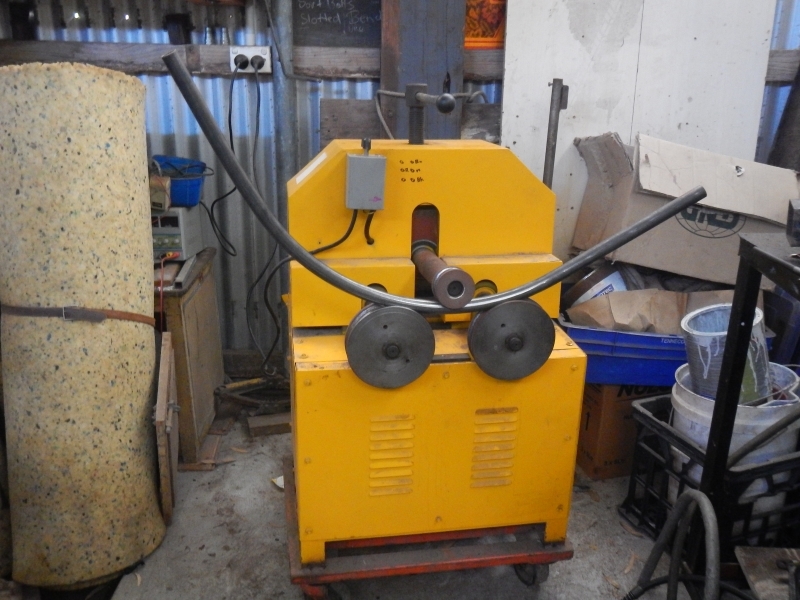 This week we are able to get back onto Lars machine. 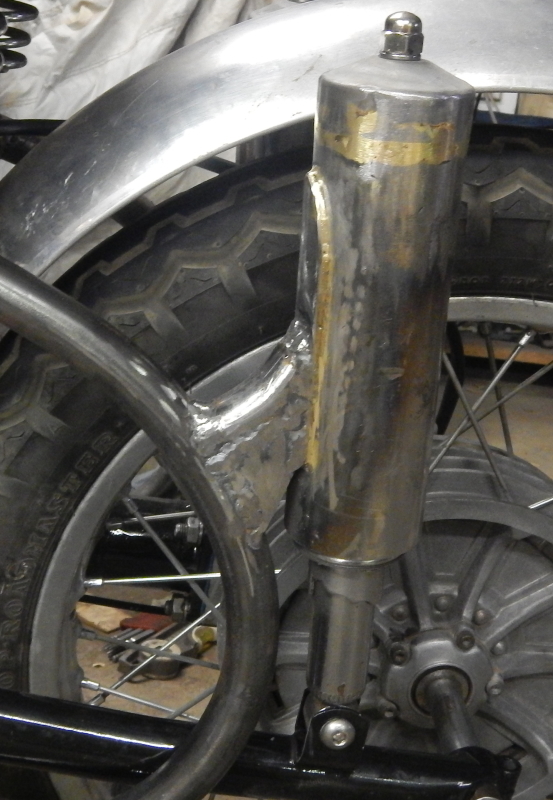 Since the last post I have also begun on the exhausts and set up the brake, but more on them later. 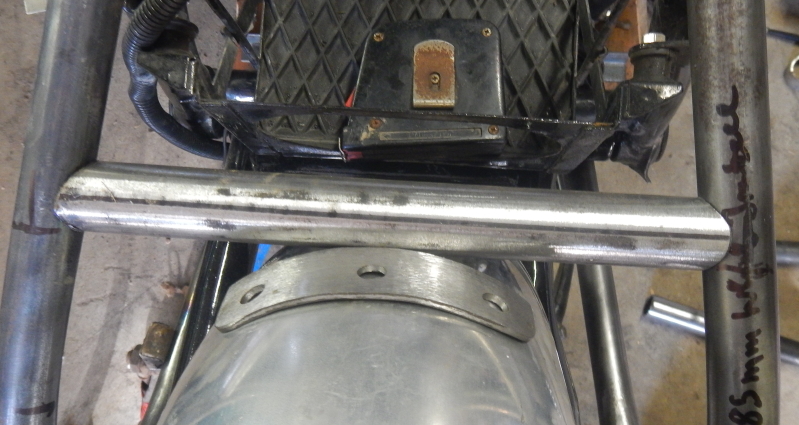 Today I continued the rear guard/taillight/number plate set up. 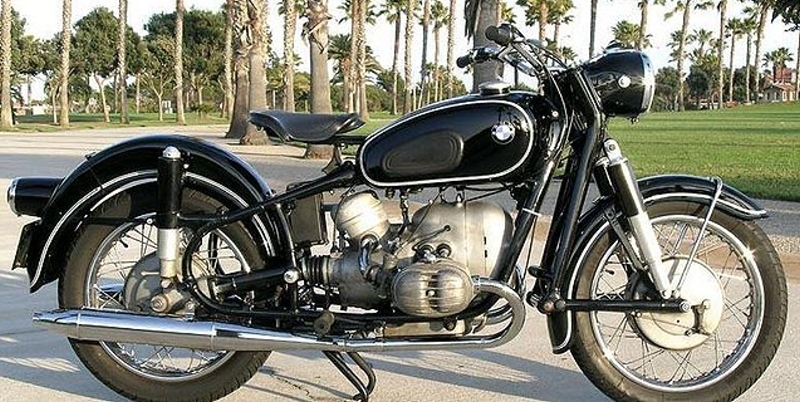 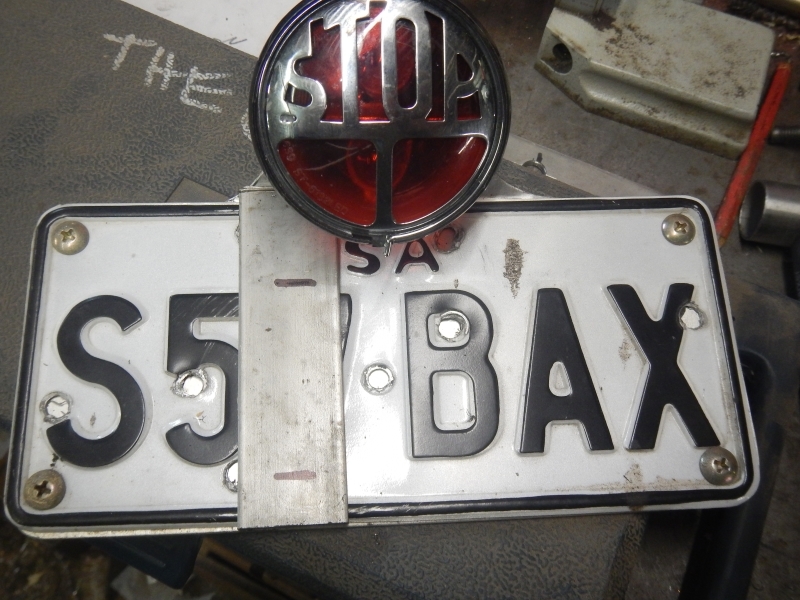 You may remember tail light and number plate were originally side mounted. 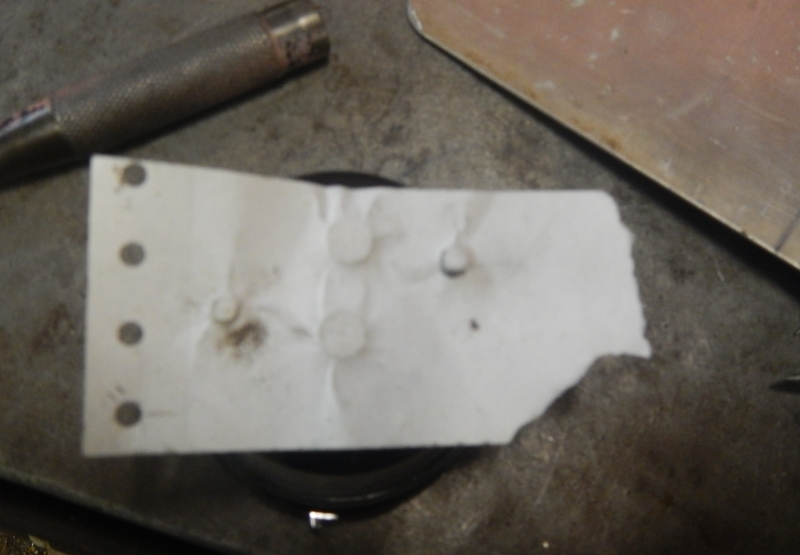 Not compliant of course and actually more trouble than they are worth from my own experience. 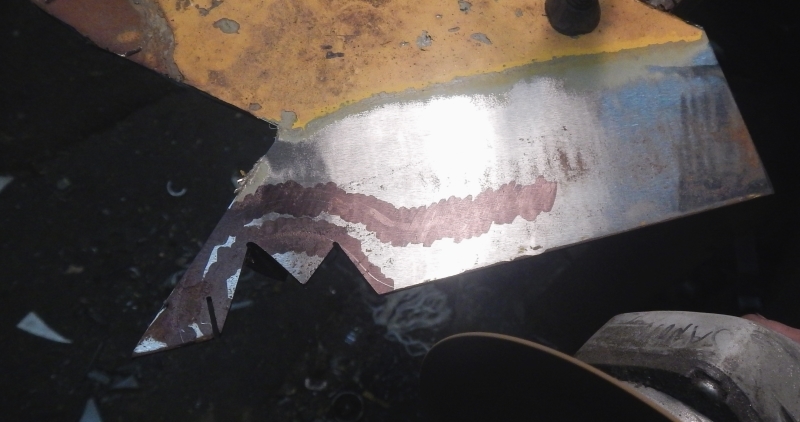 Anyway, enough of that. 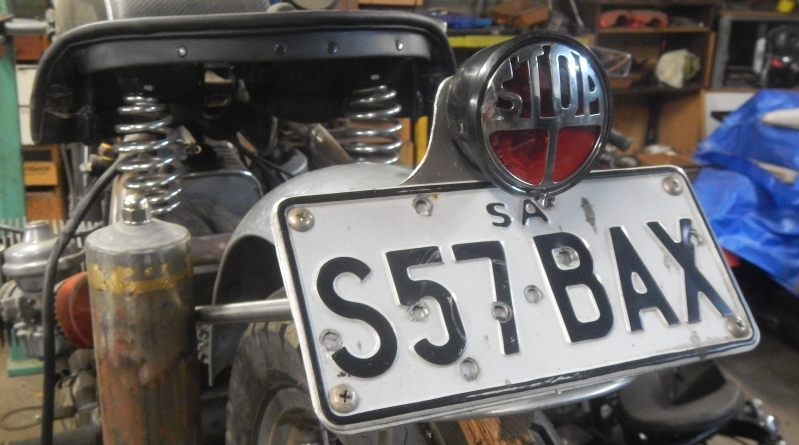 Now for taillight/number plate combo. 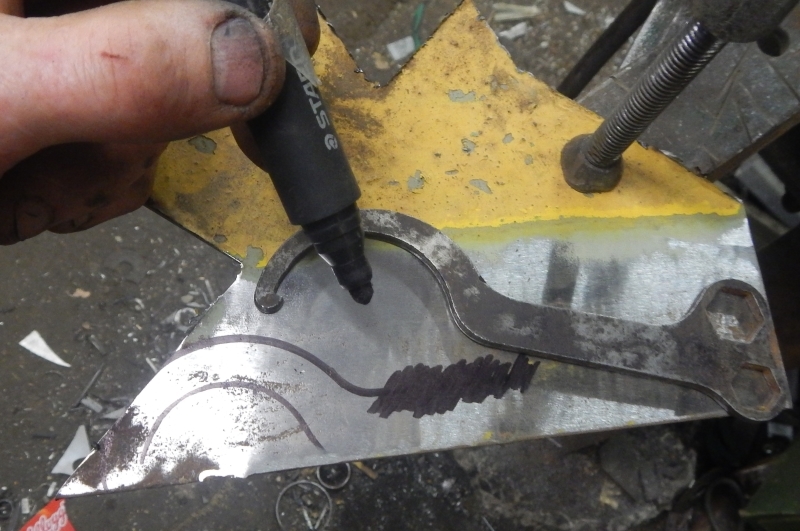 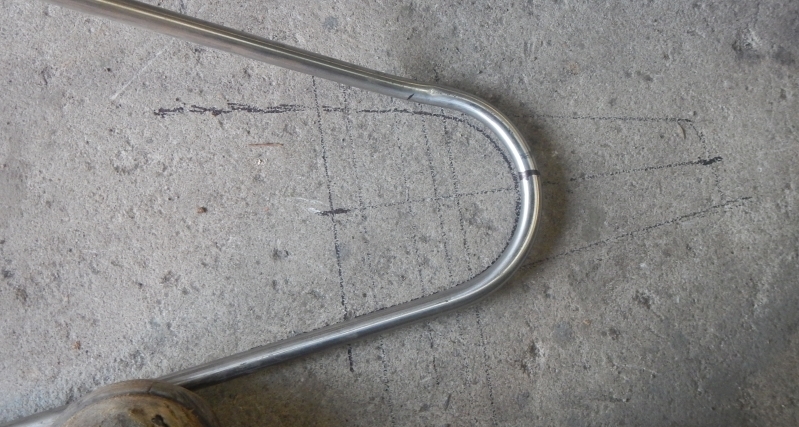 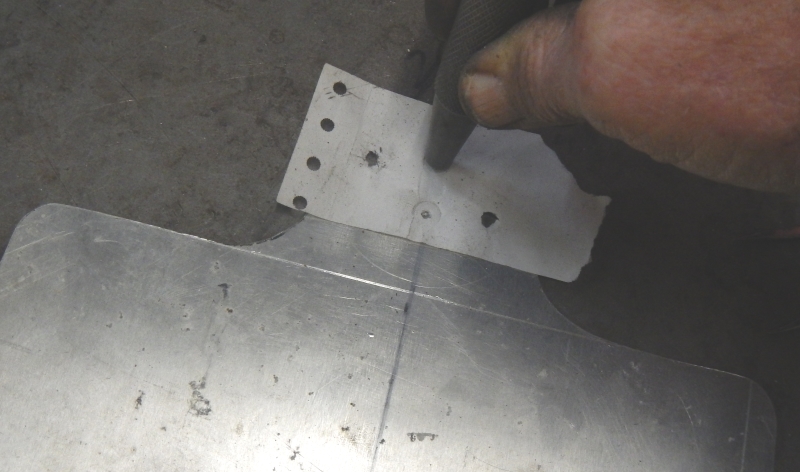 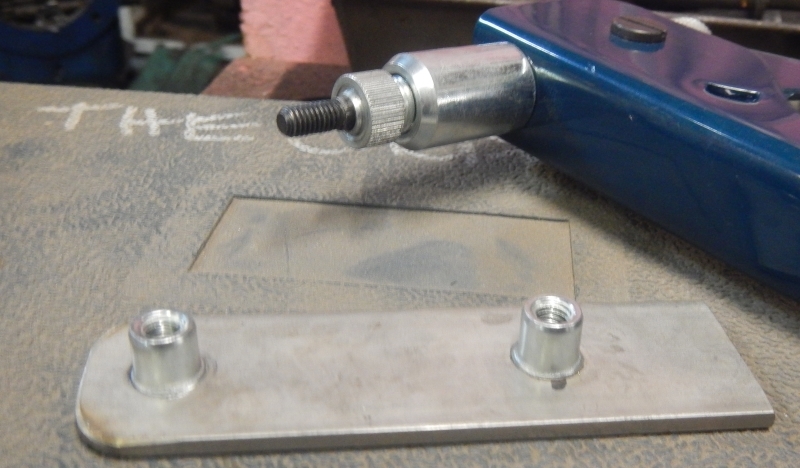 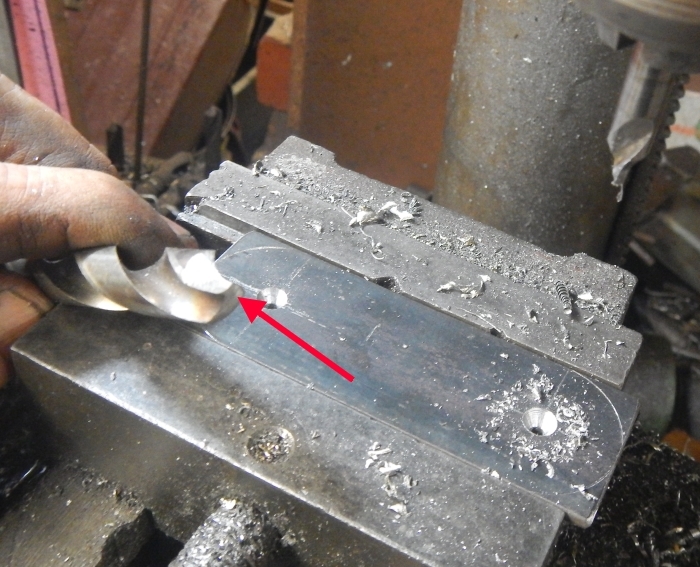 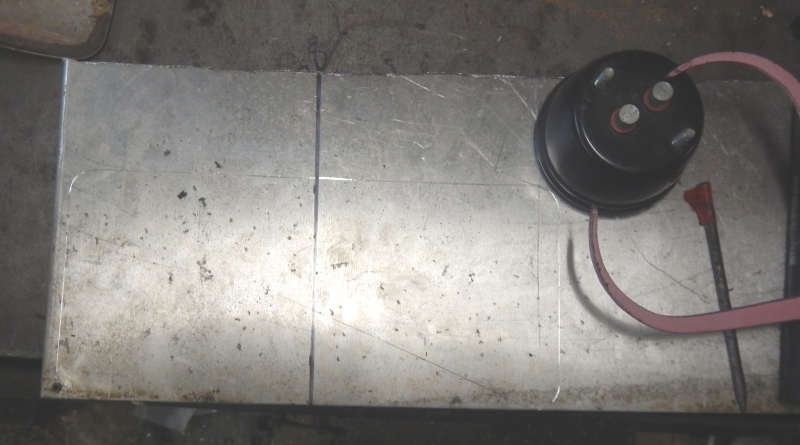 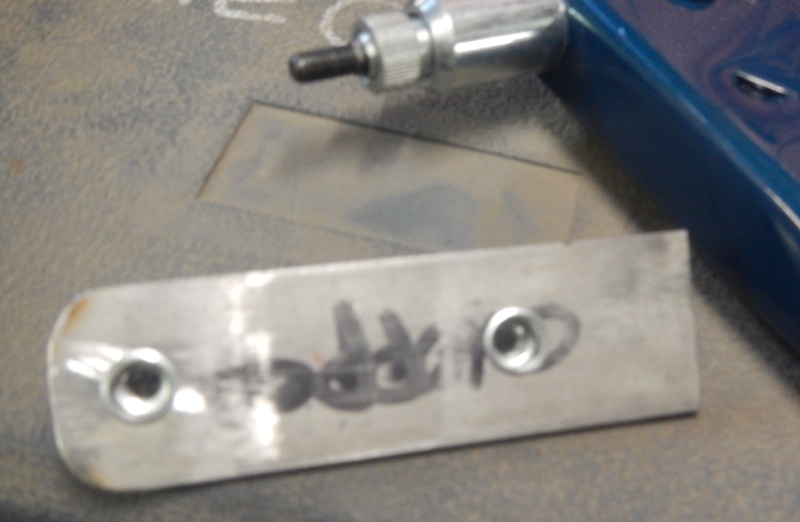 Number plate outline is traced onto 2.6mm aluminium plate. 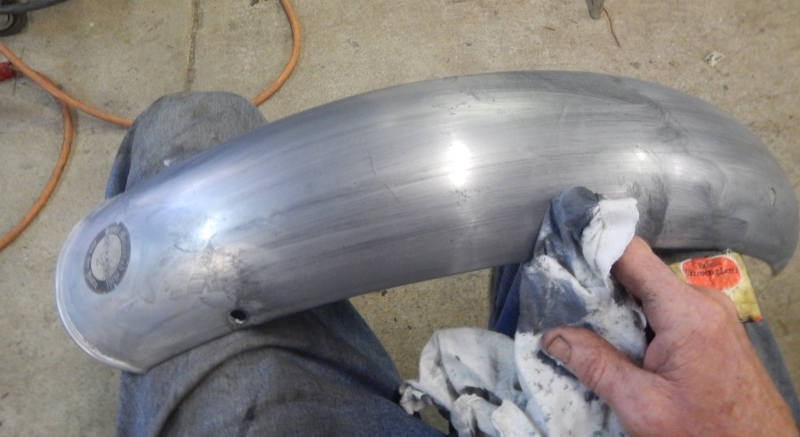 BMWs don't vibrate so I can go this thin. 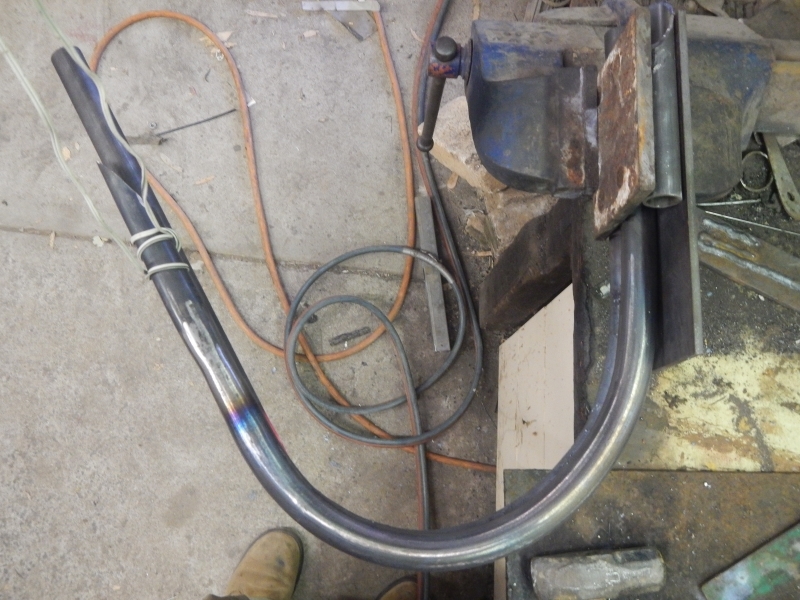 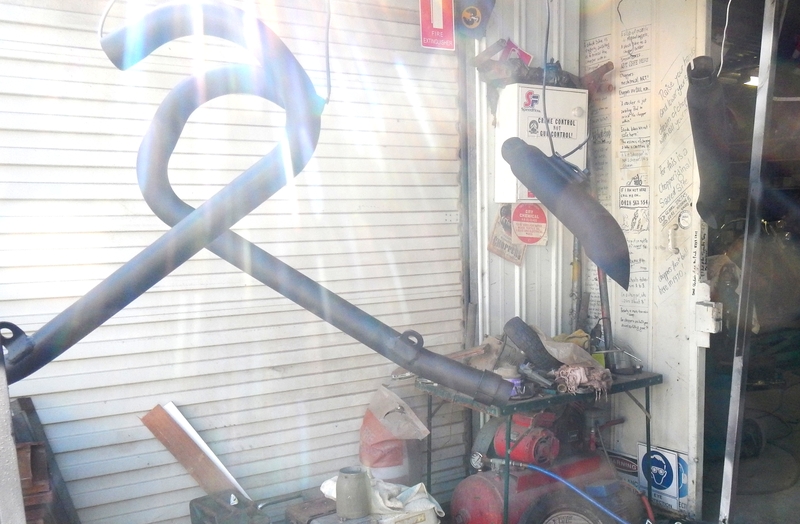 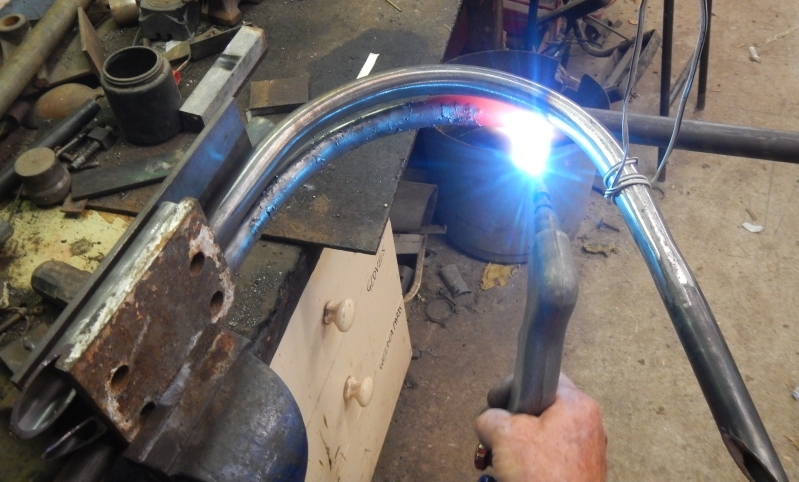 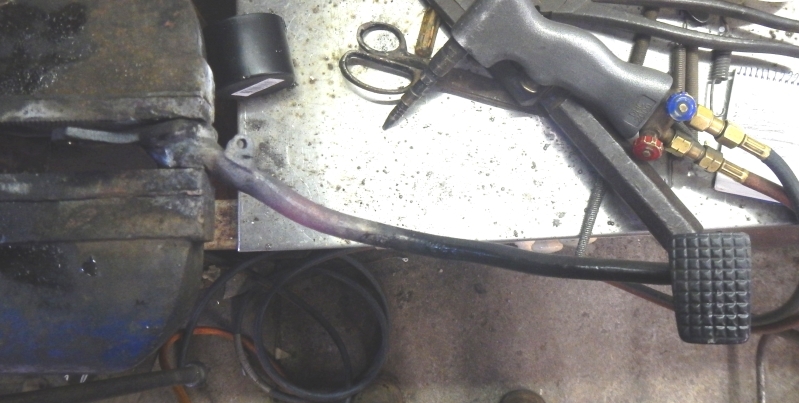 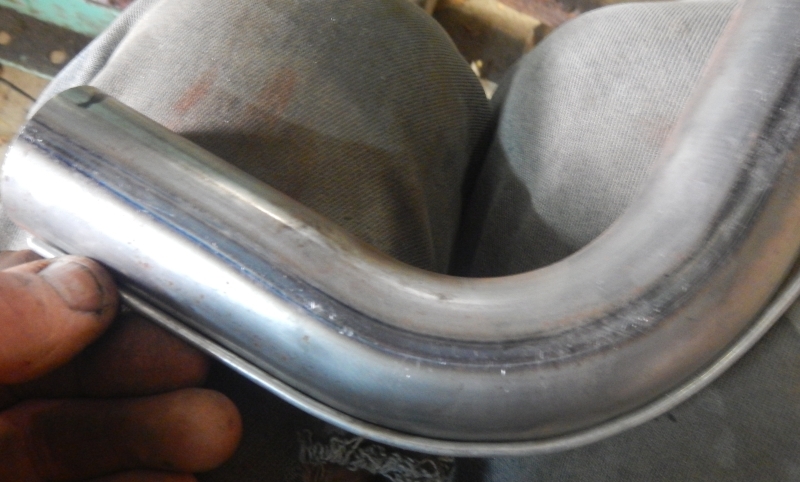 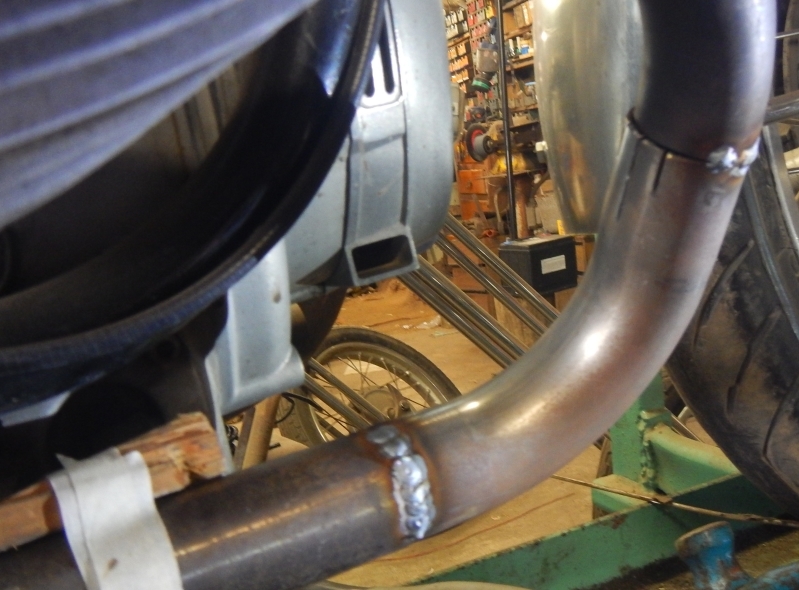 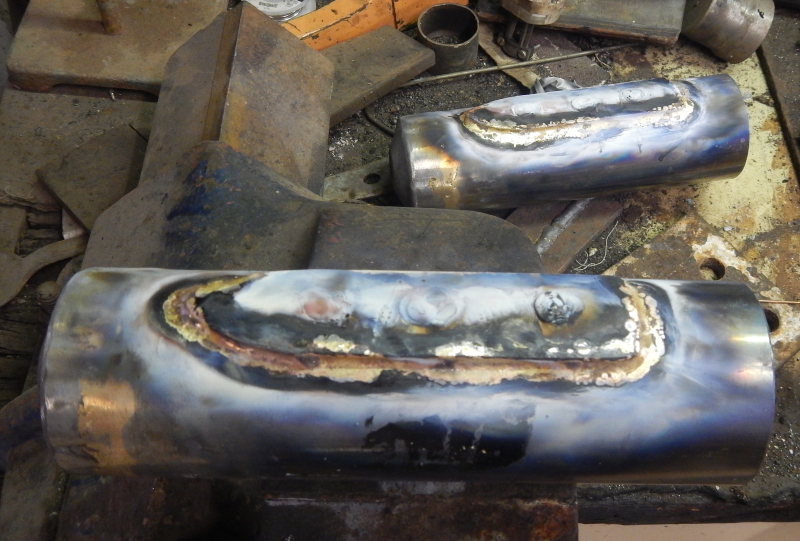 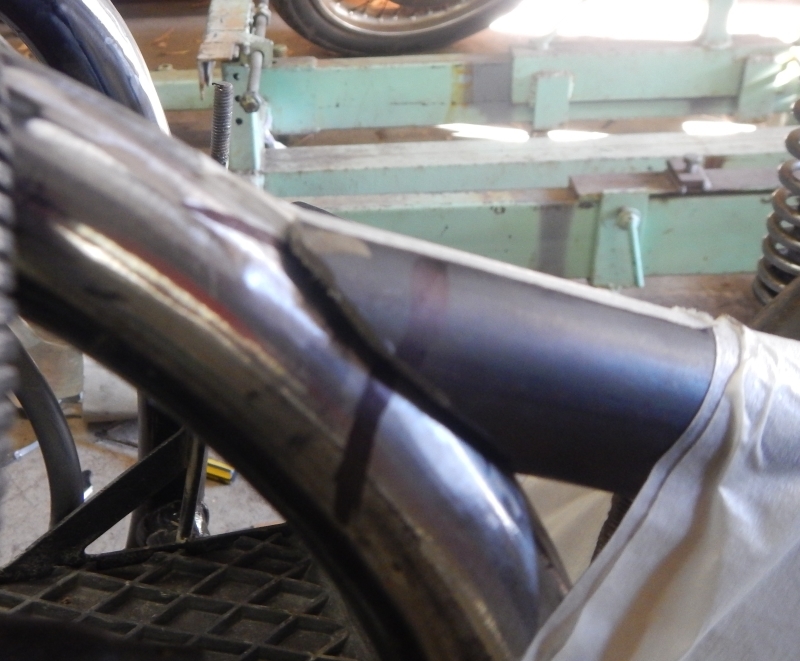 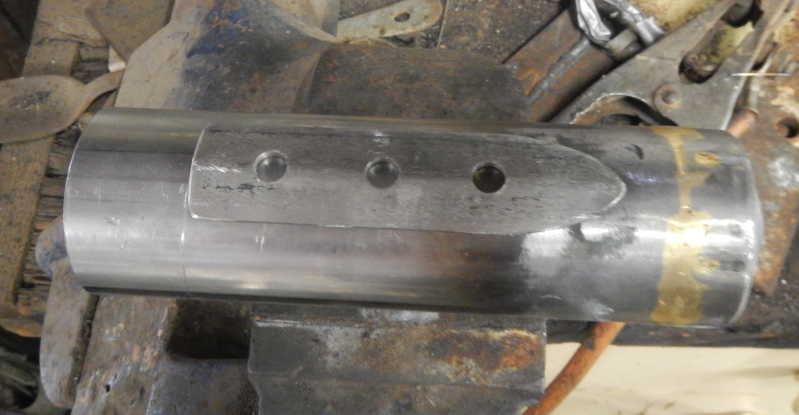 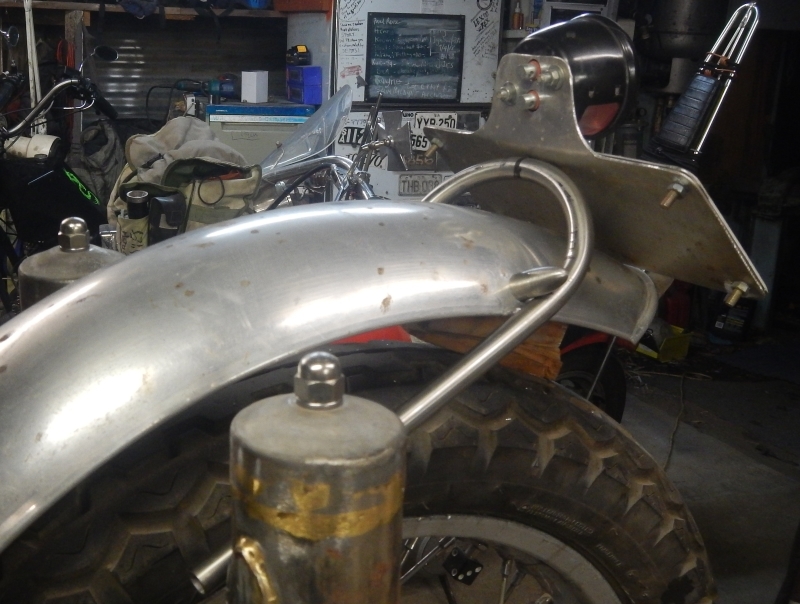 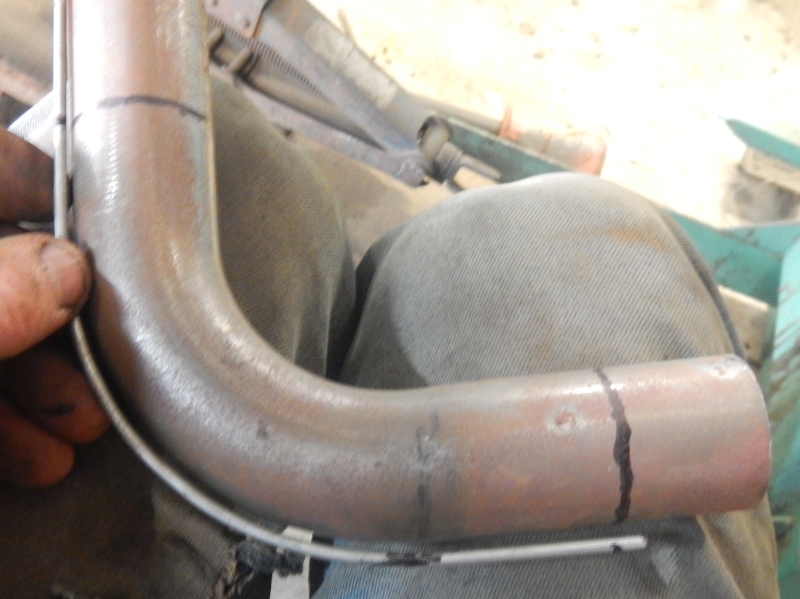 Exhausts are now welded and linished and fabrication is complete. 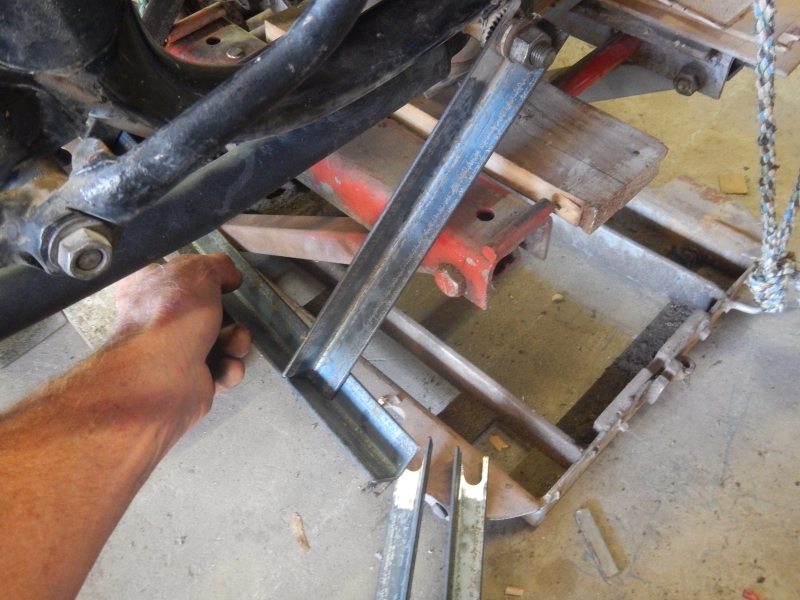 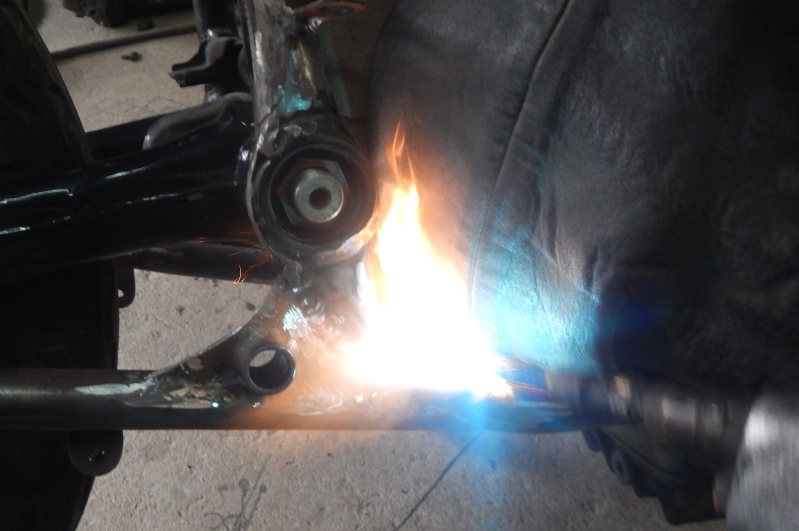 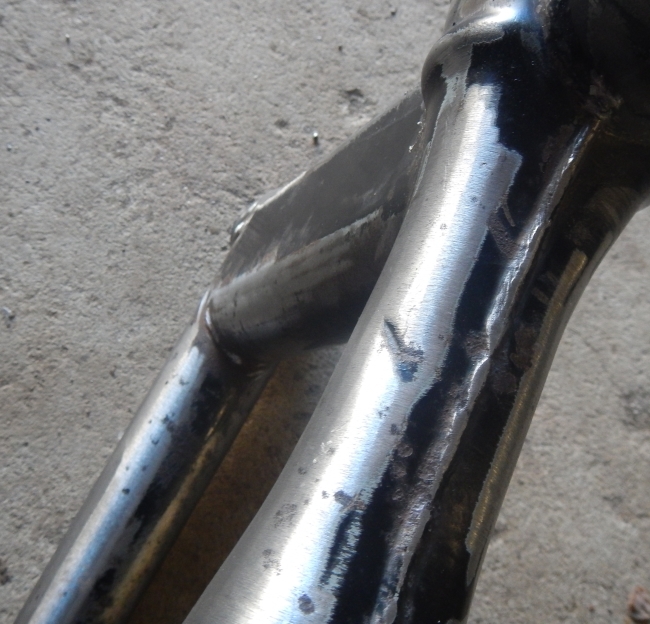 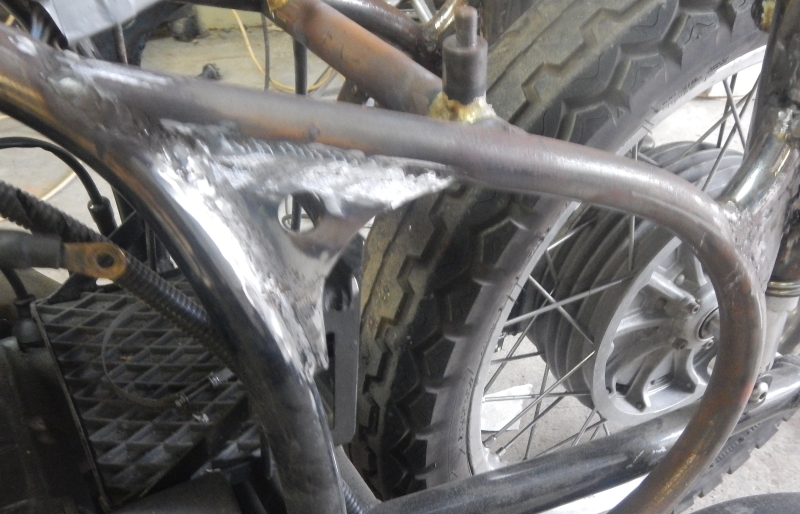 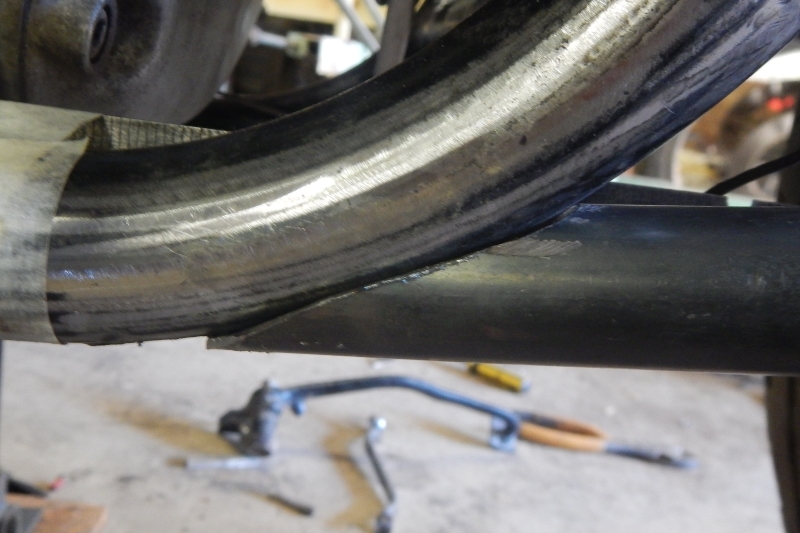 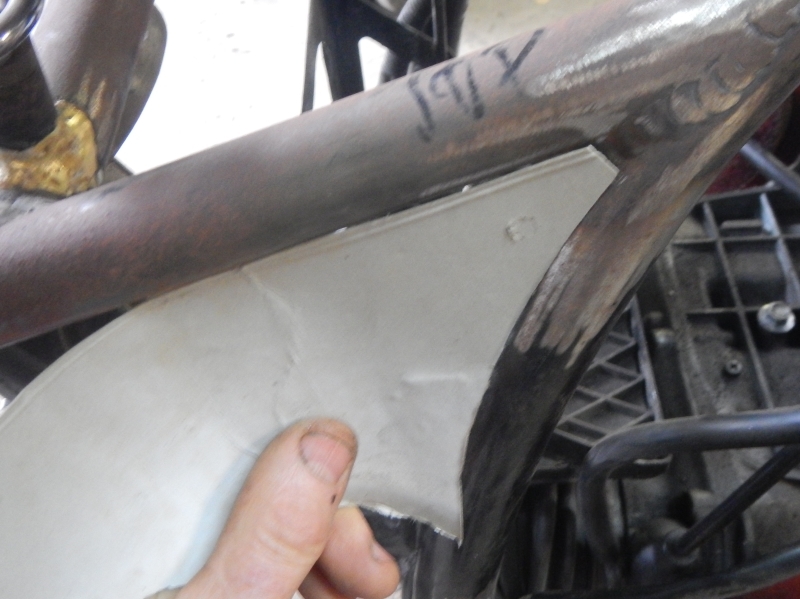 Final job is heat relieving the welds to the chrome moly frame and painting the frame. 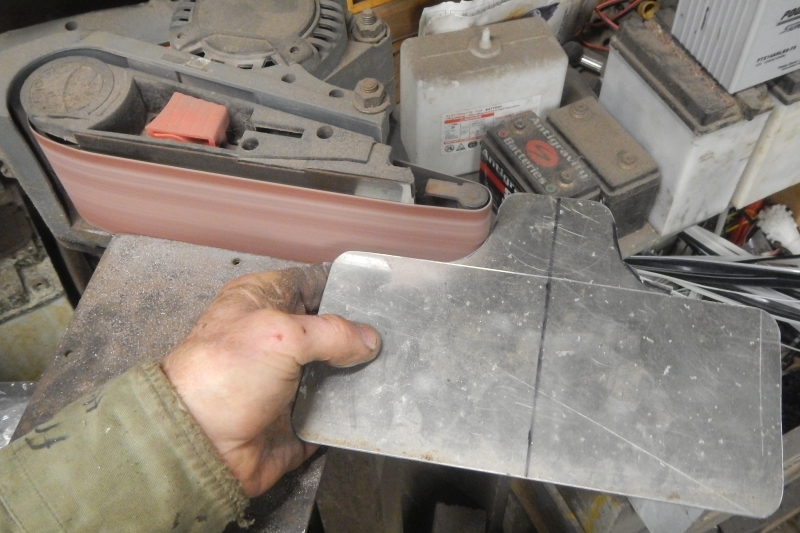 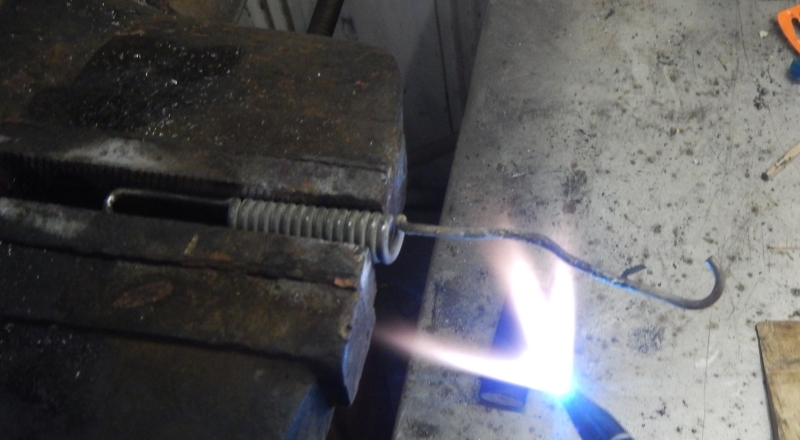 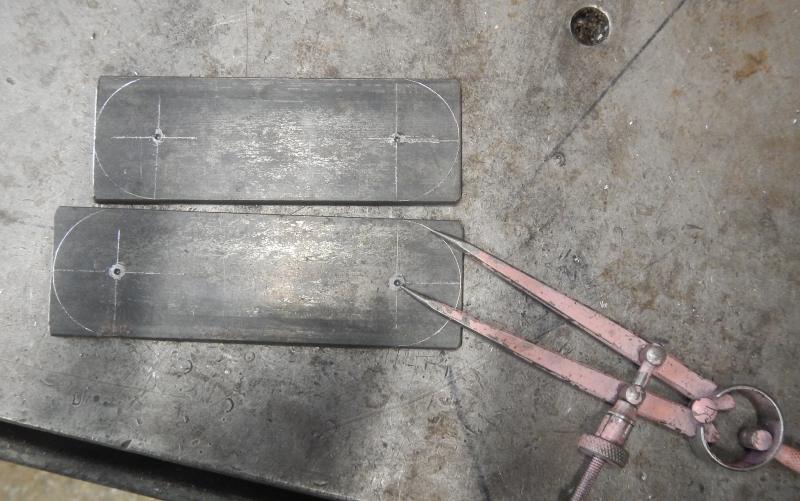 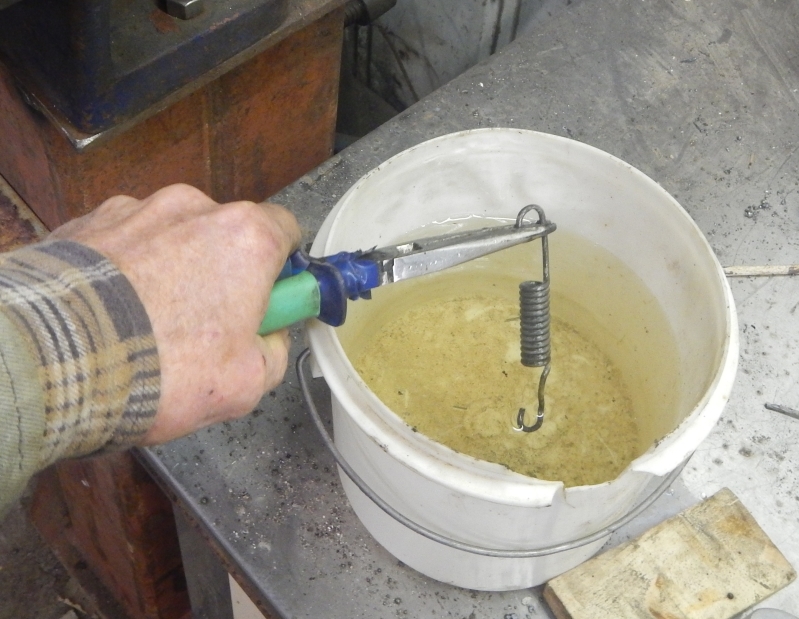 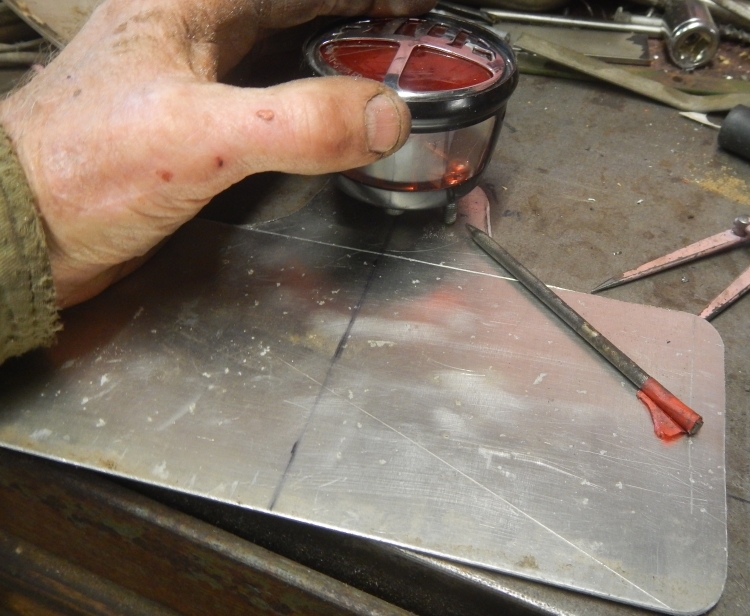 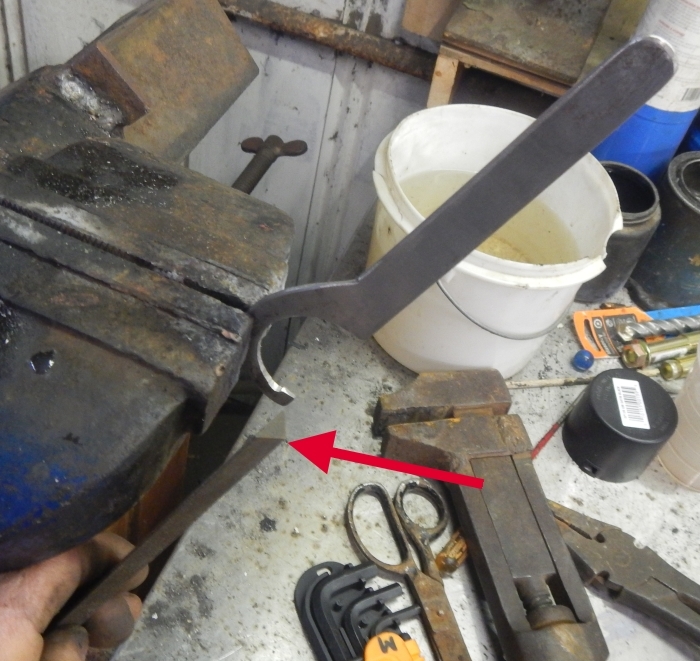 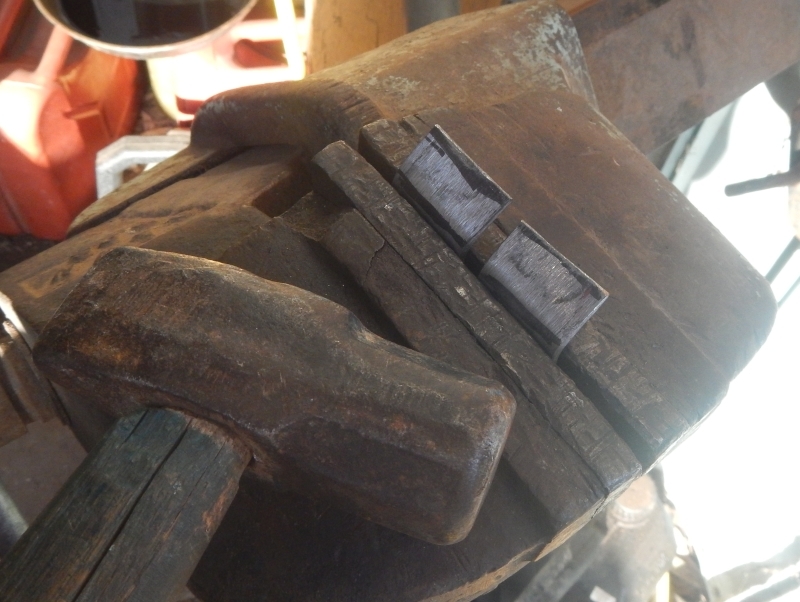 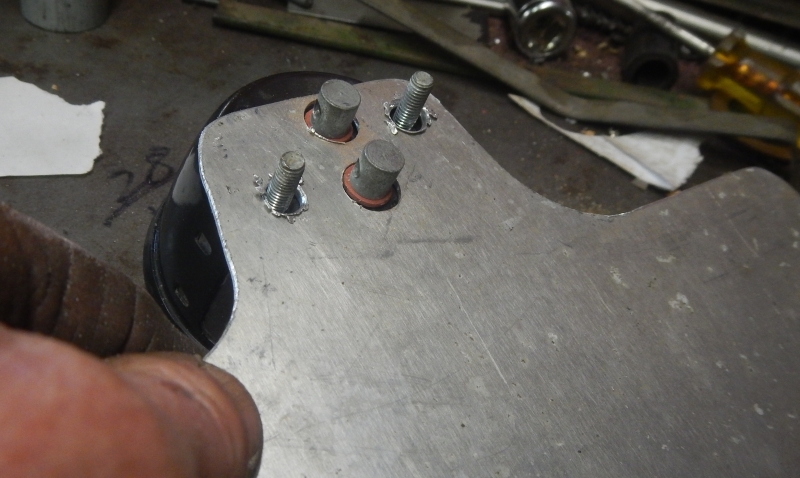 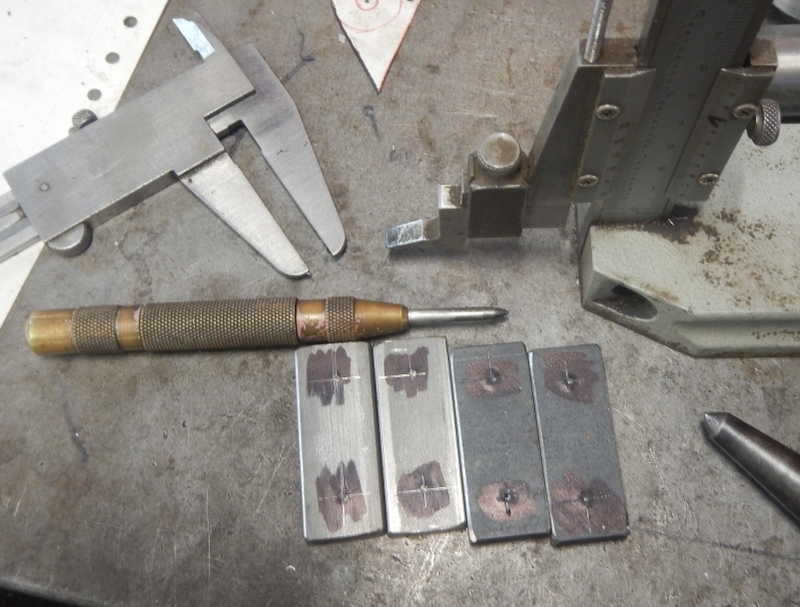 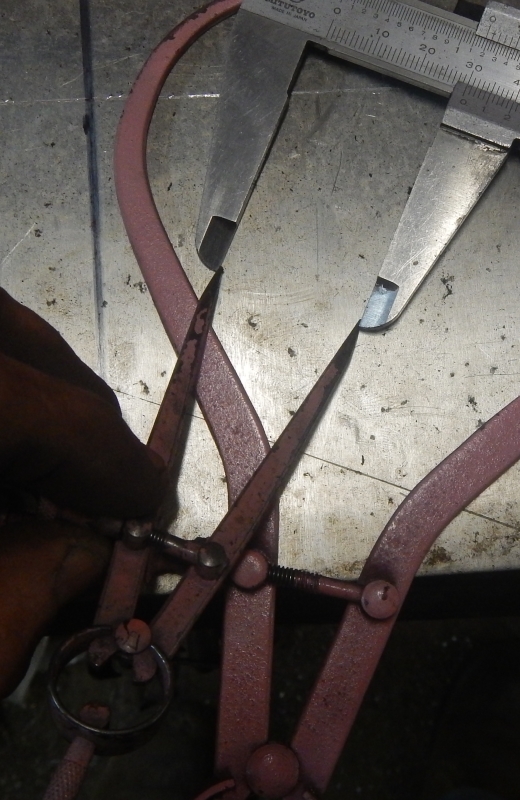 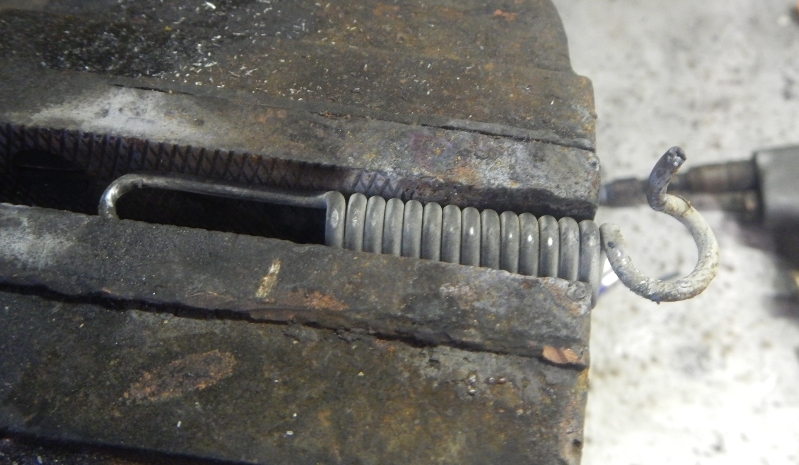 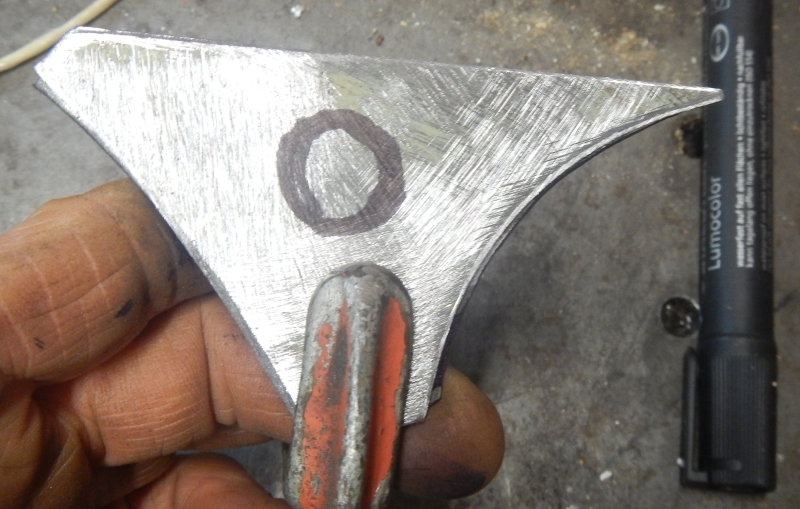 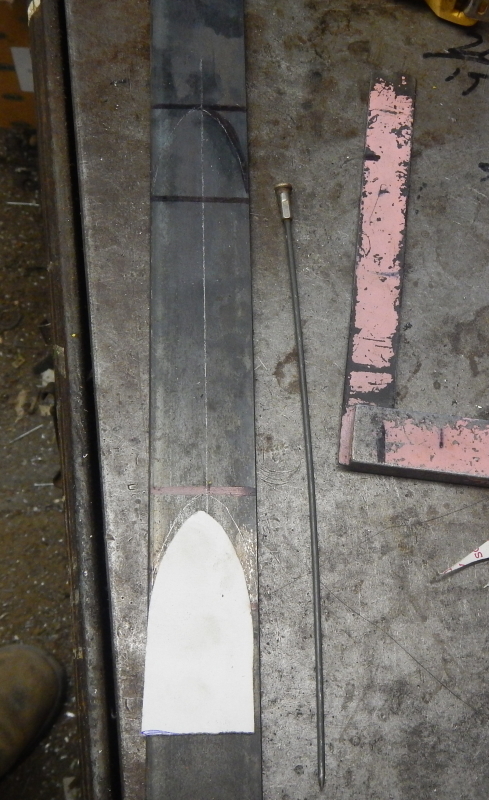 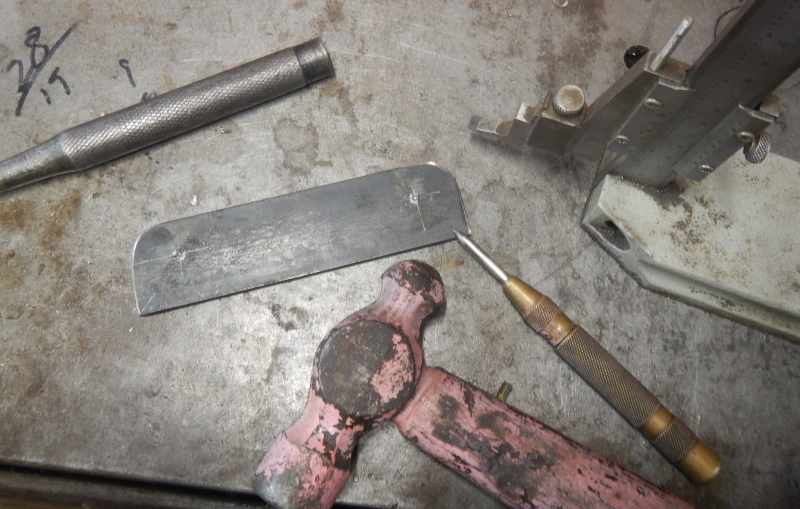 So, I will go ahead with original plan to gusset the joints... and will add some gentle heat once all done. 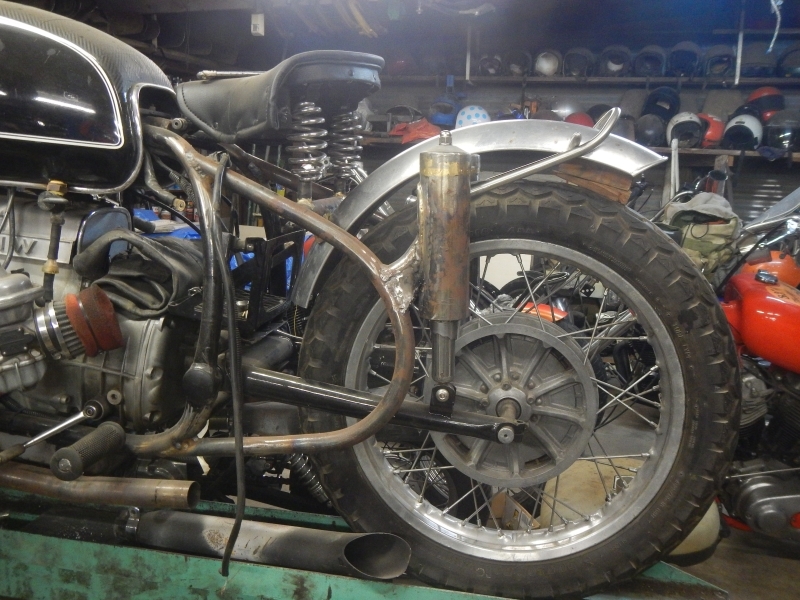 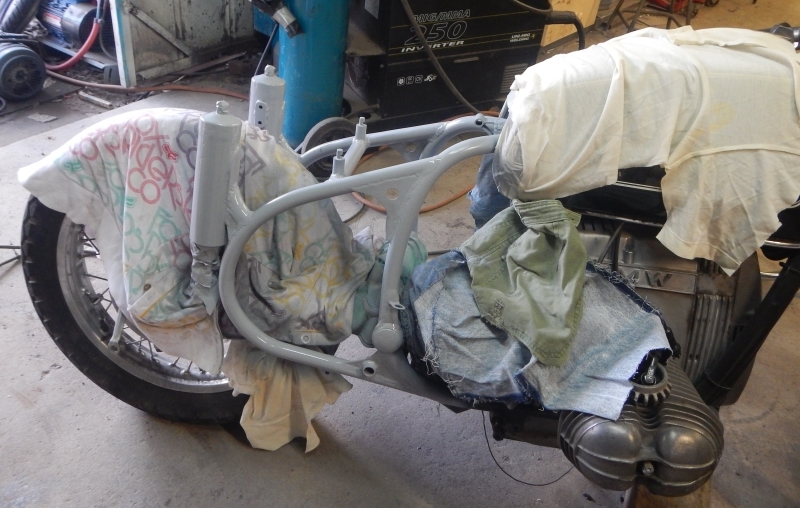 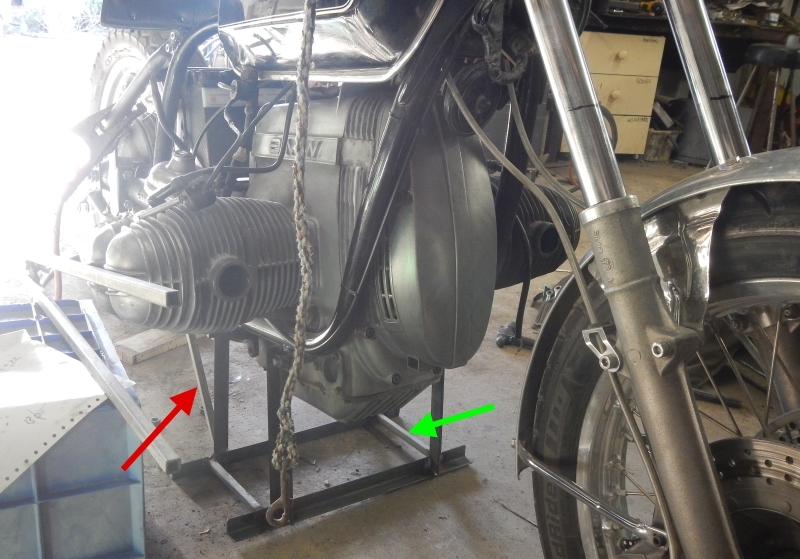 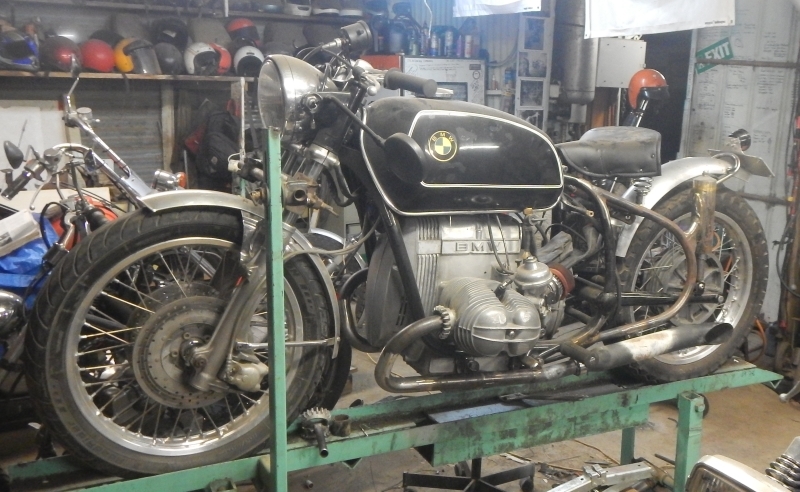 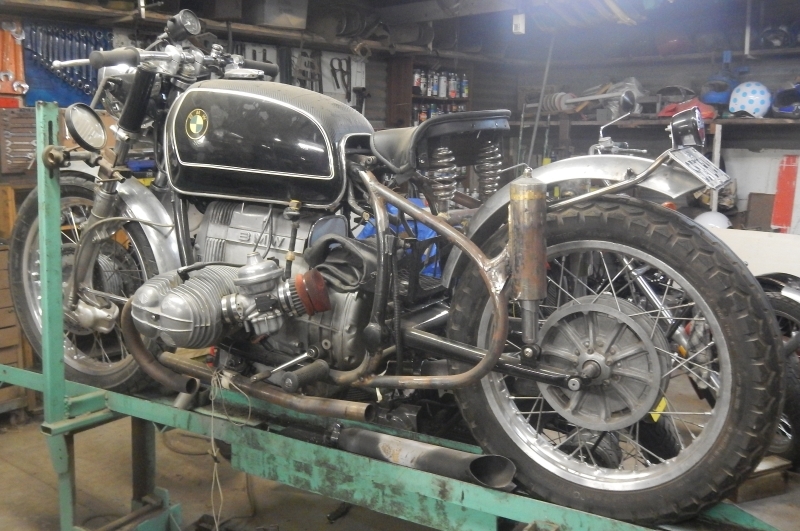 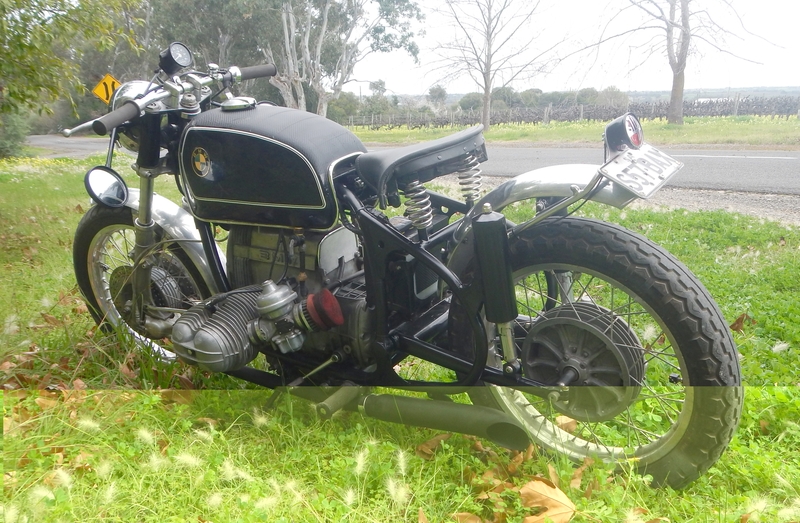 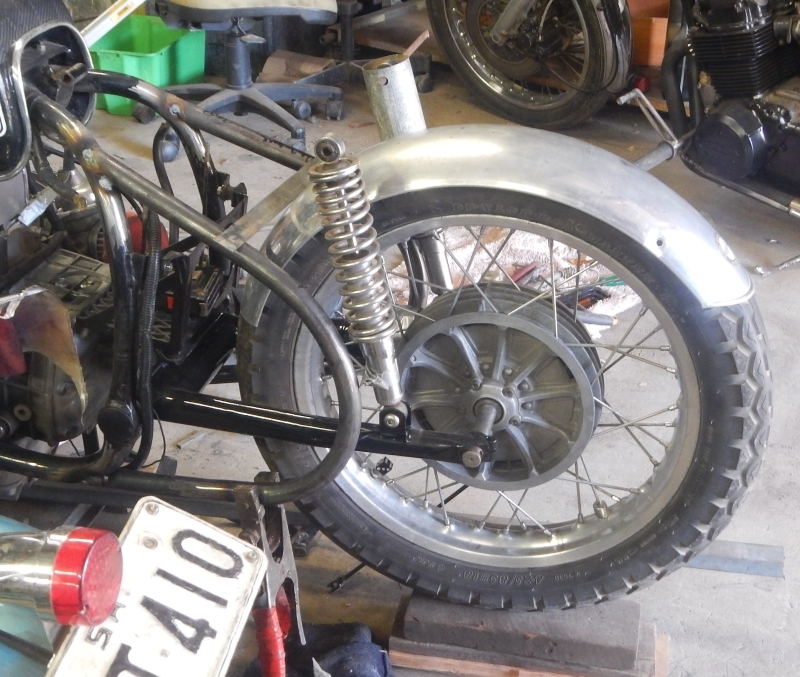 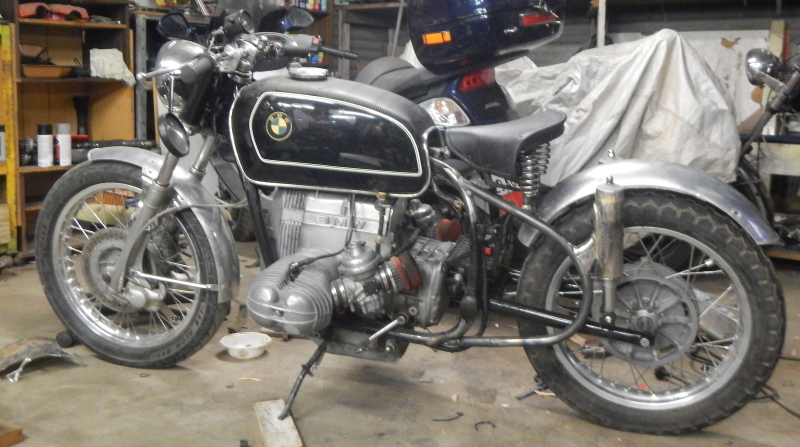 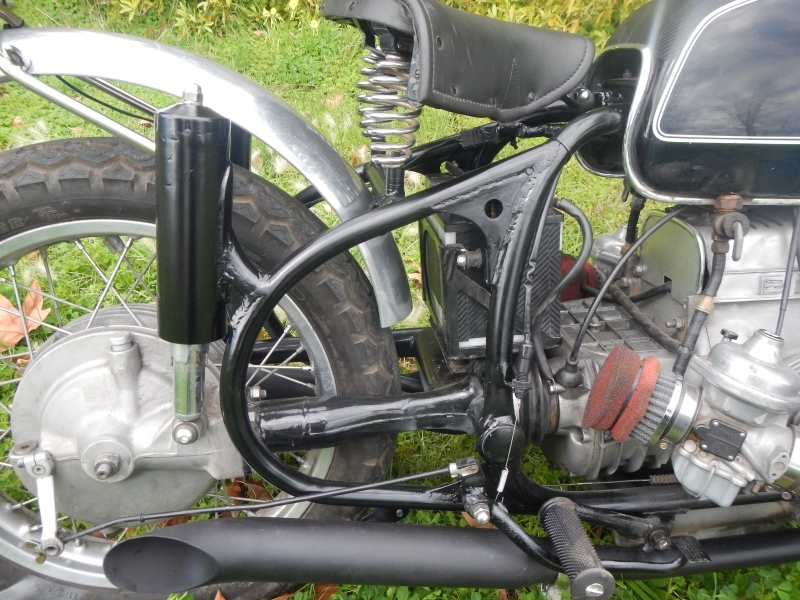 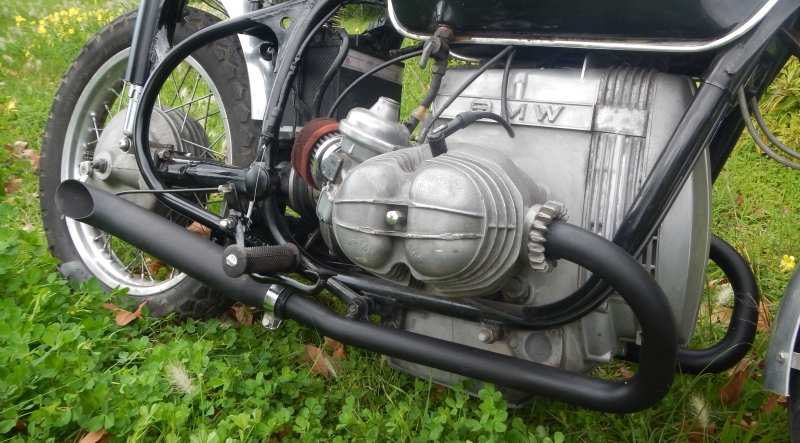 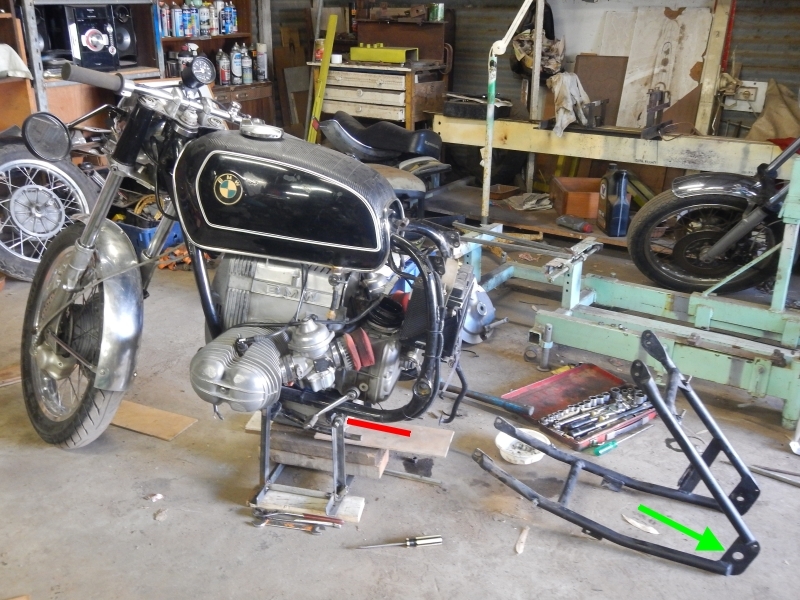 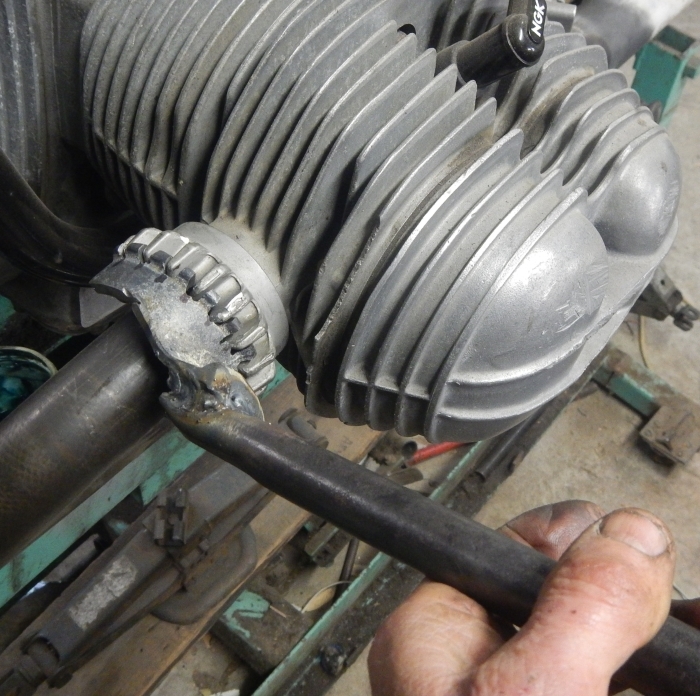 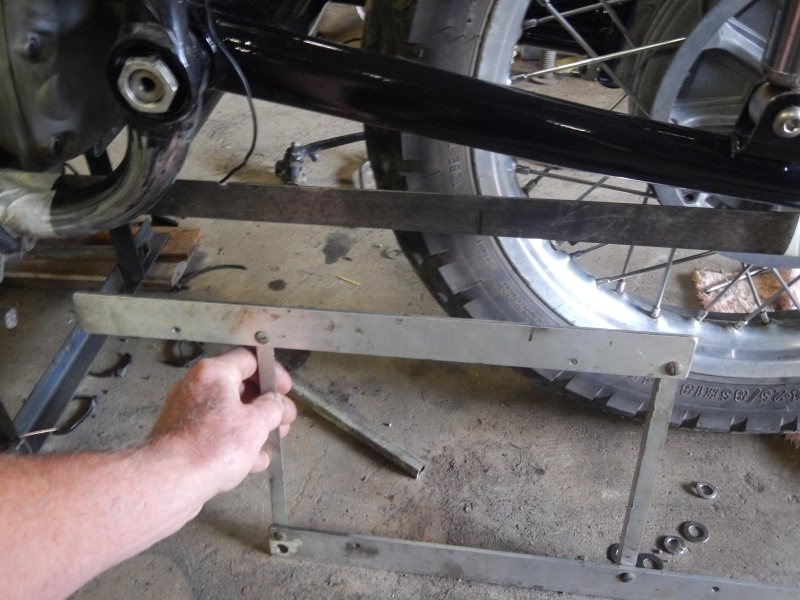 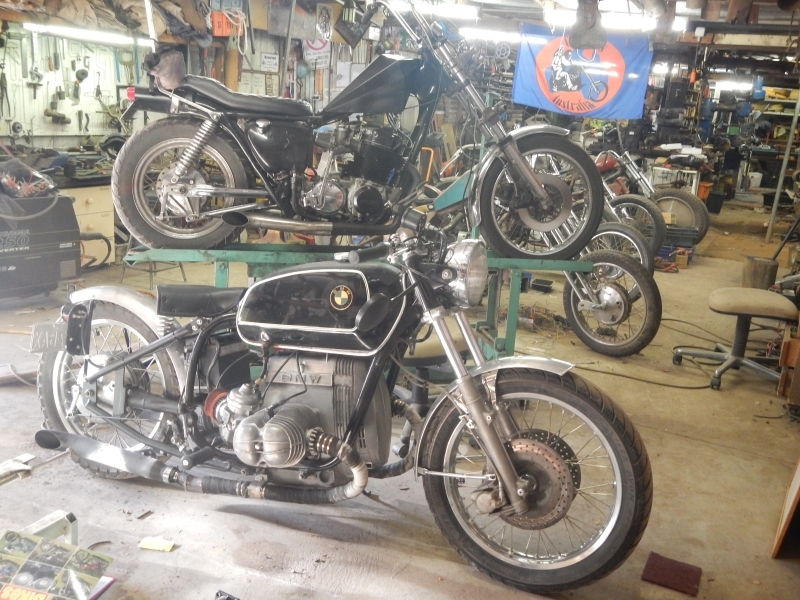 I lengthened the side stand earlier on and set the bike at the right angle, but spring needs fixing as it is too loose and falls off and the side stand has a few woofs in it as it was not worth finishing until pipes were installed and I could sort out retraction clearance. 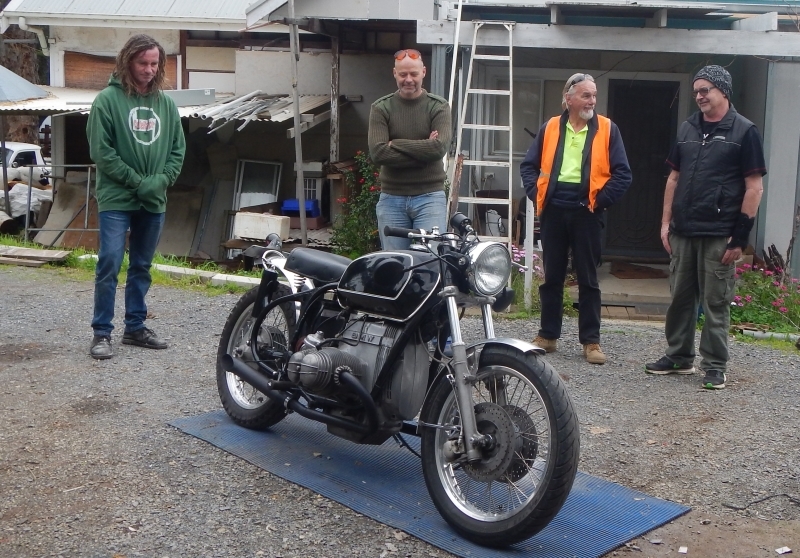 Waiting for its owner, rose among the thorns?!! 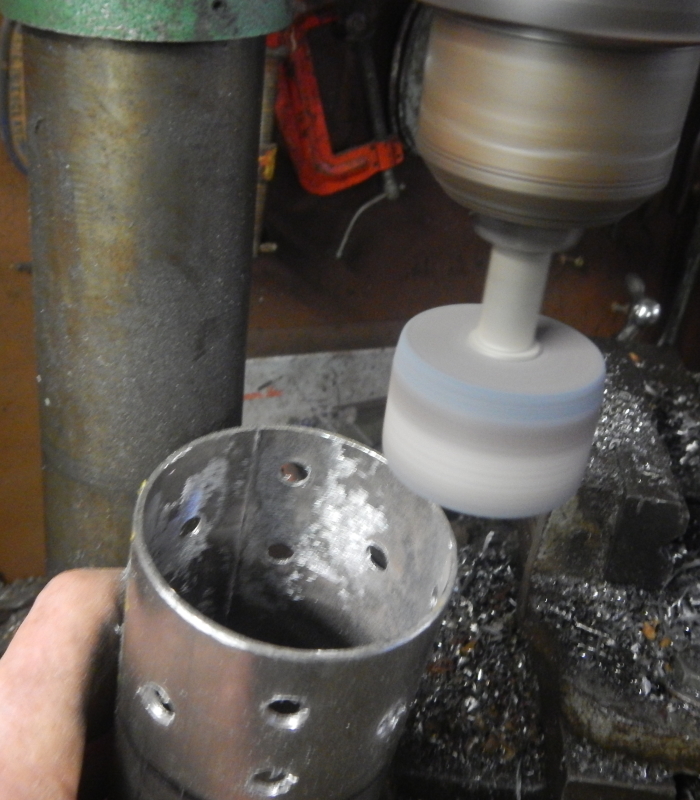 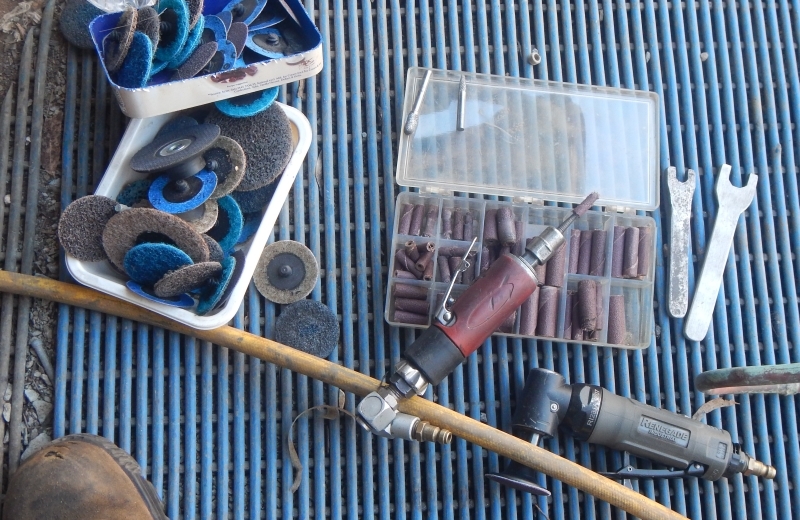 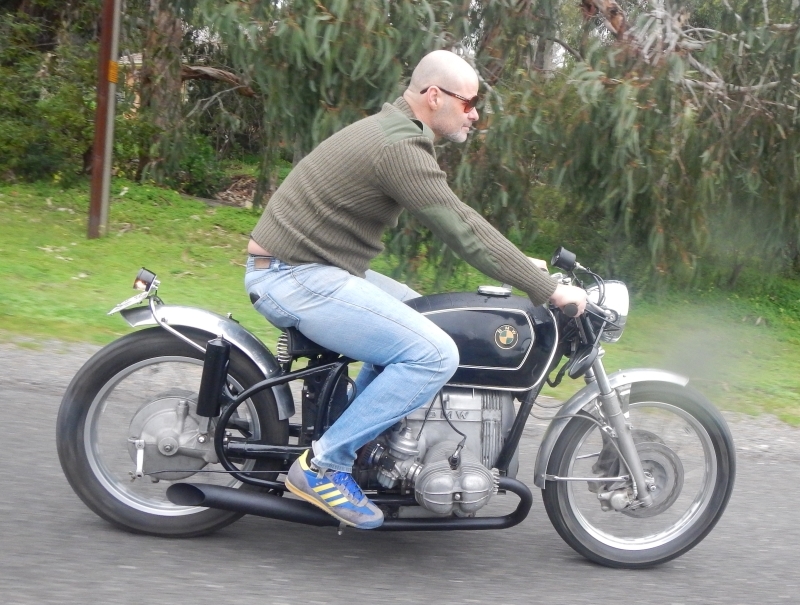 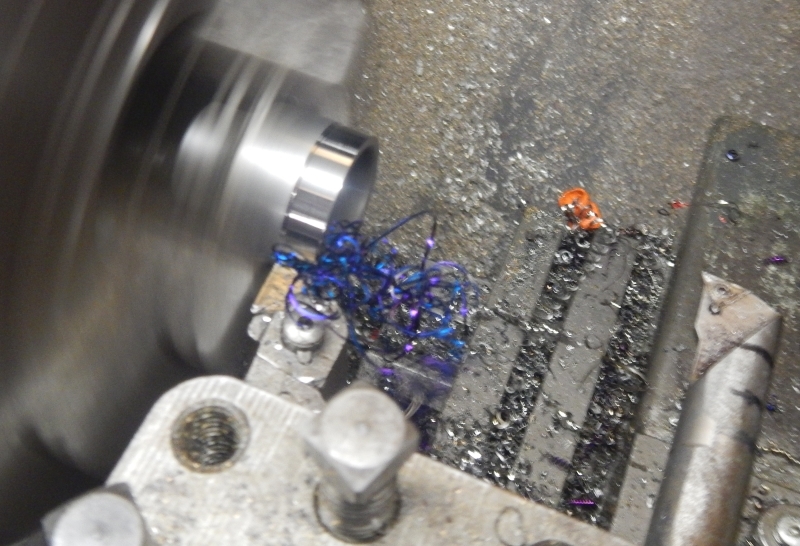 ... including a couple of spins to get some video clips (You can see one of them on Facebook)..